Want to receive immediate notification of game cancellations and other important school-related updates and information? 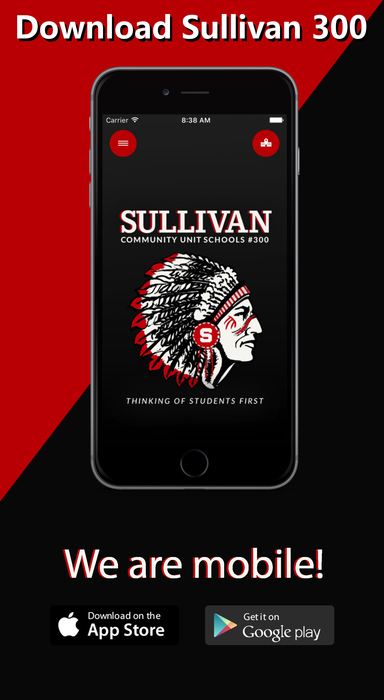 Download the Sullivan Schools app for free by searching for "Sullivan 300" in your app store! Seats are filling up for the Sullivan Singers and Singers Jr. Dessert Theatre! If you want to pick out a good spot you need to get your tickets ASAP. To purchase tickets you can now go to Country Financial and Heather Dendy will help you. The address is 625 S. Hamilton St. and they are open from 8:00 – 5:00 M‐F. (they will be closed this Friday the 19th for Good Friday) The week of Dessert Theatre the tickets will be available for purchase in the HS office. Tickets cost $10 each and can be paid with cash or a check made out to Sullivan Singers Boosters. Show times are Saturday May 4th at 7:00PM as well as Sunday May 5th at 2:00PM. Dessert will be catered by Griffins. They are bringing us 4 dessert options that all sound really yummy! Can't wait to see everyone there! 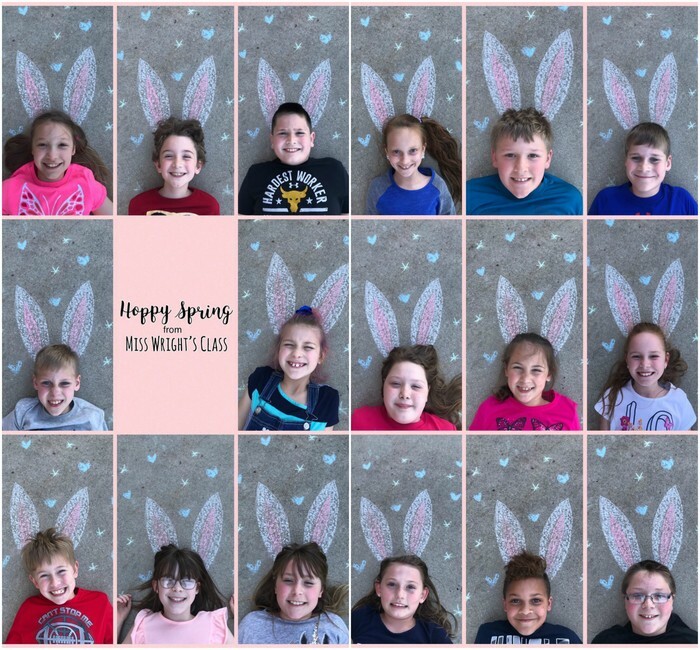 Happy Spring from Ms. Wright's class! 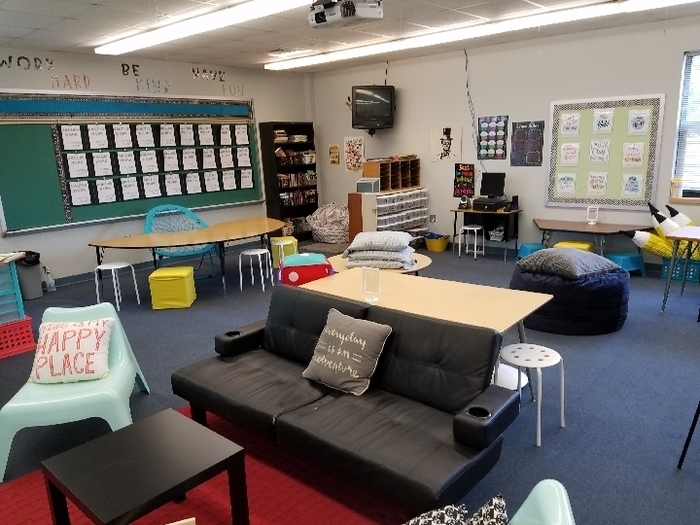 Kindergarten wrapped up “The Chocolate Touch” by rotating classrooms. 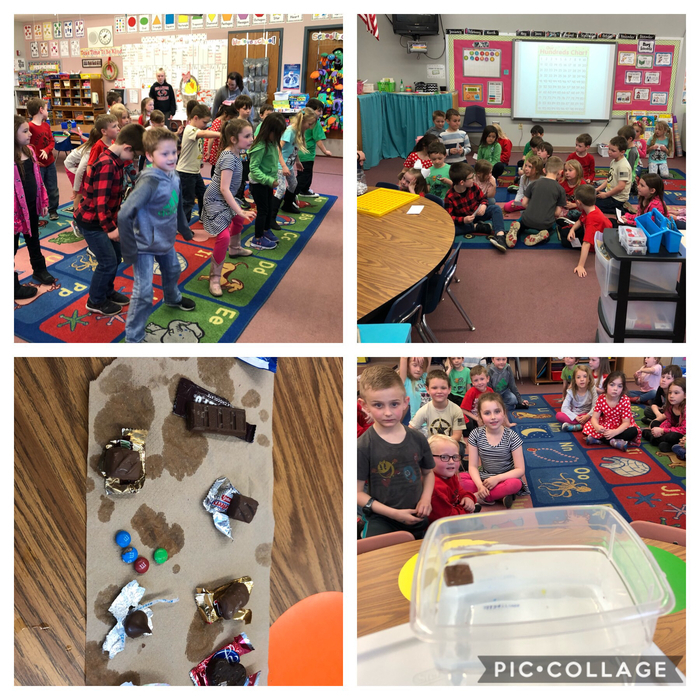 They enjoyed learning the “Tootsie Roll” dance, making estimations about how many chocolate kisses were in a jar, and making predictions about whether certain candy bars would sink or float. Lieutenant Adam Hutchinson, a friend of Mr. Campbell, took time to come and share his story and experiences with the class. Currently Lt. Hutchinson is serving on the USS Ronald Reagan in Yokosuka, Japan as a catapult and arresting gear officer (see picture). He was joined by his wife, Sam, and his three-year-old son Johnny. 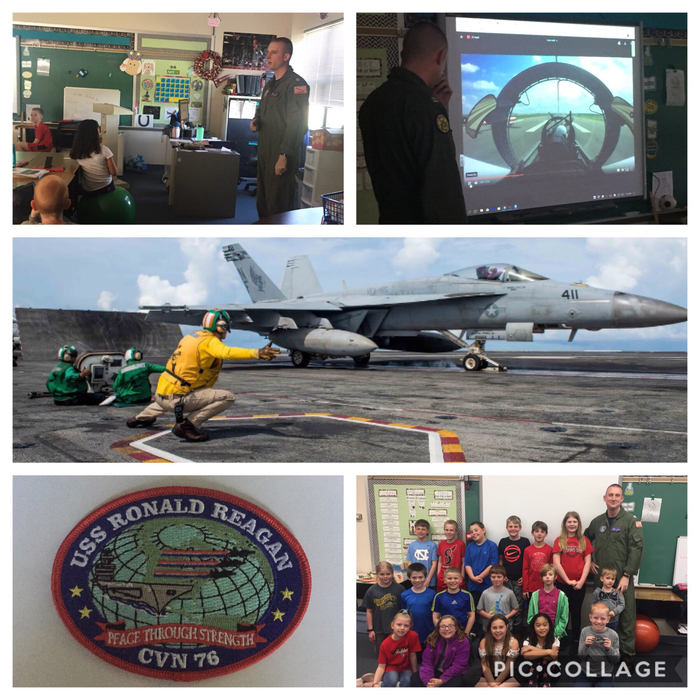 In addition to making time for a school visit he brought each student a patch from USS Reagan and some Japanese candy for all to enjoy! Thank you for your service Hutchinson family! 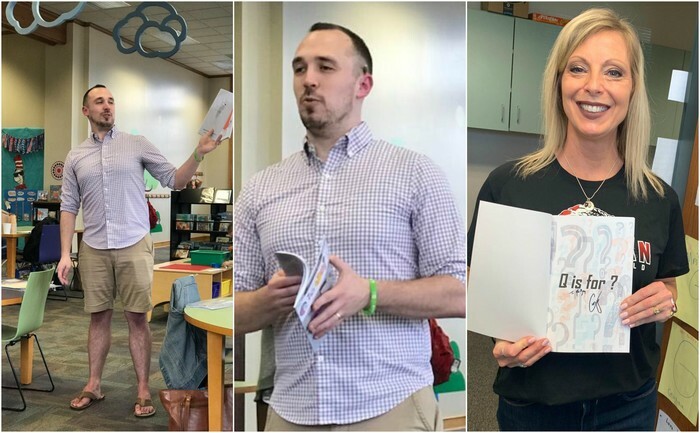 Mrs. Ray attended a book reading featuring Sullivan graduate Josh Goss at the Mattoon Public Library. Josh was reading his recently published children's book "Q is for ?." He wrote and illustrated the book. Mr. Goss, who writes under the pseudonym I.E. Guyer, is working with the not-for-profit publisher HABSAG (Help a Boy Save a Girl). Most of his books will be sent to organizations that will help get them into the hands of children who need a smile. Sullivan schools are very proud of this alumnus and the work he is doing! If interested in finding out more information about his work, visit his Facebook page at https://www.facebook.com/ieGuyer/ . This morning SES held their Chocolate Touch finale assembly. Prizes were awarded for the Candy Bar Design contest, Photo Contest, and Trivia contest. Thank you to all who participated in the On the Same Page Book Club! What sweet fun we had reading The Chocolate Touch! The SHS Softball game at St. Teresa in Decatur tonight will be one varsity game only; no JV innings will be played after. For the planners out there, here is some information on the boys basketball camps for this summer. Official information will be sent out at a later date. The SHS Baseball and Softball games scheduled for today 4/4 vs. Clinton have been postponed due to projected weather. Makeup date is TBD. In chapter 7 of our On The Same Page book, The Chocolate Touch, John Midas thinks about the delicious chocolate cream pie that is served in the cafeteria. Thanks to our wonderful kitchen staff, students at SES enjoyed some chocolate cream pie with their lunch today. Have a child entering kindgergarten next year? Then you will need to attend the Kindergarten Kickoff on Tuesday, April 9th at 6 p.m. at SES! This is a PARENTS ONLY event that starts the registration process and gives you important information regarding what you need to do to have your child start school. You will also have the opportunity to meet some of the school staff and check out the classrooms! The SHS varsity baseball game scheduled for today 3/25 with Argenta in Sullivan has been cancelled due to field conditions. Earlier this week at the Illinois State Board of Education, a group testified to the necessity of music education and arts education in Illinois schools. Thanks to Chip Staley (ArtSpeaks), Darcy Nendza (Executive Director of ILMEA), Joy Hippensteele (The Music Shoppe) and Sullivan Elementary's Courtney Leach (ILMEA District 5 President) for being great advocates today; encouraging ISBE to adopt the arts indicator as part of the #essa plan. SHS Varsity Baseball defeats Neoga 2-1 in varsity baseball; improves to 1-1 on the season. Congratulations Redskins! SHS Varsity Softball defeats Cerro Gordo Bement 20-5 to open the softball season! 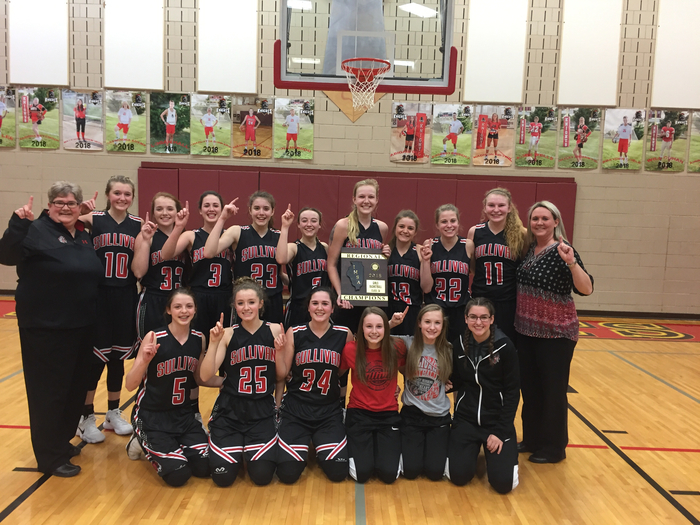 Congratulations Lady Redskins! 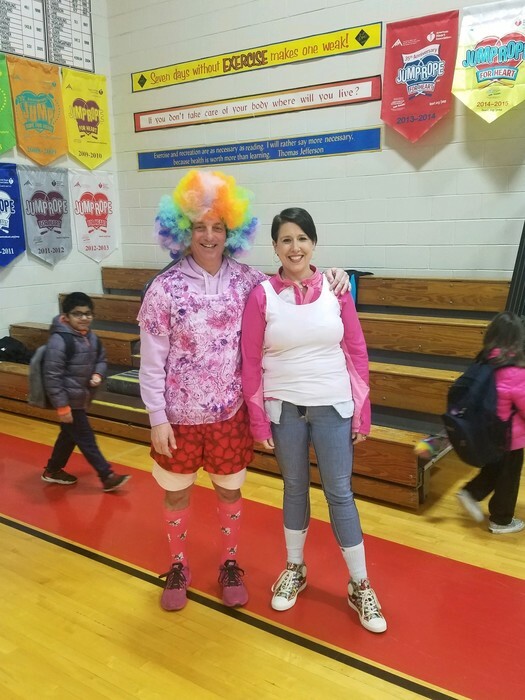 Coach Typer and Mrs. Leach kept their promise to dress up if students met their goal for Jump Rope for Heart, though Coach dresses like this everyday. The SHS Varsity Baseball game at Mattoon scheduled for today 3/15 has been postponed to 3/16 at 1:00 PM in Mattoon. 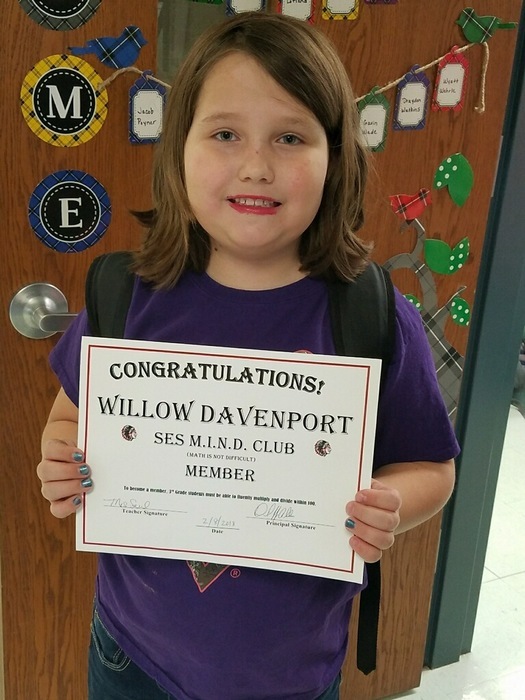 Congratulations to the newest 3rd grade members of the MIND Club (Math Is Not Difficult)! 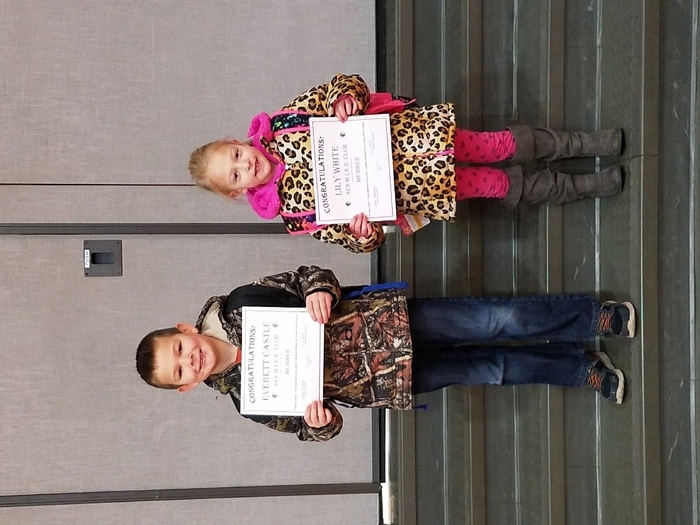 Congratulations to the newest 1st grade members of the MIND Club (Math Is Not Difficult)! 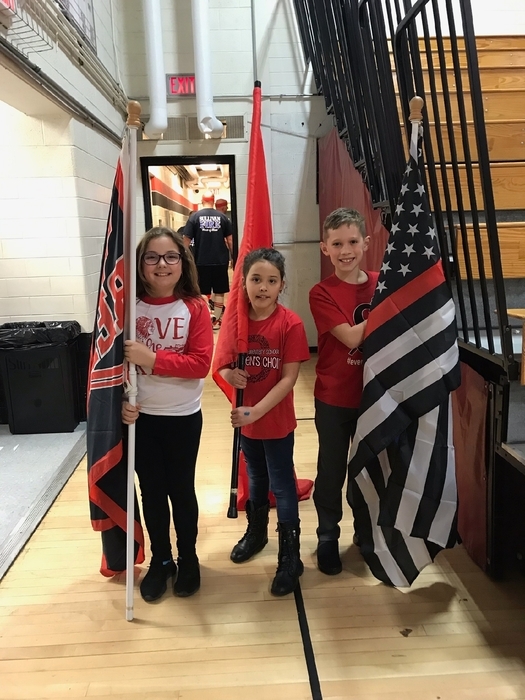 As a result of showing respect, Caleigh Dyer, October Artrip, and Carter Standerfer were chosen to lead the Police Department and Fire Department onto the court before the Battle of the Badges. Great job students! Come and cheer for your favorite team during the Battle of the Badges. They are all heroes, but only one will win the game. Will it be the Sullivan Police Department or the Sullivan Fire Department that claim the title? Join us for a fun evening, beginning at 6 p.m. on March 14th in the high school gym. 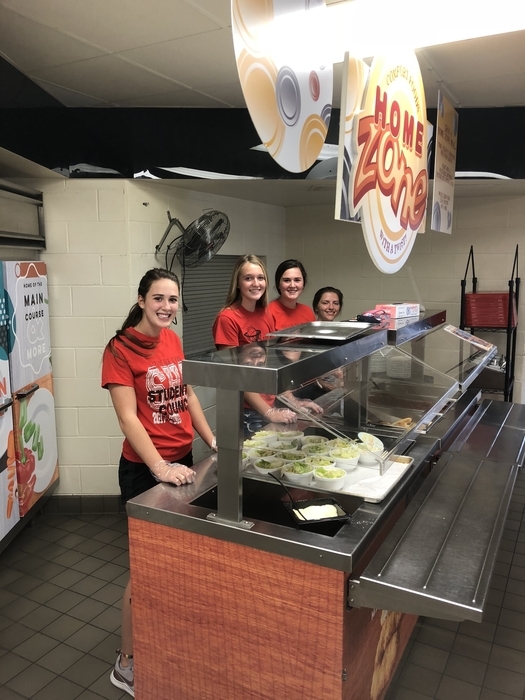 A hot dog supper will precede the game at 5 p.m. with proceeds going to prom in the High School Commons. This event is free for all to enjoy! Lots of fun things happening including a 50/50 drawing, SES staff cheerleaders and more! All proceeds from the game will go to the Sullivan PTO and their efforts to support SES students and staff. Donations are appreciated and accepted at the door. 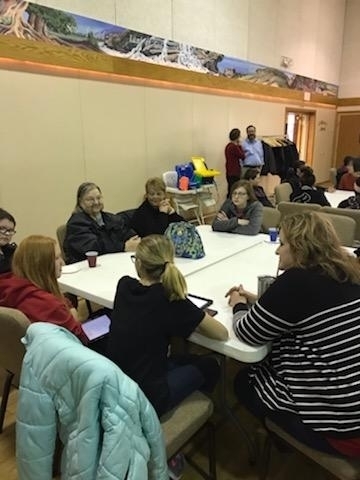 Students who read and logged at least 4 Illinois Bluestem Award nominated books were invited to a voting party. They were treated to breakfast pizza and doughnuts with blue icing. 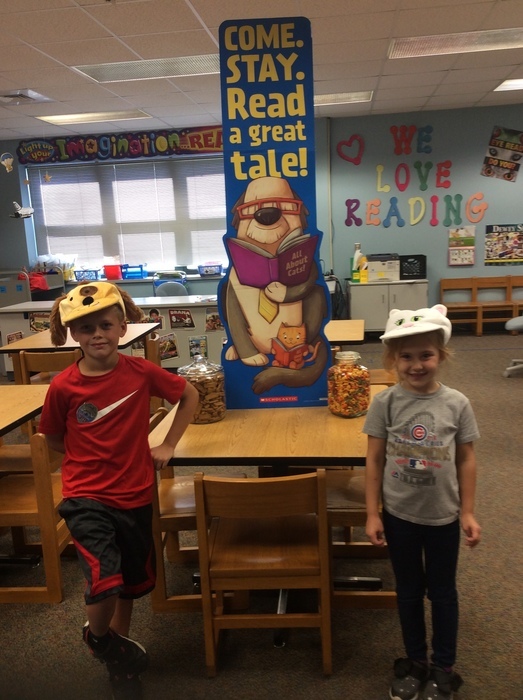 After they voted for their favorite Bluestem nominated books. Twenty books were carefully chosen by the Association of Illinois School Library Educators and are nominated for the award. 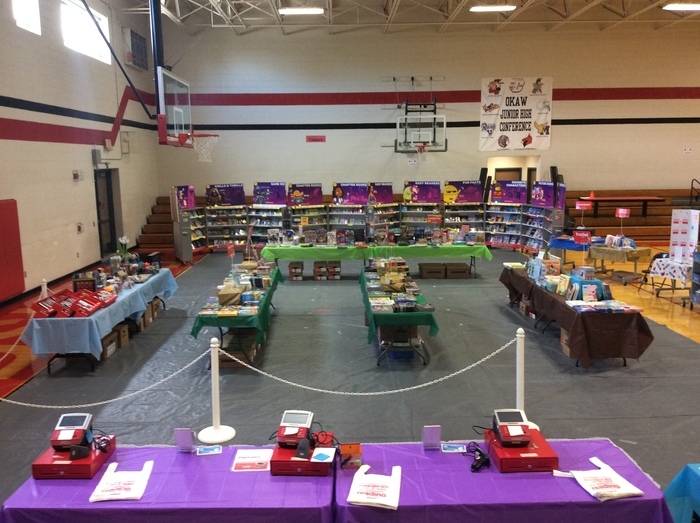 3rd, 4th, and 5th grade students at SES and across Illinois were encouraged to read those books and vote for their favorite. The top book voted for at SES was Wish by Barbara O’Conner. 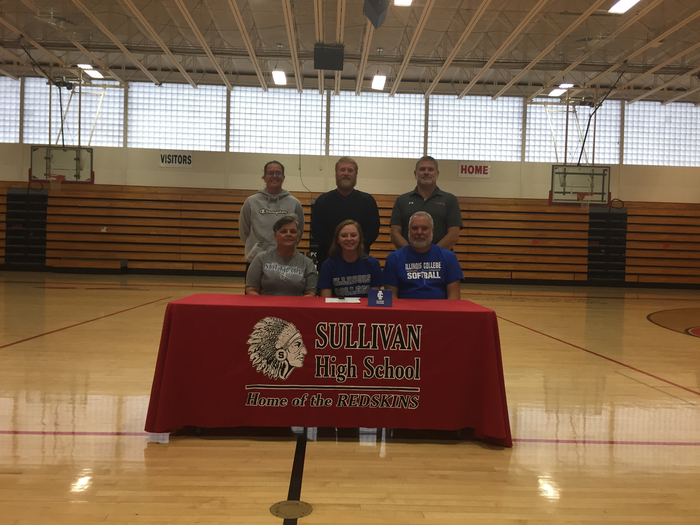 Congratulations to Piper Conlin! Piper read 9 total Bluestem nominate books! When the Bluestem books she wanted to read were checked out, she made her way to the public library to get them. Way to go Piper! 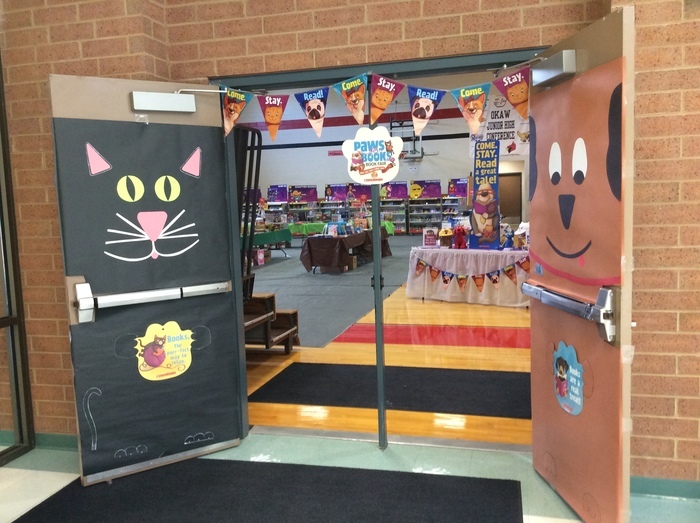 As part of Dr. Seuss week, first graders did dress up days for some of the classic books. Today was "Oh the Places You'll Go", and students dressed up to show what they want to be when they grow up. 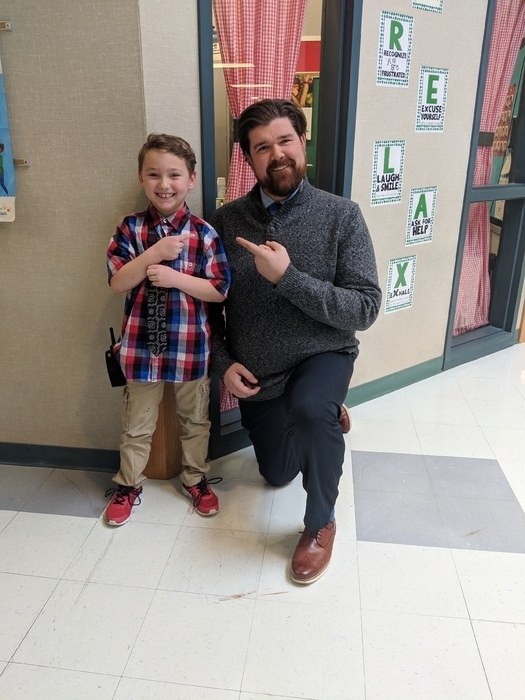 Axton Fryman dressed like Mr. Ogle. When asked why he didn't dress like Mr. Allen, he said it was because he didn't want to shave his head. 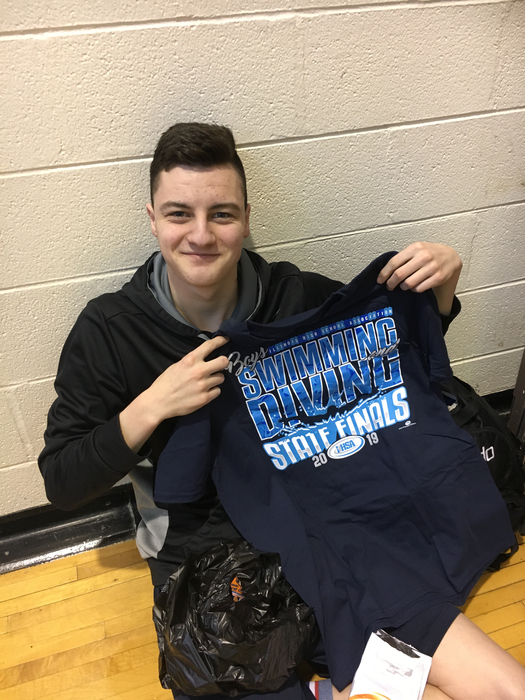 Congratulations to Brodie Goss on placing 24th at the IHSA State Swim Meet yesterday in the 100m breaststroke. His time of 59.61 set a new school record! #onetribe! At the half - Sullivan trails Marshall 40-23 in IHSA Boy’s Basketball Regional. At IHSA Boy’s Basketball Regional - Sullivan trails Marshall 21-12. 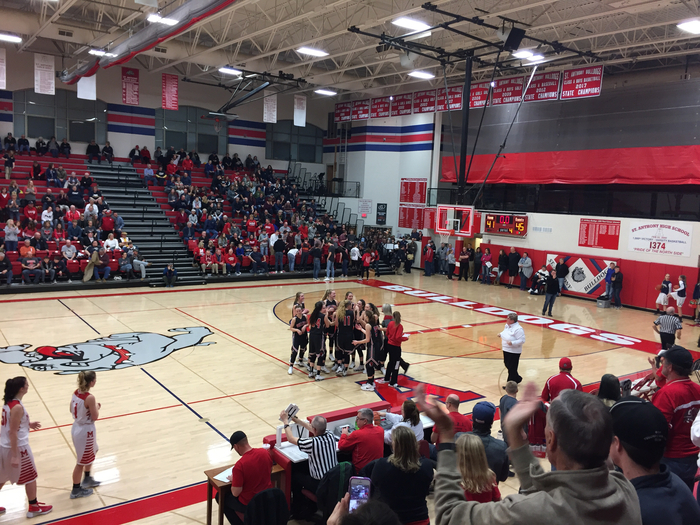 Teutopolis defeats Sullivan 53-31 in IHSA Girls Sectional Championship; congratulations to the Lady Redskins on a Great season! 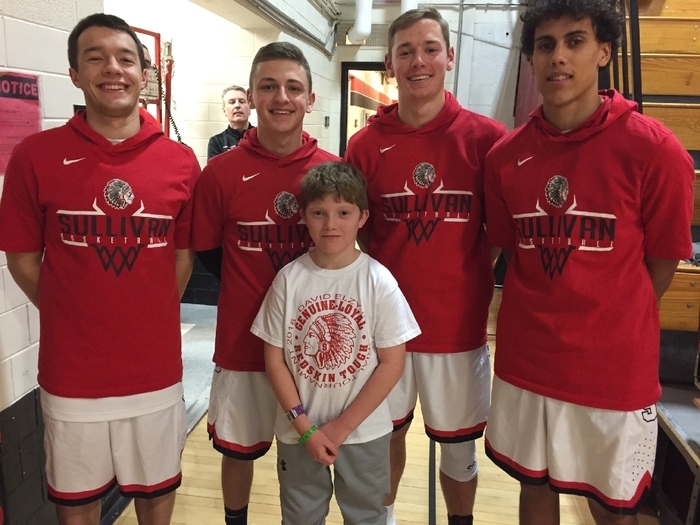 As a result of showing respect, Brynner Johnson was chosen to lead the varsity boys basketball team onto the court for Senior Night. Way to go Brynner! 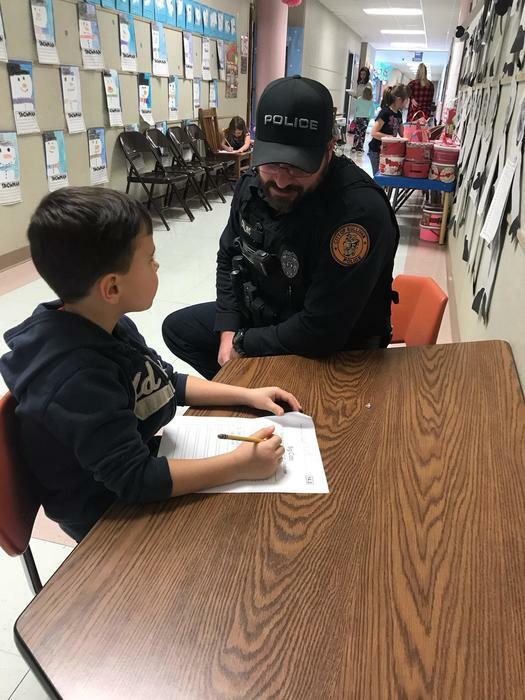 While walking the hallways of Sullivan Elementary School, Officer Collins stopped to offer help for a student working on his homework. 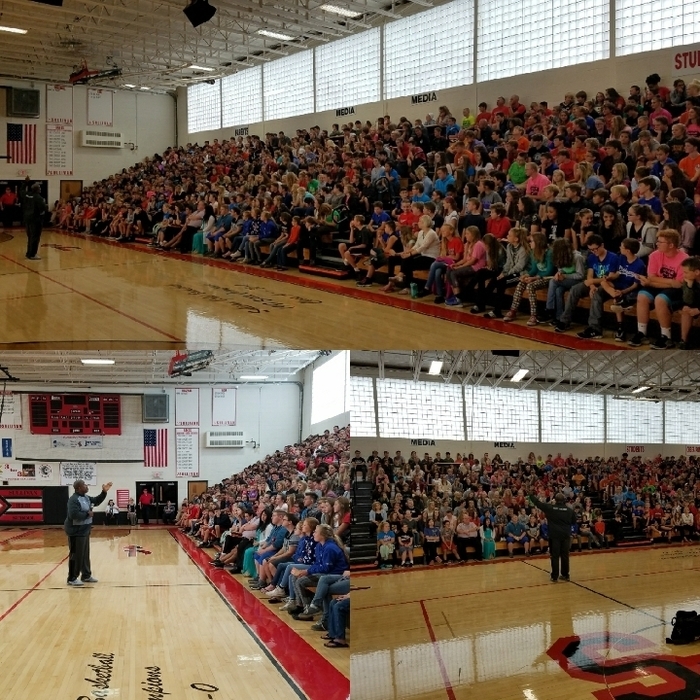 Sullivan Schools are very fortunate to have a great relationship with our local police department! 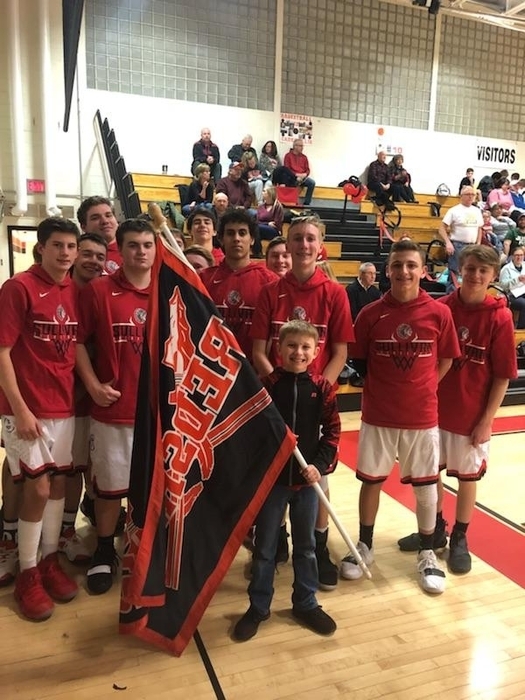 As a result of showing respect, Clark Freese and Will Miller were chosen to lead the varsity boys basketball team onto the court Friday night before the game. Great job boys! 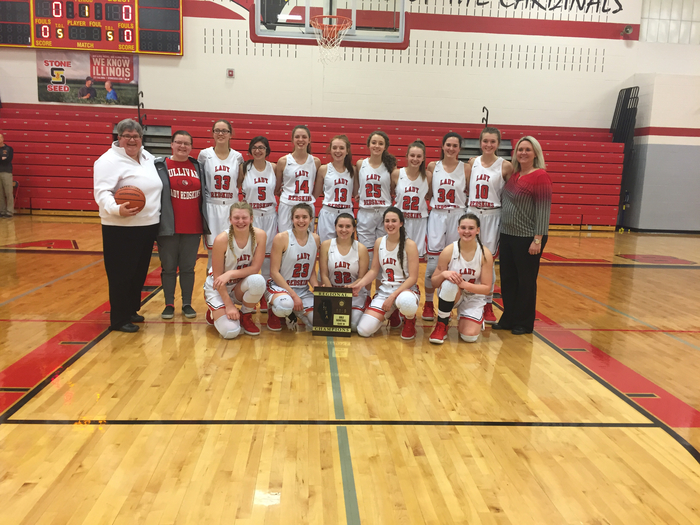 Congratulations to the Lady Redskins on winning the IHSA Class 2A Regional Championship by beating VGH 59-46! Onetribe! Lady Redskins defeat WL 41-31 and advance to Regional Championship game tomorrow at 7:00 PM in Warrensburg #onetribe! Elementary and Middle School Parents: Before ordering a yearbook, you may want to check Skyward (in "Fee Management") to make sure you did not already place an order and pay for one during registration. If you would like to pay for your yearbook using Skyward, you can find that option clicking on the "Fee Management" link then clicking on "Add a Fee." Just a reminder that Sullivan Schools will dismiss early on Thursday, February 7th and Thursday, February 14th due to Parent/Teacher Conferences. SES will dismiss at 2:20 and SMS and SHS will dismiss at 2:30. There will be no school on Friday, February 15th and Monday, February 18th. 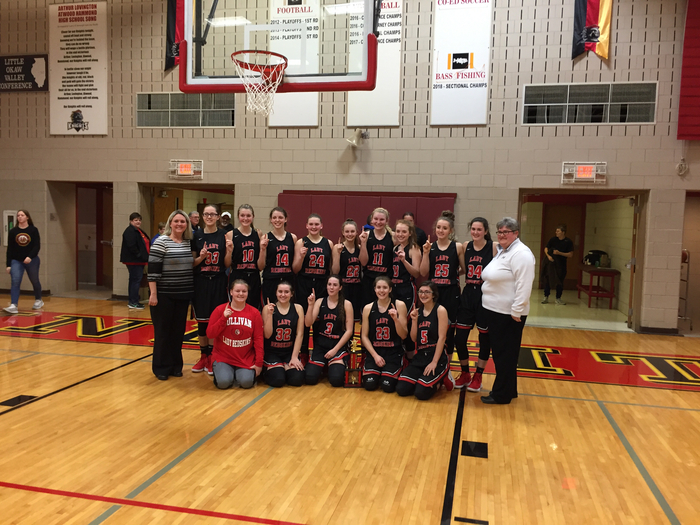 Lady Redskins defeat Tuscola 56-24 and clinch the CIC Regular Season Championship! #onetribe! 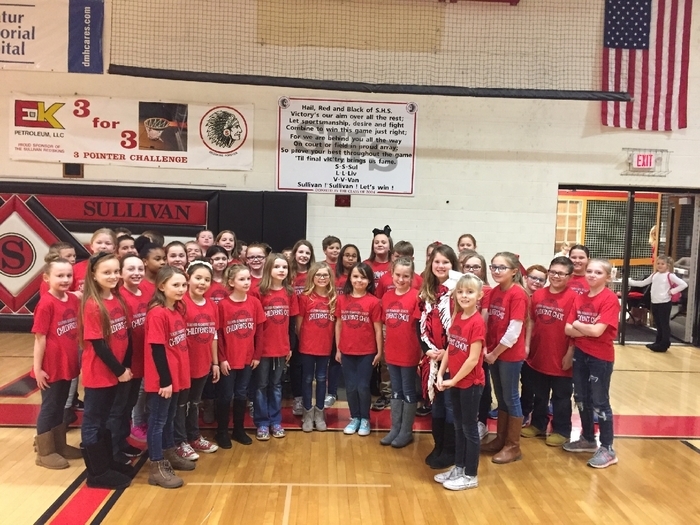 Tonight, Sullivan's Children's Choir performed the national anthem before the varsity girls game against Tuscola. Great job students! 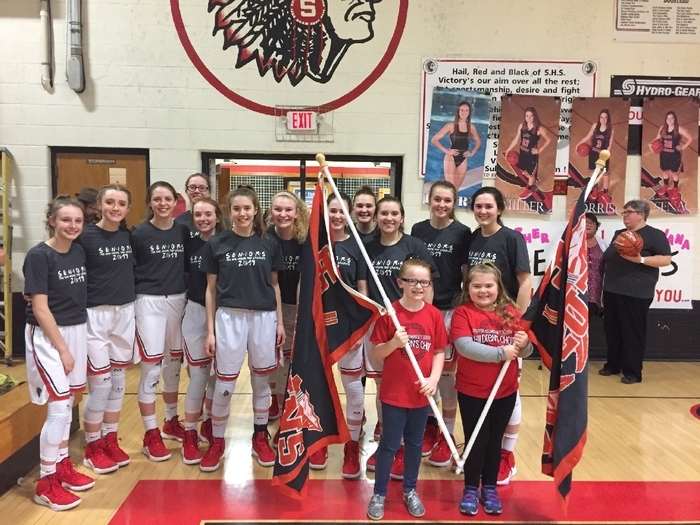 As a result of showing respect, Mali Roe and Cali Szabo were selected to lead the Lady Redskins onto the court for their game against Tuscola. Way to go, girls! The SMS VB games at Arcola on Thursday 1/31 at 6:00 PM will still be played as scheduled. 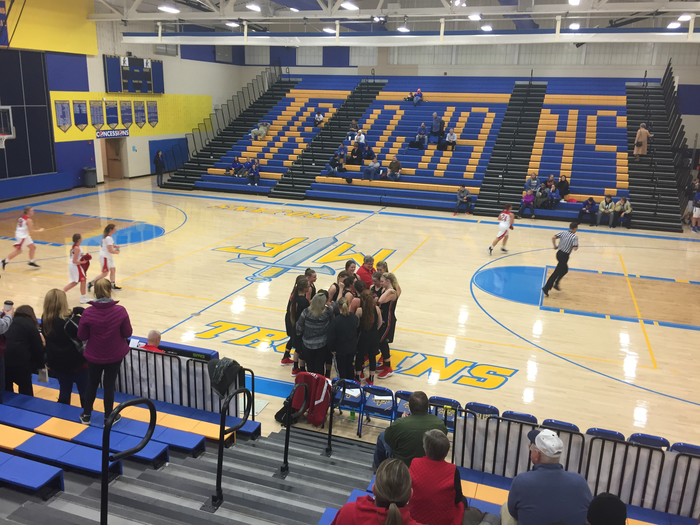 The JV/Varsity Girls BB games scheduled for Thursday 1/31 vs. Tuscola have been postponed to Friday 2/1 at 6:00 PM in the SHS Gym. 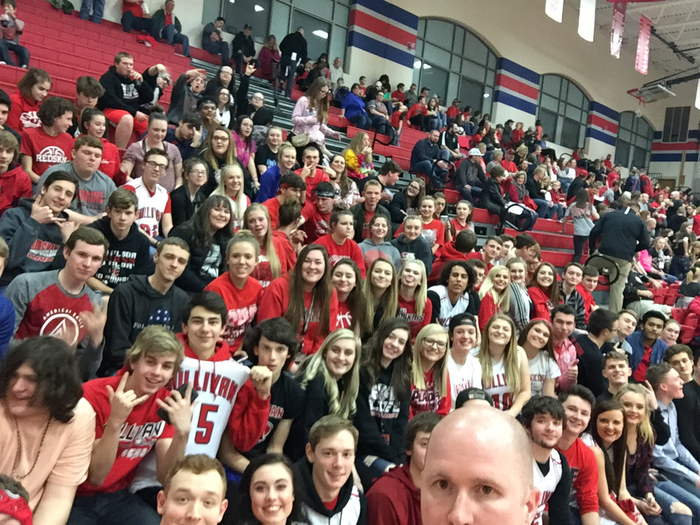 Senior night festivities for girls basketball players and boys and girls swimming members will still occur between the JV and Varsity contest. Over the past few hours, the windchill forecast for Sullivan has dropped 10 degrees. For student safety, Sullivan Schools will not be in session on Thursday, January 31st. Due to extreme temperatures, Sullivan Schools will be running a Delayed Start on Thursday, January 31. Please note that all three building will begin classes at 10:00am, which is a change from our last Delayed Start. Students on bus routes should expect pick-up times to be delayed by two hours. Morning practices will be cancelled, but afternoon activities will run as scheduled. Breakfast WILL be served from 7:30-9:45. Morning Early Childhood and Project HELP classes, TLC, and Bridges will not be in session. Afternoon Early Childhood and Project Help classes will be in session. HS Early Bird PE Class will not meet. All dismissal times will remain the same. To assist parents with morning obligations, the WEST entrance to SES will open at 7:30, with supervision available for elementary students in the SES gym. 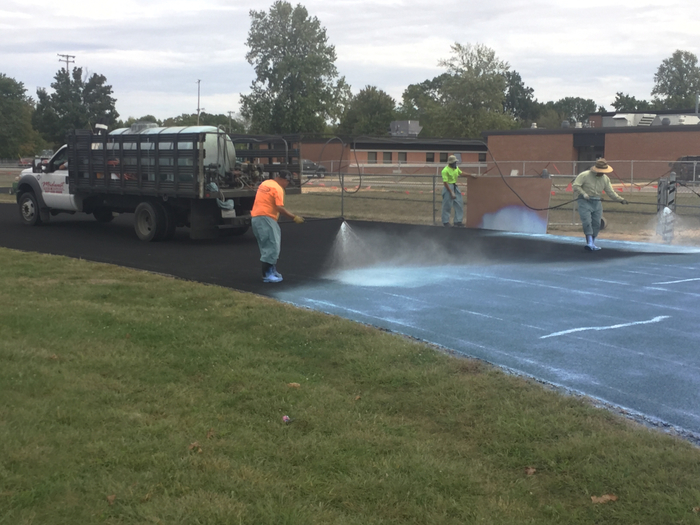 The main entrance to SHS will also open at 7:30, with supervision available for middle and high school students in the SHS gym. Extreme temperature routes within City limits will run tomorrow. A map of in-town pick-up locations and times can be found on the Live Feed of our website. Please bundle up and be safe! Please refer to the following for pick-up times and locations for in-town students during a Delayed Start due to Temperature. Due to extreme temperatures, Sullivan Schools will not be in session on Wednesday, January 30th. All home activities and practices will be cancelled. Stay safe and warm! Lady Redskins defeat St. Teresa 54-48 and clinch a share of the CIC Regular Season Championship! #onetribe! Future Redskins week 3 schedule. 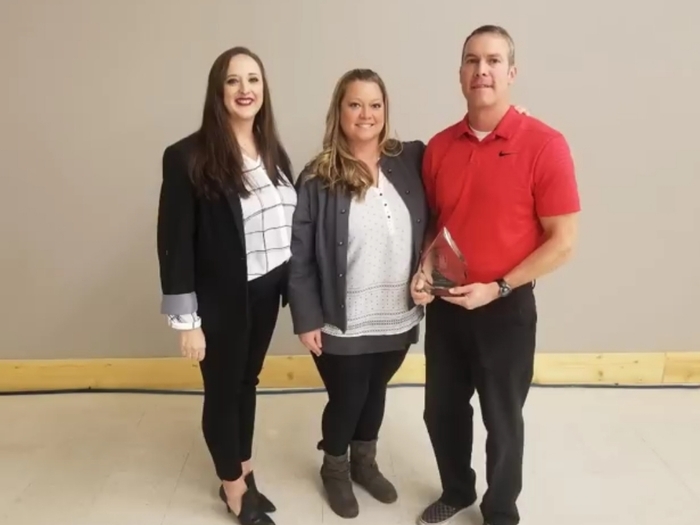 Congratulations to SES teachers Jake and Melissa Haegen for being named Sullivan's "Citizens of the Year!" 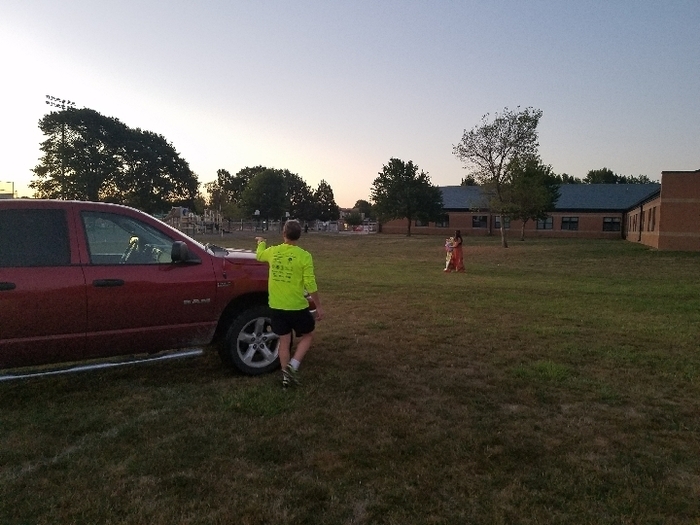 Apart from the numerous activities they do through the school, they also spend countless hours creating opportunities for Sullivan's youth by running the extremely popular summer rec program and serving on the Sullivan Youth Baseball and Softball Board, among other activities. Sullivan Schools could not be more proud of them for this tremendous honor! Due to extreme temperatures and wind chill, Sullivan Schools will be running a Two-Hour Delayed Start on Friday, January 25. SES classes will begin at 10:00am and SMS/SHS classes will begin at 10:15am. Students on bus routes should expect pick-up times to be delayed by two hours. Morning practices will be cancelled, but afternoon activities will run as scheduled. Breakfast WILL be served from 7:30-9:45. Morning Early Childhood and Project HELP classes will not be in session. Afternoon Early Childhood and Project Help classes will be in session. HS Early Bird PE Class will not meet. All dismissal times will remain the same. To assist parents with morning obligations, the WEST entrance to SES will open at 7:30, with supervision available for elementary students in the SES gym. The main entrance to SHS will also open at 7:30, with supervision available for middle and high school students in the SHS gym. Extreme temperature routes within City limits will run tomorrow. Please bundle up and be safe! Here is an update for the Future Redskins schedule. SHS FR/SO Boys Basketball will play at 7:15 in the WL Cardinal Classic on Wednesday 1/23/19. SHS FR/SO Boys Basketball games with Okaw Valley on Monday 1/21 have been cancelled. SHS FR/SO Boys Basketball games in the Cardinal Classic at W-L scheduled for Saturday 1/19 have been cancelled. Makeup date is TBD. The SHS Boys Basketball Practice scheduled for Saturday 1/19 has been cancelled. SMS Volleyball Practice scheduled for Saturday 1/19 has been cancelled. 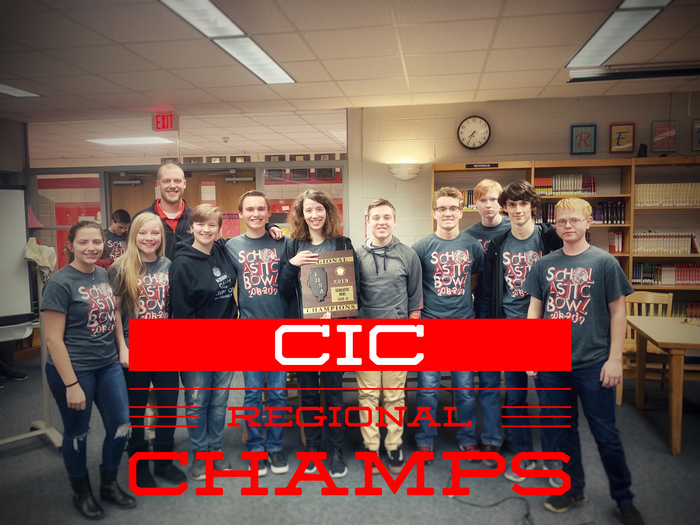 CIC JV Scholastic Bowl Tournament scheduled for Saturday 1/19 at SHS has been cancelled. The tournament will not be rescheduled. Future Redskins Basketball League scheduled for Saturday 1/19 has been cancelled. Makeup dates are TBD. SMS Boys Basketball Practice scheduled for Saturday 1/19 has been cancelled. 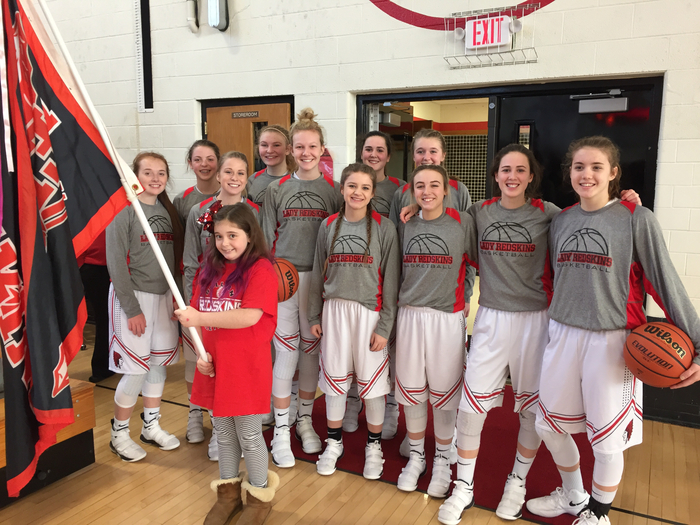 As a result of showing respect, Daisy Richardson and Natalie Stinson were chosen to lead Lady Redskins varsity basketball team onto the court. Great job girls! 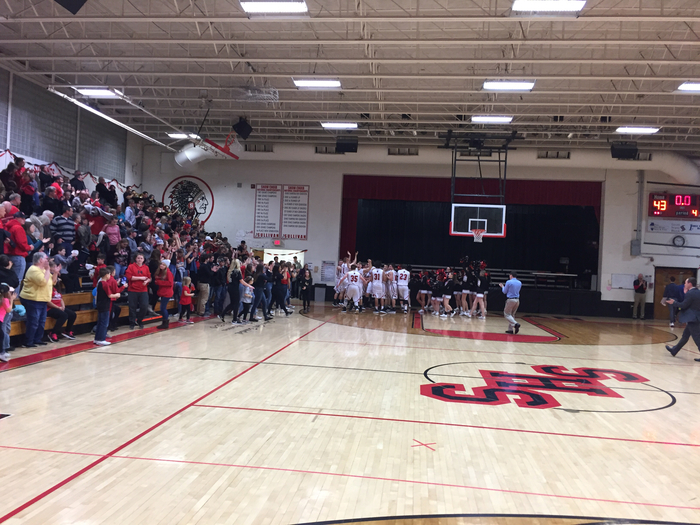 SHS FR/SO Boys Basketball games in the WL Cardinal Classic will now be played on 1/17/19 beginning at 6:00 PM in Warrensburg. 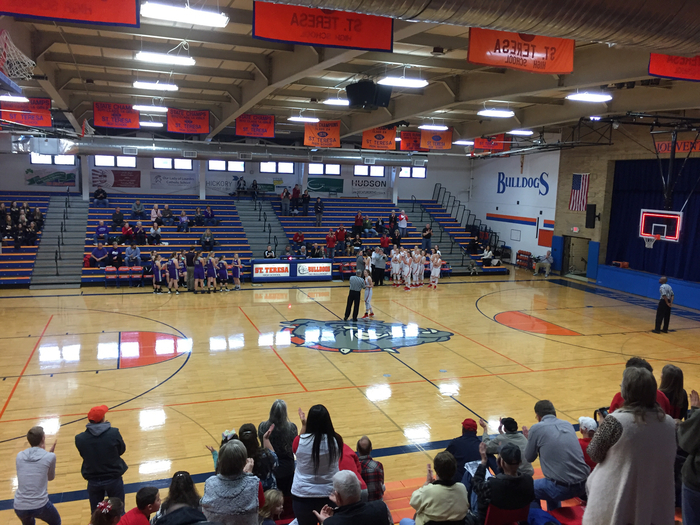 The SHS Varsity Girls Basketball game scheduled for Saturday 1/12/19 at Altamont has been cancelled due to the weather. 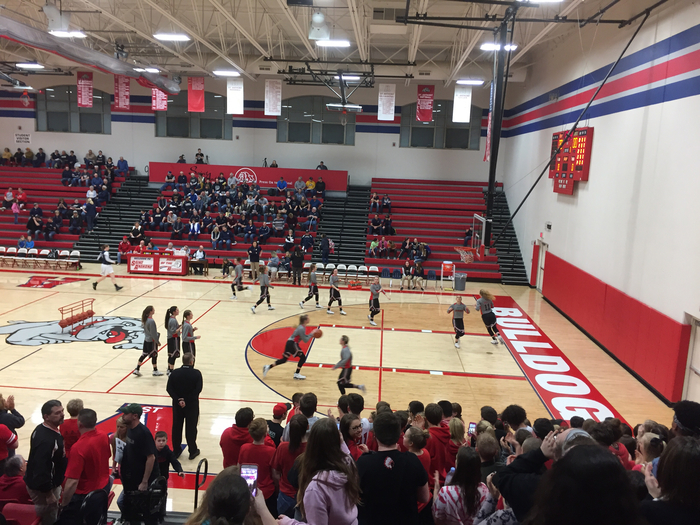 The start time of the SHS JV and Varsity Boys Basketball games at Warrensburg-Latham this evening 1/11/19 have been moved up to 5:30 PM due to weather. SHS FR/SO Boys Basketball games at Warrensburg-Latham on Saturday 1/12/19 have been postponed. SMS Volleyball practice scheduled for Saturday 1/12/19 has been cancelled. Future Redskins Basketball scheduled for Saturday 1/12/19 has been cancelled. The SMS Boys Basketball practice scheduled for Saturday 1/12/19 has been cancelled. The CIC JV Scholastic Bowl Tournament scheduled for Saturday 1/12/19 has been postponed to 1/19/19. Here are the rosters for the Future Redskins. 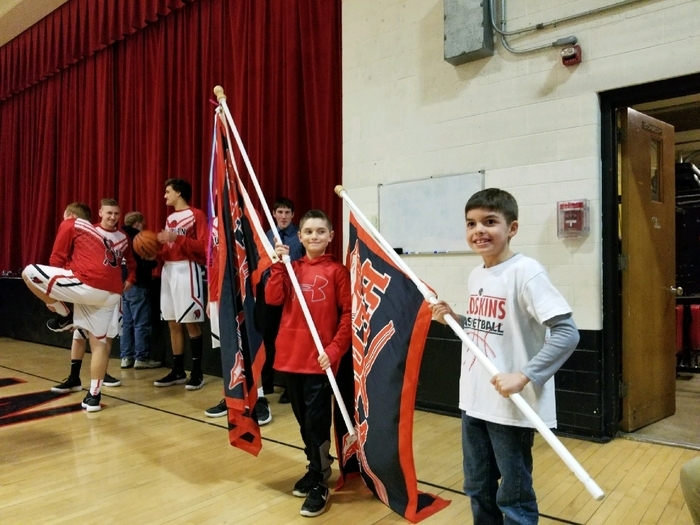 As a result of showing respect, Noah Hobbs got to lead the varsity boys basketball team onto the court in their game against Cerro Gordo. 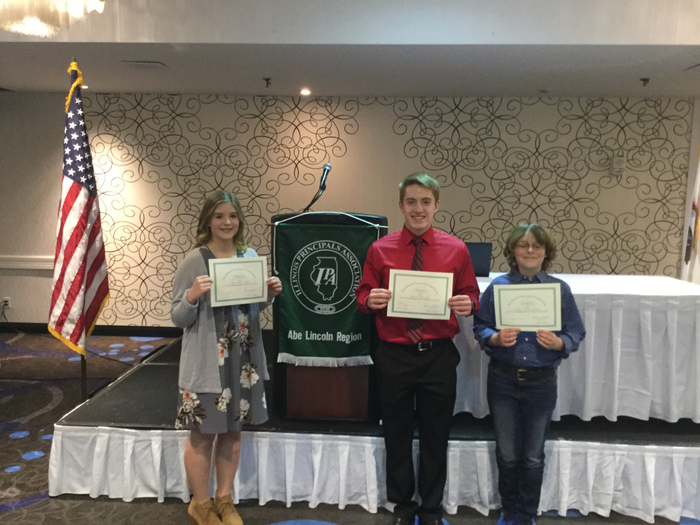 Way to go Noah! 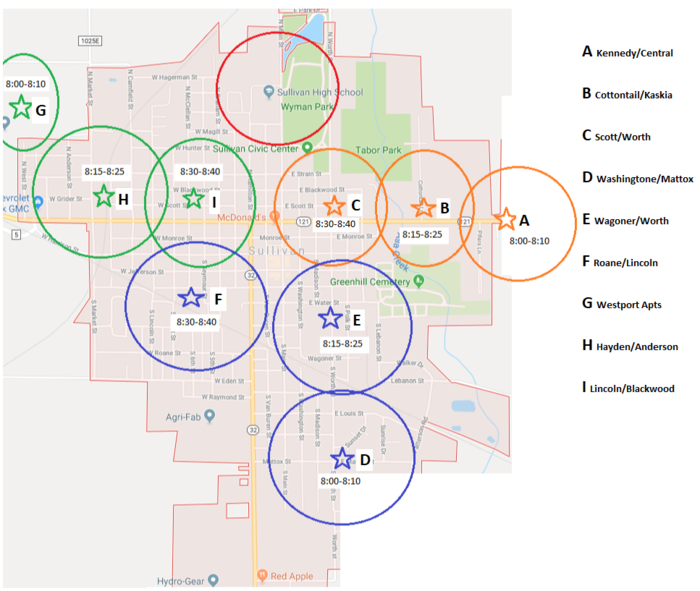 If you have a student in the elementary and/or middle schools, you should be expecting an email from the school regarding the 5Essentials Survey. This survey has been created by the state to help schools recognize areas of strength and needs for improvement. This survey only takes about 10 minutes to complete and is very helpful to our schools. Please help us out by completing it before FEBRUARY 15, 2019! 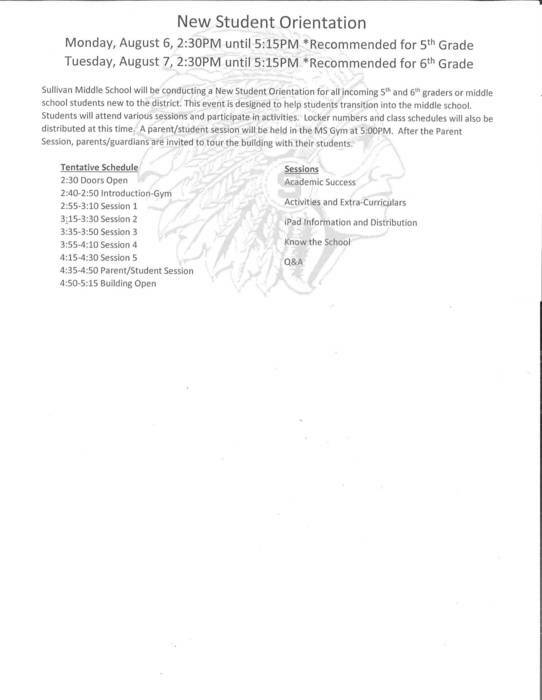 On Thursday, January 3rd, teachers and staff at Sullivan Schools will be conducting Safety Training. There may be increased law enforcement presence on campus. If you need to access the school, please call the building secretary ahead to confirm availability. Thanks for your cooperation, and we look forward to welcoming our students back on Friday! 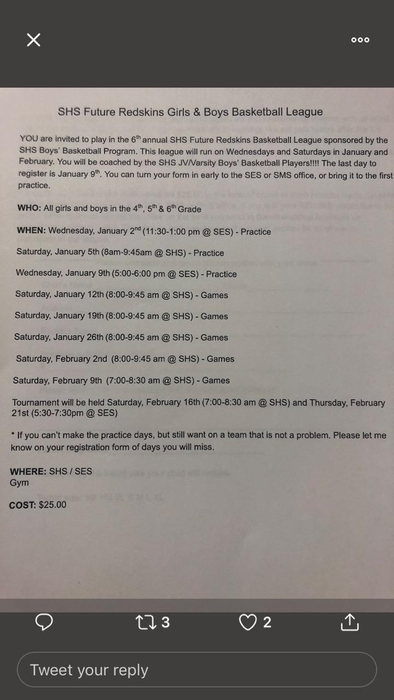 Here is information on the Future Redskins basketball league which will begin on January 2nd. It is for 4th, 5th, and 6th grade boys and girls. Students will be coached by the high school boys basketball players. 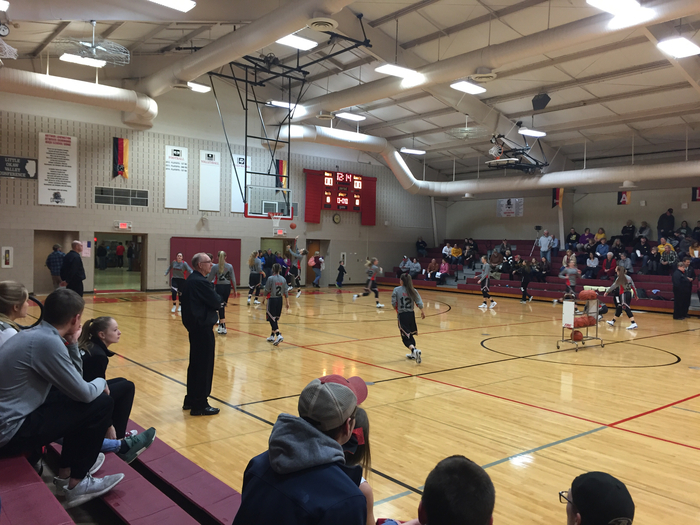 Sullivan defeats CHBC 69-49 in Dieterich Holiday Tournament! Game time Friday is TBD #onetribe! Knight Classic Champions! 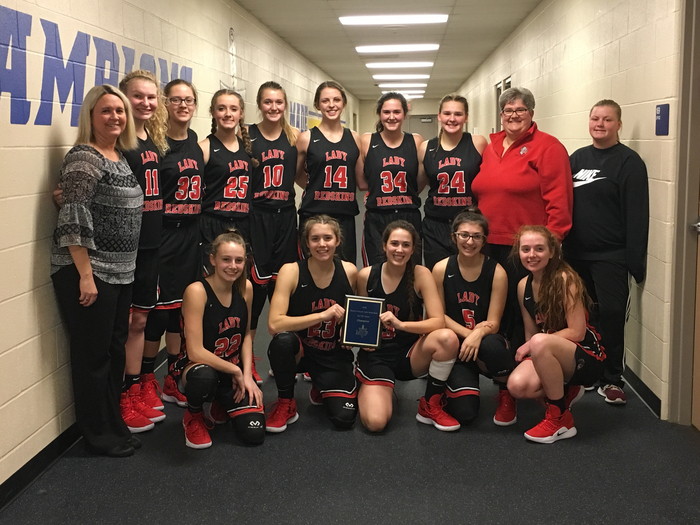 Lady Redskins defeat ALAH 45-37; Emily White and Esther Miller make all- tourney team! Congratulations! #onetribe! Here is the moment you have all been waiting for, the announcement of the winner of the SES door decorating contest! There were 712 total votes. In 5th place, with 56 votes, was Ms. Mars. In 4th place, with 58 votes, was Mrs. Fultz. In 3rd place, with 59 votes, was Mrs. Drollinger. In 2nd place,with 72 votes, was Mr. Haegen . The grand prize winner, with a whopping 119 votes, was Mrs. Saul (pictured)! 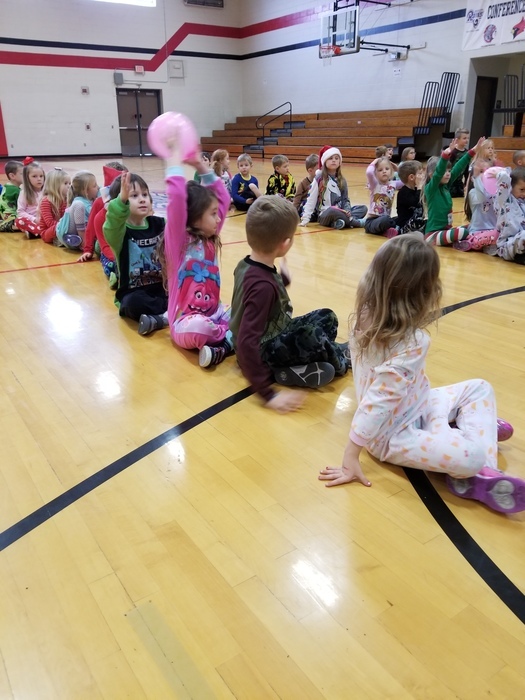 Students in Mrs. Leach and Coach Typer's classes competed in a series of fun relay races over the past week. There was a variety of relays, such as the one pictured as well as students having to get a balloon past a certain point with it only touching a paddle. 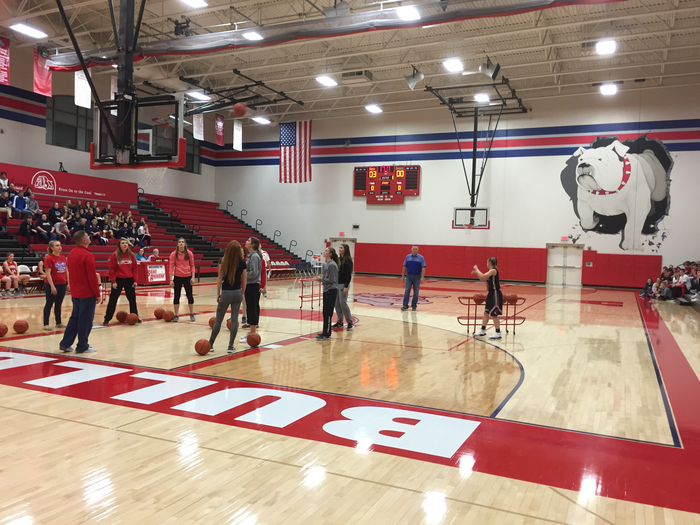 The "Reindeer Games" were a great warmup for Christmas Break! Unable to make tonight's game? 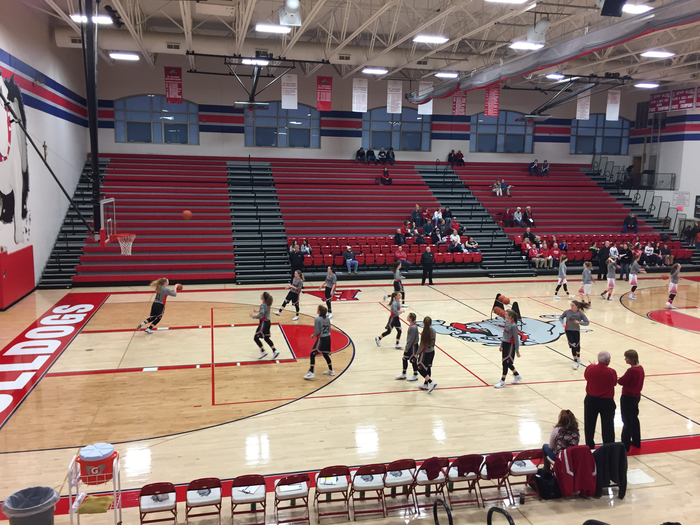 Lady Redskins host the Mattoon Green Wave - Watch it live on our YouTube Channel: https://www.youtube.com/watch?v=9U78f6_zR5I. 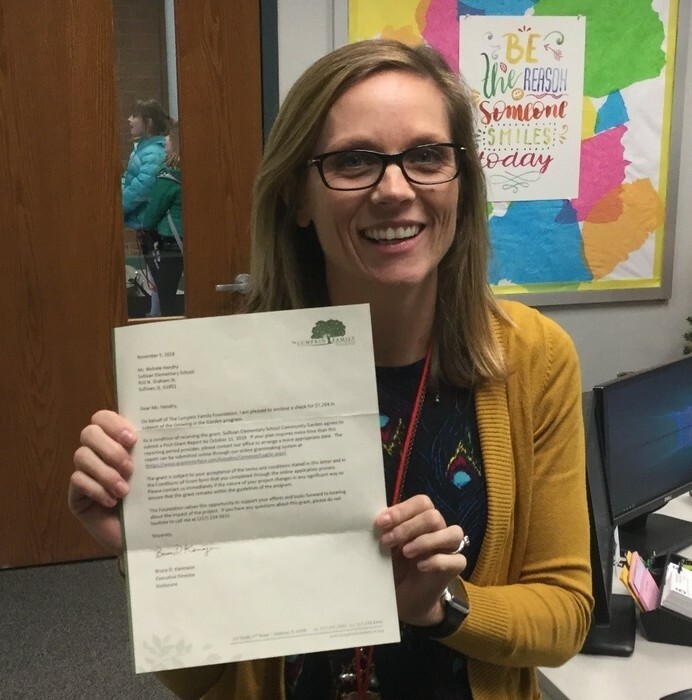 Last month, Nichole Hendry (4th Grade teacher), received notification that she would receive the Lumpkin Family Foundation grant for $7294 to go towards the school’s Garden Project. Mrs. Hendry organized the Garden Project with the help of school staff and community members last spring. She wrote the grant to help cover the costs of the project, such as outdoor classroom materials, tools, a green house, and curriculum. 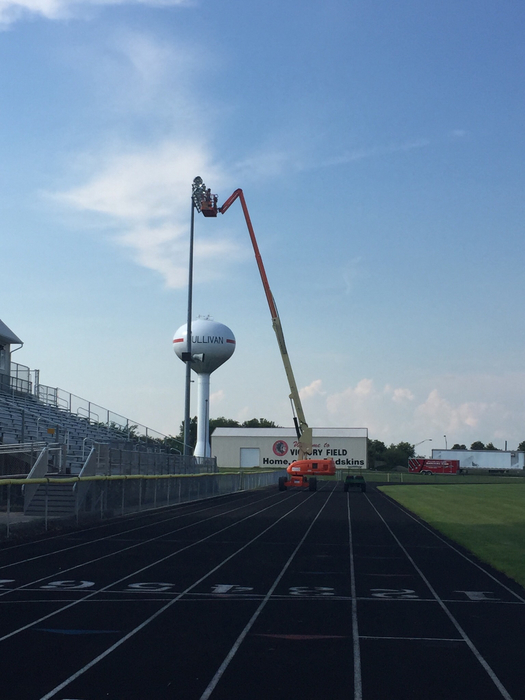 Mrs. Hendry has volunteered many hours throughout the school year and the summer to get this project off the ground. It has provided wonderful learning experiences for the students and an opportunity for the school to collaborate with the community. Last year we were able to get the project started through some very generous local donors, while the money received from this grant will help the school focus more on developing collaborative relationships with our area businesses and creating a self-sustaining program with the hope of potentially expanding it. The Lumpkin Family Grant is a private, family foundation from Mattoon, Illinois. Their mission is to get people to work together for the betterment of our communities. More information is available about the Lumpkin Family Foundation at www.lumpkinfoundation.org. 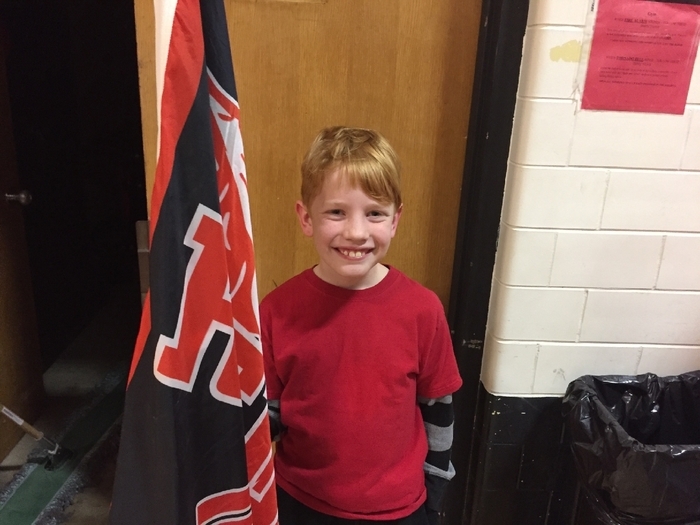 As a result of showing respect, Rowan Mast got to lead the varsity boys basketball team onto the court before Friday's matchup against Decatur LSA. Way to go Rowan! Congratulations to Sullivan Elementary School music teacher Courtney Leach for being elected as the ILMEA District 5 president! 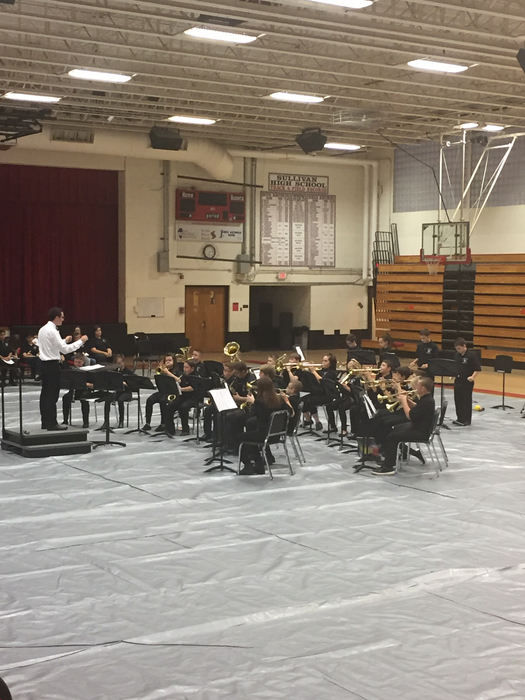 With 3500 members, the ILMEA (Illinois Music Education Association) is the largest Fine Arts education organization in Illinois and is one of the largest in the nation. Its purpose is to promote music within the schools, to give students great and unique musical experiences, and to provide professional development opportunities for music teachers. In her first year at Sullivan Elementary, Mrs. Leach has created a buzz about music among the students and staff alike. With her upbeat personality, love of teaching, and passion for music, she has students excitedly participating in classes and developing their own passion for music. She has already put together a great Veterans Day program, and we are looking forward to seeing what she has for us this Christmas! 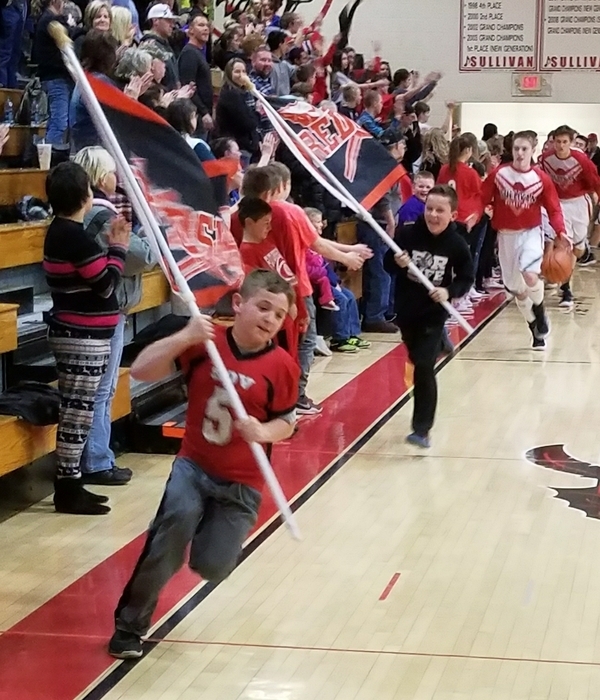 As a result of being respectful, Brady Stollard and Noah Bryant got to lead the varsity boys basketball team on to the court in their game against Neoga Friday night. Great job boys! 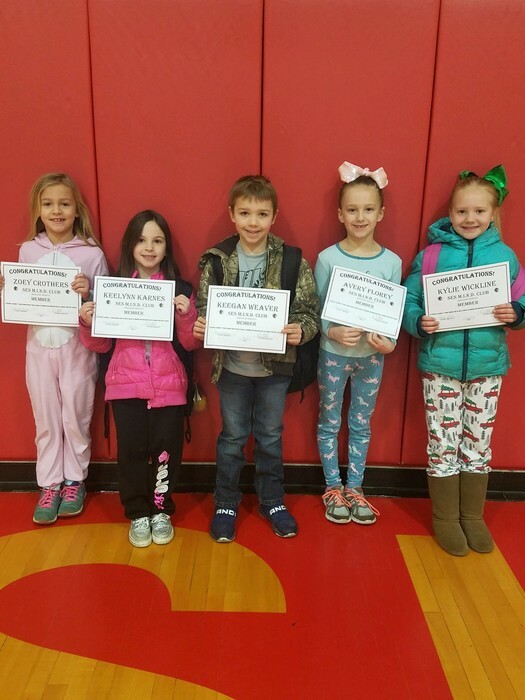 Every month, Sullivan Elementary School recognizes students who go above and beyond expectations by awarding them "Gold Slips." 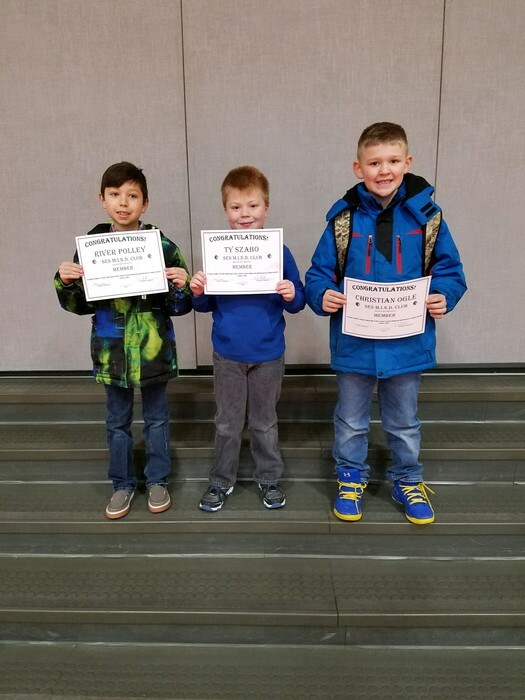 Here are the Gold Slip winners from the month of November (from left to right): Kolton Kirby saw a pre-K student struggling to turn the water on at the restroom. Instead of doing it for him, Kolton taught him how to do it himself for the next time, then praised the student. He didn't know anyone was watching; what a kind and caring student! Porter Addison noticed a friend was sad. He asked if he could sit by that friend to cheer him up. What a sweet friend Porter is! Luke Schultz saw a classmate crying because she dropped her lunch on the floor. He helped her pick it up to make her feel better! Madyx Schwass is very helpful to others at the end of the school day. We all work to clean up our room to make vacuuming easier for Mr. Lappin, but Madyx does more than his fair share! He stacks most of the chairs in the room, picks up paper and trash, and helps classmates get organized. 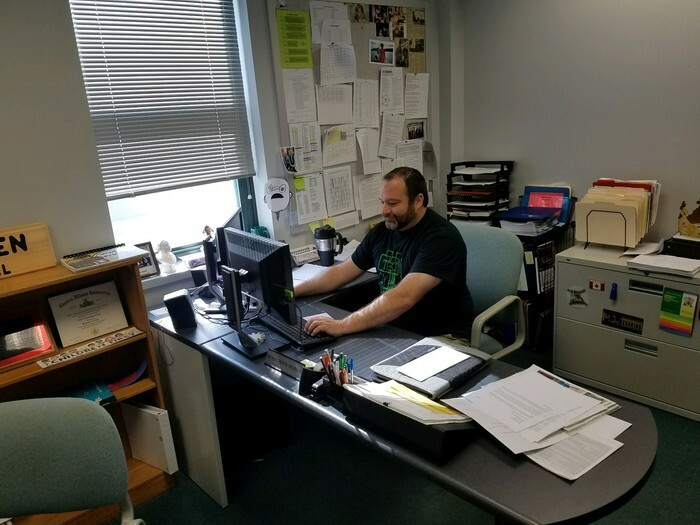 In addition, Madyx brings in the lunch cart from the hall and puts all of the chairs on the table in the hall so Mr. Lappin's job is easier! Cali Szabo is always so pleasant and polite. She was an easy choice to be a buddy and helper for our new student! Cali has helped unpack supplies, set up a binder, label a journal, create a card of logins and passwords, explain classroom, lunchroom, and school procedures, and more! She has befriended our new classmate and made her feel welcome. They have had lunch and played together. Cali is a terrific, cheerful leader! Torreon Phillips stands quietly in the lunch line every single day while students around him are talking when they are not supposed to. 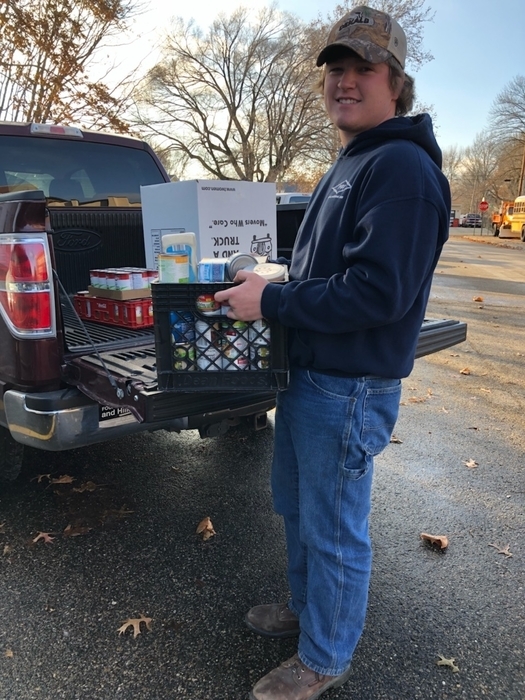 A big thank you to Hayden Faulkner for helping load and deliver food items collected by the Fellowship of Christian Athletes. 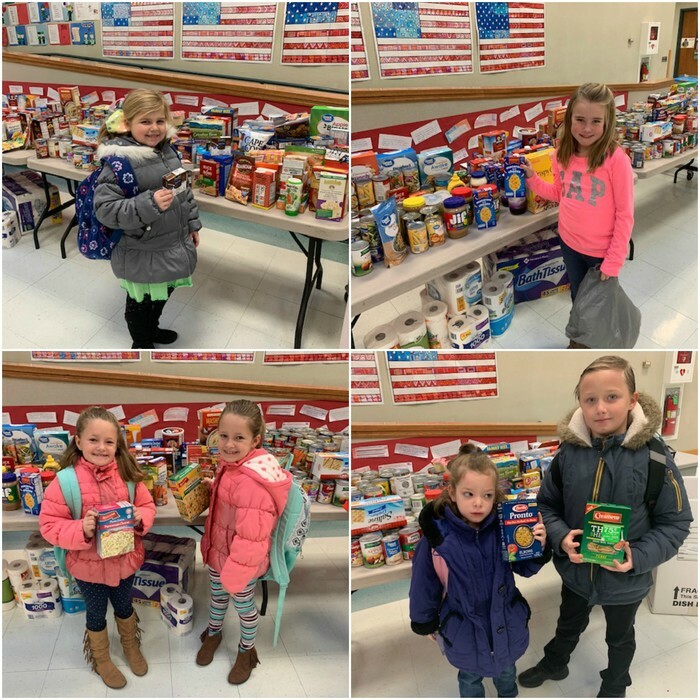 The food was donated to the food pantry. This week during library, Mrs. Fleming read the story Claymates, a Monarch Award nominated book, written by Dev Petty and illustrated by Lauren Eldridge. Claymates is the hilarious tale of a clay owl and a clay wolf that have great fun transforming themselves into various creatures. But what happens when their artist-creator comes back...yikes! Students in all grades enjoyed being the artist and sculpted their own claymate with Play-Doh and a pair of googly eyes. 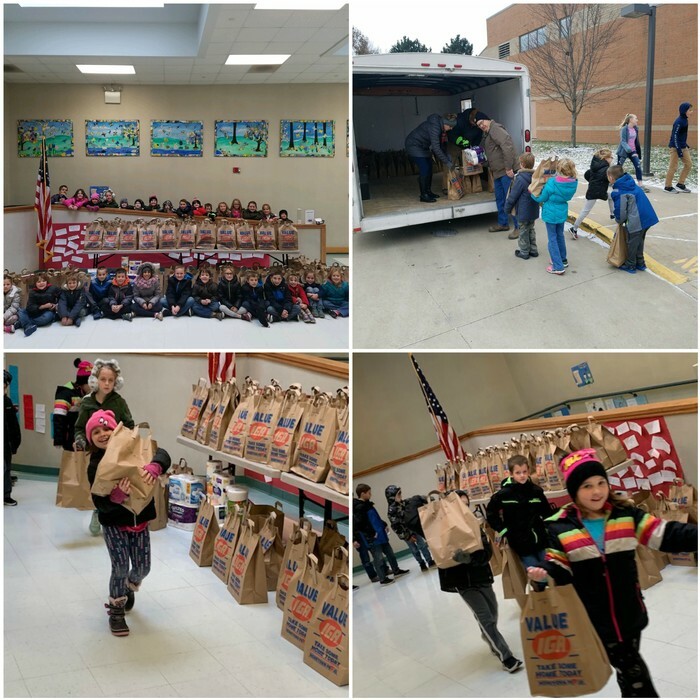 As a result of tremendous community cooperation and great coordinating by Mrs. Graham, Sullivan Elementary School was able to raise $1010.37 and 904 total grocery items for the Eastern Illinois Foodbank's Day of Giving! Shout out to Gary, Betty Jo, Brad Emel for helping transport the food to New Life Tabernacle Food Pantry. Thank you so much to all the local businesses and organizations that participated! Sullivan defeats ALAH 60-39 in varsity boys basketball; play next on 11/27 at Stew Stras Windsor #onetribe! 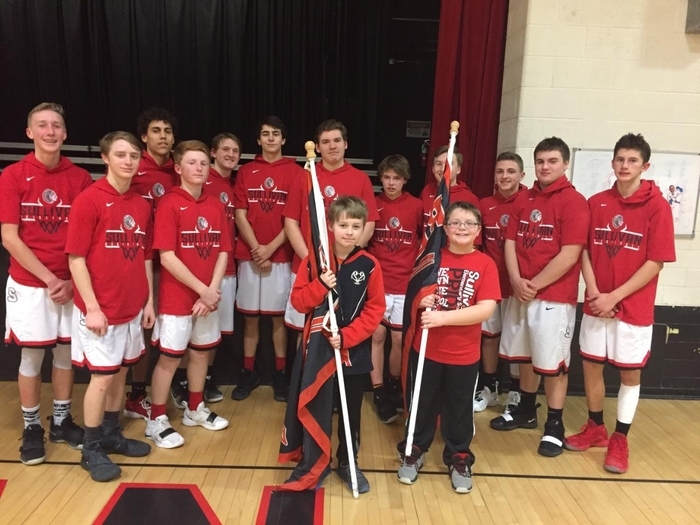 As a result of showing respect, Avram Bates and Gavin Wade were selected to lead the Redskins boys basketball team out onto the court in tonight's matchup against Arthur. Way to go boys! 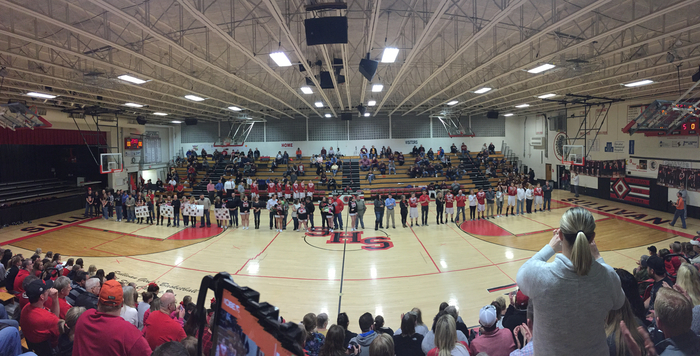 Tonight is the home opener for SHS Boys Basketball! Come watch the SHS Redskins VS the ALAHKnights. Unable to make the game? Be sure to subscribe to our YouTube channel! www.youtube.com/sullivanschool300 Freshman 5PM. JV 6PM and Varsity 7PM. 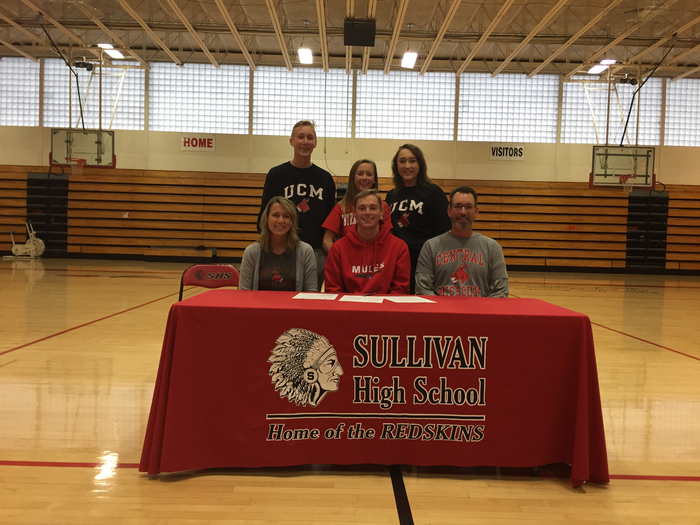 Congratulations to Caden Ellis on signing his NLI to play golf at the University of Central Missouri #onetribe! Sullivan Elementary School is off to a good start. There is still time left to donate food or money to the Day of Giving! November 27th will be the final day of collection. A huge Thank You! 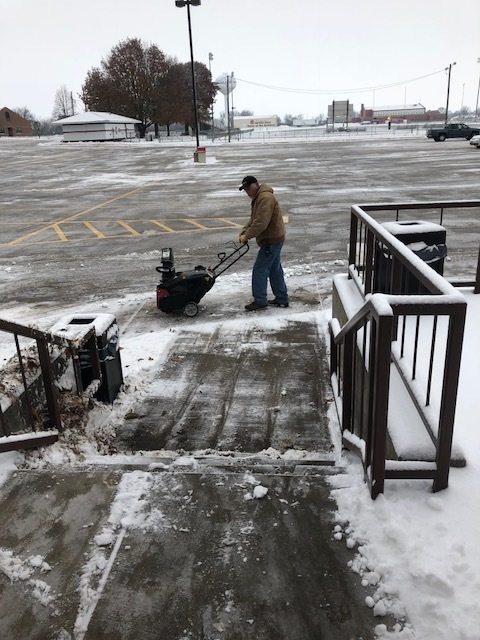 to our maintenance crew for working hard this morning to get the buildings ready for school today! The SHS Freshmen Boys Basketball practice scheduled for tomorrow morning 11/15 has been cancelled. 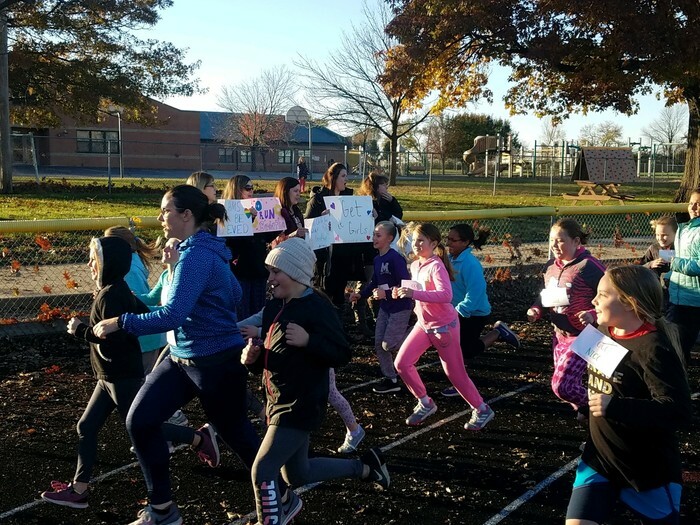 Some Sullivan staff members made signs and cheered on the 'Girls on the Run' members (4th, 5th, and 6th graders) as they completed their practice 5K. This Saturday their season will culminate with an official 5K. 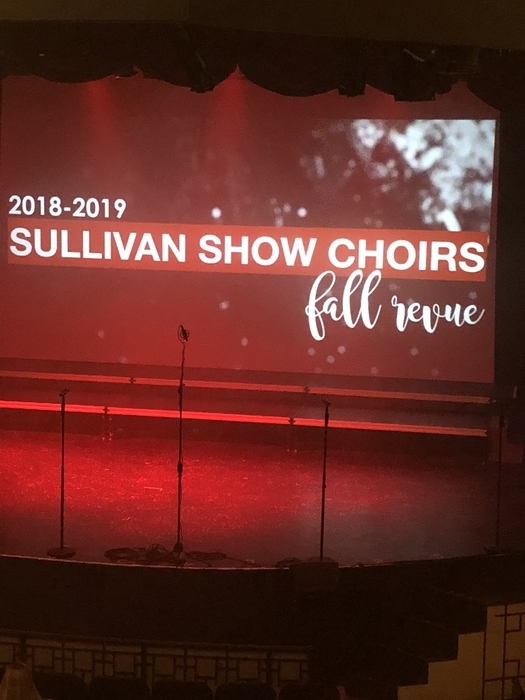 Still time to get out and see the Sullivan Show Choir Fall Revue! If you can’t make it tonight (7pm), there is another show at 2pm on Sunday. Tickets are $10. Attention Sullivan 300 Parents, Guardians, and Community Members, Our Phone Systems appear to be back online. Thank you all for your patience. Attention Sullivan 300 Parents, Guardians, and Community Members, we are currently experiencing technical issues with our phone lines. 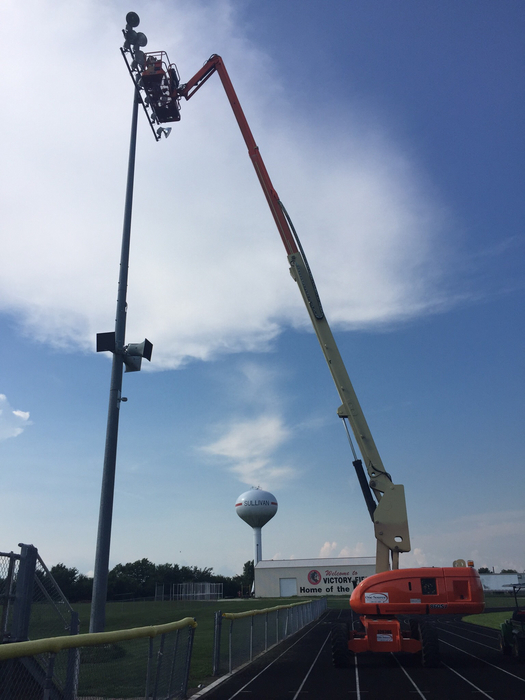 Our team is working diligently to find and repair the issue. In the meantime, please feel free to reach out to our staff via email or drop by our offices with urgent concerns. We apologize for the inconvenience. 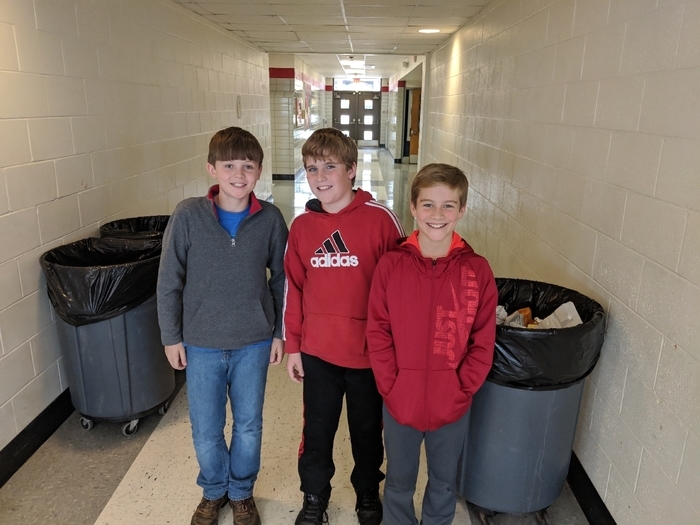 These fine young men stayed behind after middle school lunch without being asked to help pick up trash off of the floor to make things easier on the kitchen staff who have to turn around and get ready for high school lunch immediately after we clear out. This is what it means to be #OneTribe. Thank you to Gareth Coffer, Rhett Lehman, and Mason Booker! 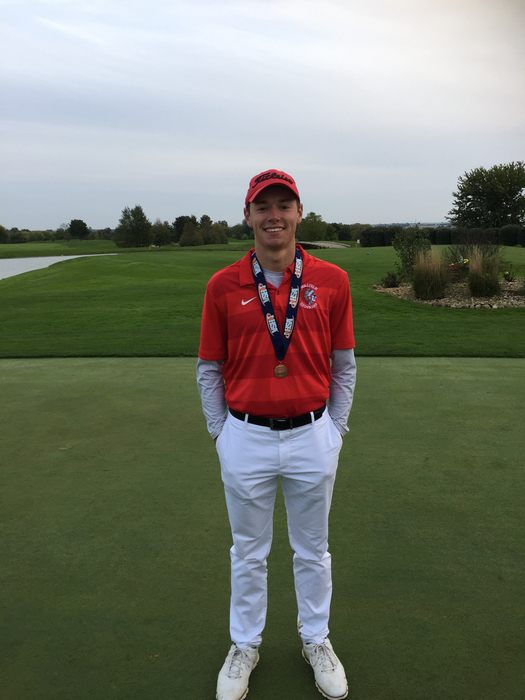 Congratulations to Caden Ellis on finishing tied for 3rd individually in the IHSA Class A State Golf Meet! 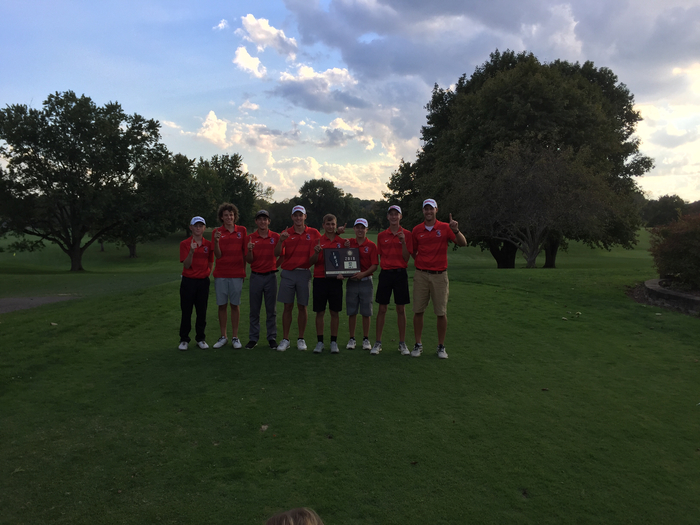 Congratulations to the SHS Varsity Boys Golf team on their 5th place finish in the IHSA Class A State Golf Tournament #onetribe! Sullivan currently sits at 7 over par and in first place at the IHSA Class A State Golf Meet! #onetribe! The health department has set up 2 more vaccination clinics for students. They are Thursday, October 11th in the afternoon and Monday, October 15th in the morning. Please call the health department at 728-4114 and schedule your appointment if your student is still in need of a vaccination.. The amazing teachers of SES showing pride in their alma maters! 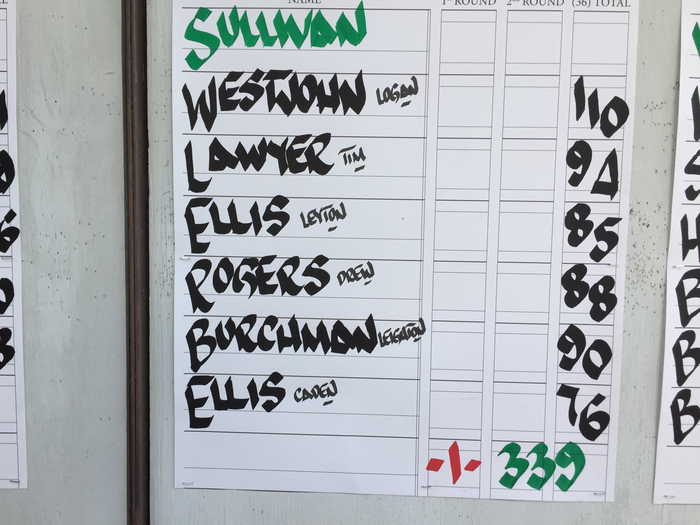 Individual Results from Sullivan boys at IHSA Golf Sectional today! #onetribe #statebound! 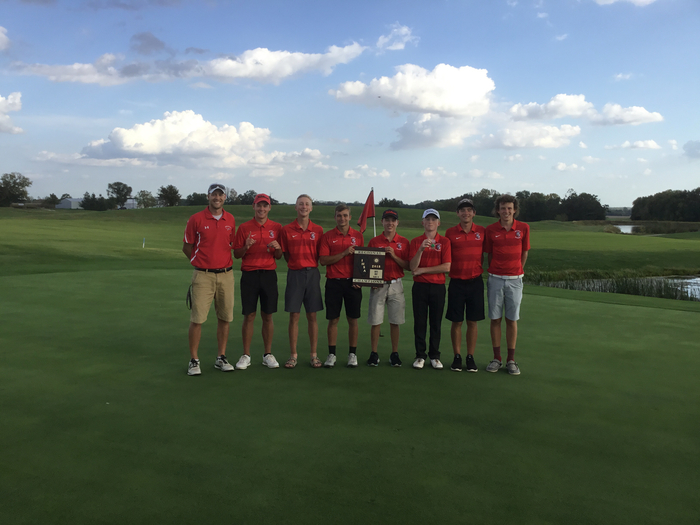 Congratulations to the SHS Boys Golf team on winning IHSA State Sectionals and qualifying for state! #onetribe! 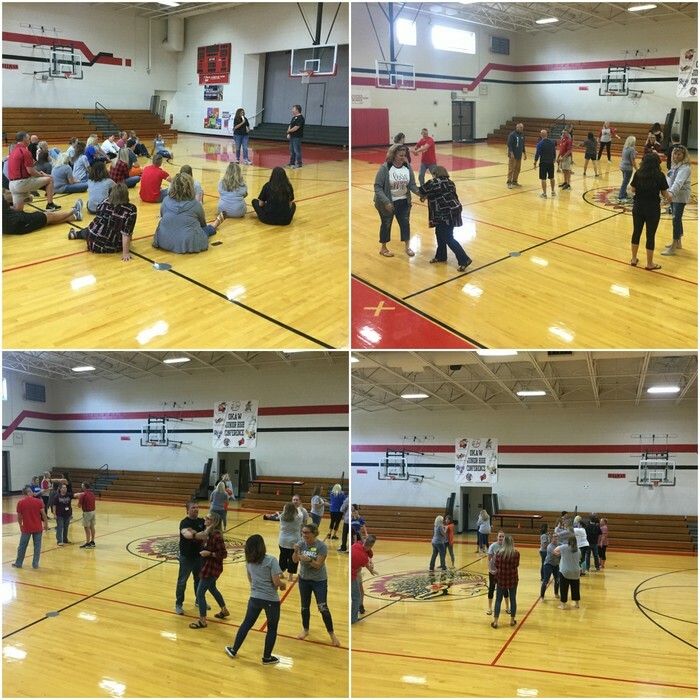 Thank you to Sean, Tarne, and Kyrie Mixson from One Light Self-Defense for coming to Sullivan Schools to train teachers in self-defense techniques! 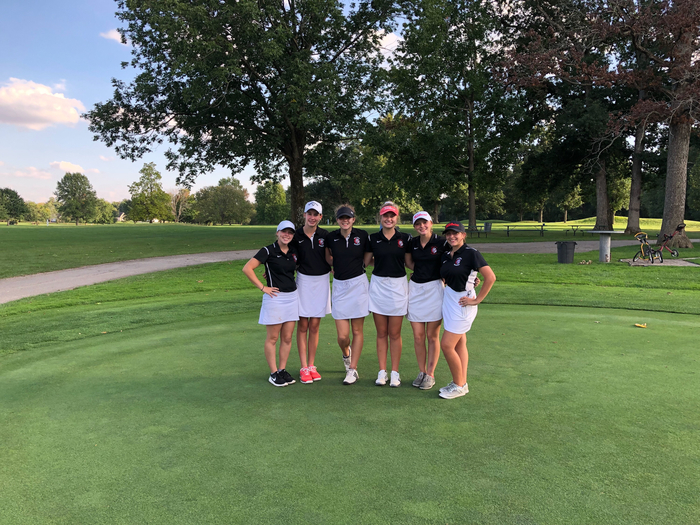 Congratulations to the SHS Girls Golf Team on finishing 2nd in IHSA Class A Regionals to qualify for Sectionals! #onetribe! On Wednesday morning, nearly 1000 Sullivan students from all three buildings lined Main Street to cheer for riders completing the 2nd Annual Gold Star 500, a four-day, 500-mile endurance bicycle ride to preserve the memory and sacrifice of Illinois service men and women who gave their lives in service our country. It was wonderful experience for our students and the riders greatly appreciated the show of support. Congratulations to Leyton Ellis on being designated all conference in golf at today's CIC meet! Congratulations to Addison Darush, Alexis Britton, and Esther Miller on earning all conference designation in golf at today's meet! Congratulations to Caden Ellis, Leighton Burcham, Drew Rogers, and Tim Lawyer on earning all conference designation in golf! Tonight the Sullivan Redskins take on the Meridian Hawks at the SHS Gym starting with JV at 6PM and Varsity at 7PM. Cant make it? Watch Live on our YouTube Channel. youtube.com/sullivanschool300. Reminder for parents of Project HELP students: Project Help will not be having class tomorrow on Friday, September 21, 2018. Enjoy you’re extended weekend! One week until Picture Day! 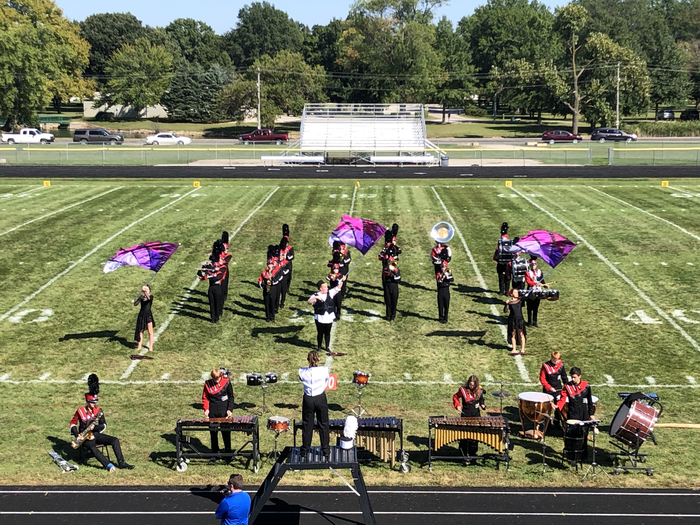 It was a great day for a band competition! Great job hosting the Sullivan Marching Band Competition! Thanks to Mr. Schaefers and all the parents and volunteers who helped make the day a success! The day was capped off by an excellent performance by our own Marching Redskins! 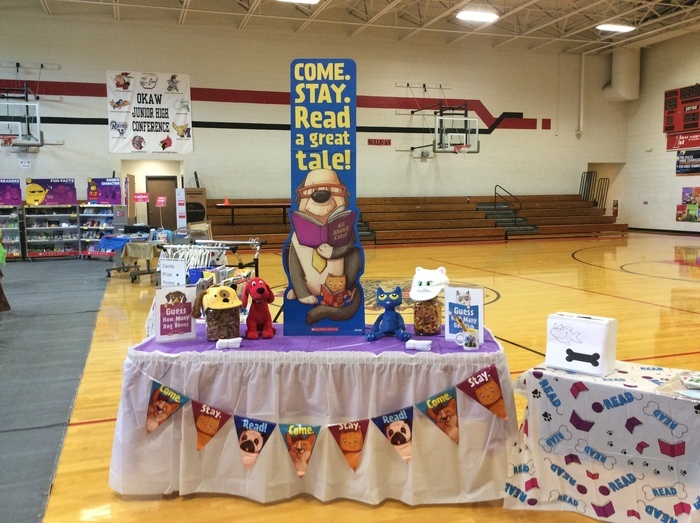 Thank You to everyone who supported out Pawsome Book Fair! Because of you we earned $2250 for our library, 73 books were donated to our classroom, and countless other books are being enjoyed by our students! 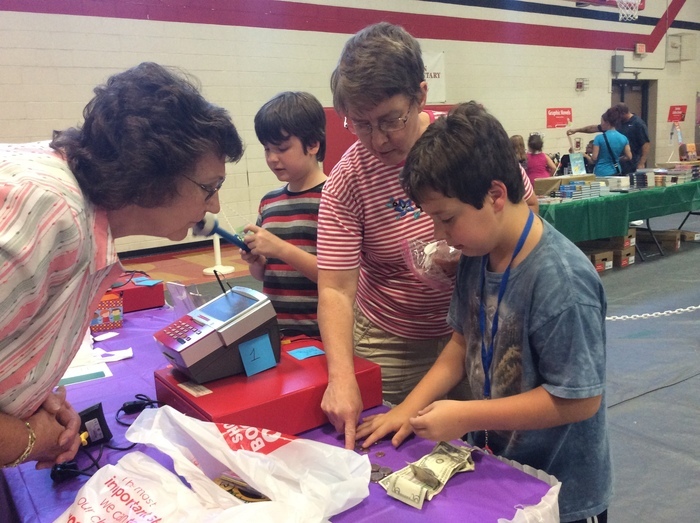 Also a very special THANK YOU to our wonderful book fair volunteers! SHS JV and Varsity Volleyball hosts Monticello High School at 6:00 PM in the SHS gym. Cant make it? Watch Live on Youtube.com/sullivanschool300. All current and retired Military and First Responders get into tonight’s game for free. 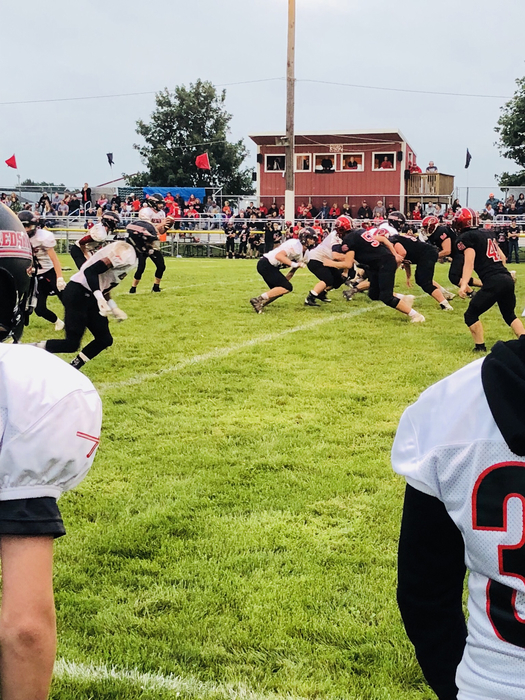 The SOV JV Football game scheduled for Monday 9/3 in Sullivan has been cancelled. Congratulations to the SHS Boys Golf team on winning the Olney Golf Invite; Caden Ellis was Medalist! #onetribe! Come out and support SHS Student Council Spaghetti Supper! They will be serving until 7PM. Tickets are $8 for adults and $6 for children. Carry out available. 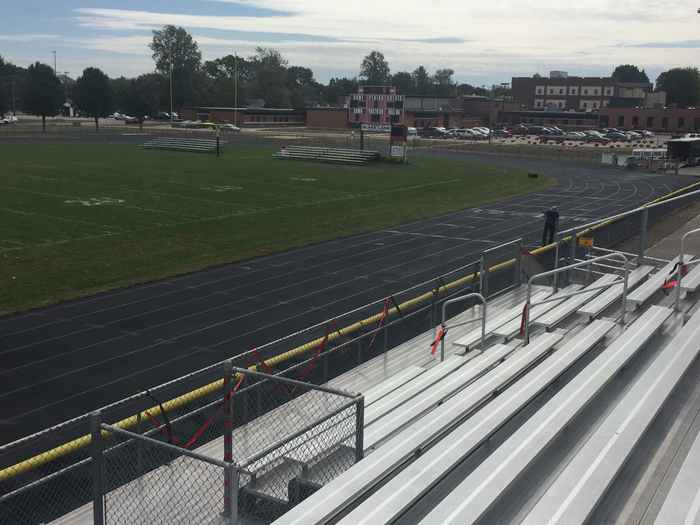 Come on out and stay for the first SOV home football game! 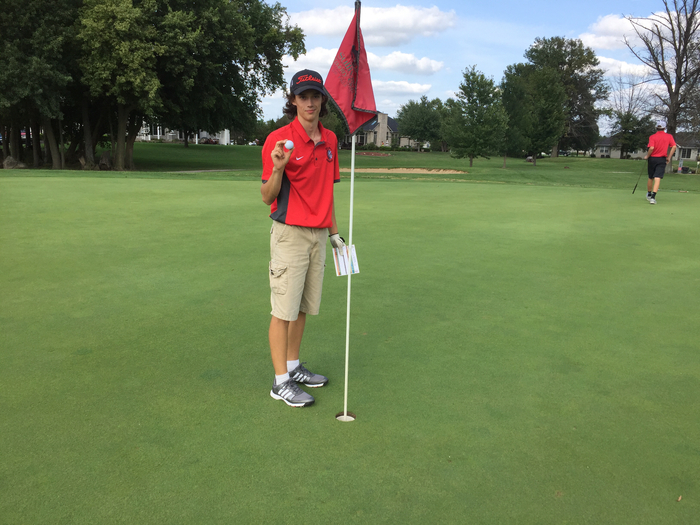 Congratulations to Gary Herschberger on making a hole in one at Sullivan Country Club in Thursday's match with Teutopolis! #onetribe! 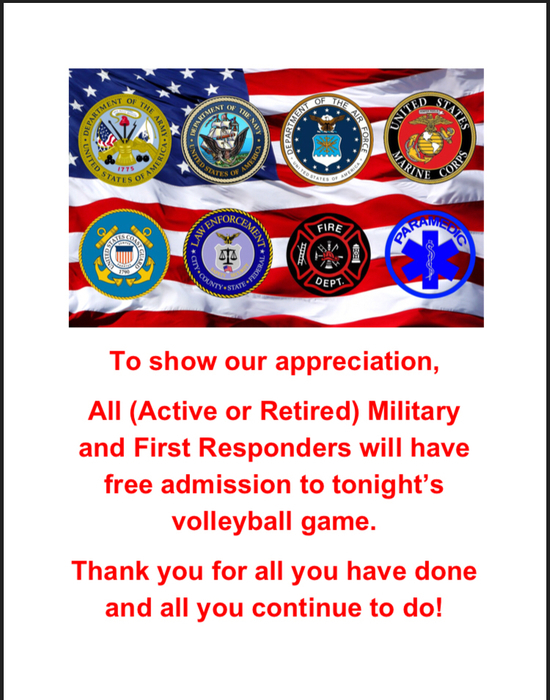 https://www.youtube.com/watch?v=2ST3uP076Qg Tonights Live Event for SHS JV and Varsity Volleyball! 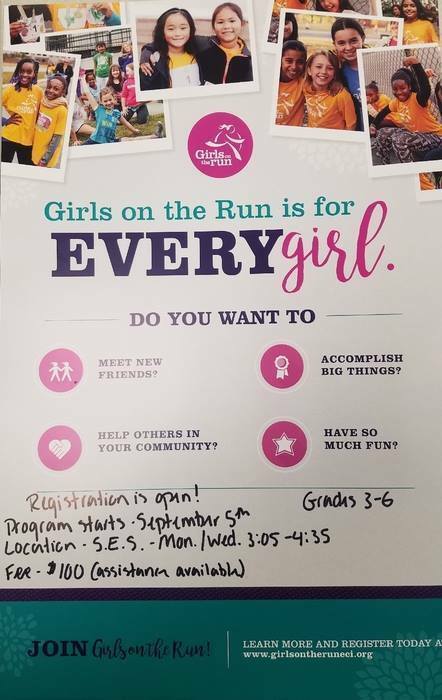 Don't miss the opportunity to have your 3rd, 4th, 5th, or 6th grade girls in Girls on the Run! We need at least 6 more girls signed up by Friday or the program will be canceled. It is a great opportunity for them to bond with classmates, learn discipline, and learn how to maintain a happy and healthy lifestyle! The SMS softball games scheduled today 8/25 at Windsor have been pushed back to a 12:00 start. Sullivan will play at 12:00 and then immediately after first game concludes. The SMS Baseball games scheduled for today 8/25 at Effingham have been cancelled due to field conditions. Girls on the Run will be available for 3rd through 6th grade girls this year! The SMS softball game scheduled for today 8/20 in Sullivan has been cancelled due to field conditions. Reminder for SES Parents: Thursday, August 23rd is Parent Night starting at 6 pm! This is a night for parents to learn about their child's classroom. We ask that children do NOT attend. We will start with a brief meeting in the gym and then will open the hallways for you to see where your children will spend their weekdays. Hope to see you all there! Attention Incoming Freshman to Sullivan High School- Reminder Freshman Academy is tomorrow (Tuesday) from 1:00 p.m. to 3:00 p.m. at SHS! Come out to pick up your iPad, meet your teachers, attend great breakout sessions, and see your friends! See you there! We hope that all of our students have had a relaxing summer and we are excited to welcome students back to our buildings in the VERY near future. This is also a reminder that school begins with a full day on Wednesday, August 15th for all students except Kindergarten, who will only have a set time to meet with their teacher on this day. As we finalize bus routes for next year, we do need to have all students registered by noon on Thursday, August 9th. We also have a number of students from whom we need medical paperwork. If you are having trouble with registration, please call the building secretary for the school at which your student attends. Thanks and we look forward to seeing your students soon! We have gotten several questions, so we would like to clarify that orientation is for students only from 2:30-4:30. 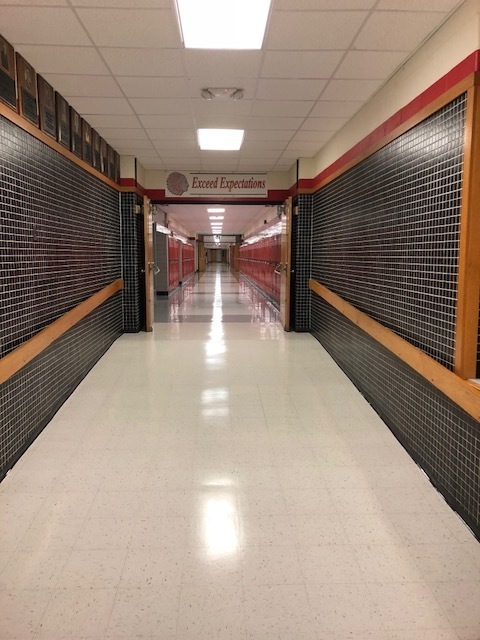 The parent session will begin at 4:35 and the building will remain open until 5:15 for students to show their parents around and stock their lockers. Here is an updated school calendar for SES. The only major change is the K-2 Christmas Concert being moved to December 11 from December 13 due to a scheduling conflict. SMS baseball tryouts for 6th, 7th, and 8th grade boys will be 7/30 and 7/31 from 5:00-7:00 PM at Middle Diamond. SMS Softball Tryouts for 6th, 7th, and 8th grade girls will be on 7/23 from 7:30-10:30AM at North Diamond. Need current physical to tryout. Registration will begin July 19th on-line and will be from 12-7 at the high school media center on July 26th for those who need to come in to register. More information and directions for on-line registration will be mailed out before those dates. 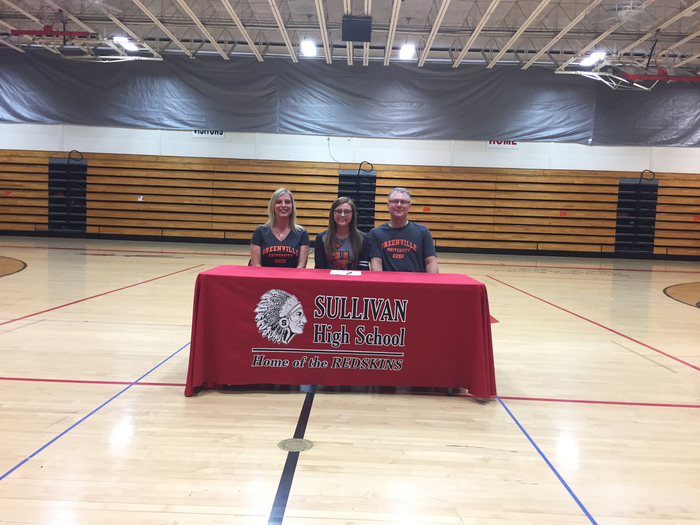 SBL Sullivan Clinic is conducting Sports Physicals today from 1:30 PM to 5:00 PM for $20.00. Cash or check only will be accepted. Sullivan Middle School - Mark your calendars! We will be having New Student Orientations on August 6th and 7th. Incoming 5th graders are encouraged to attend on the 6th and incoming 6th graders are encouraged to attend on the 7th; however, students in either grade are welcome both days. Students new to the district and entering 7th or 8th grade are also welcome to attend either day. Additionally, we will have open locker day for 7th and 8th grade students on August 8th from 8am-3pm. 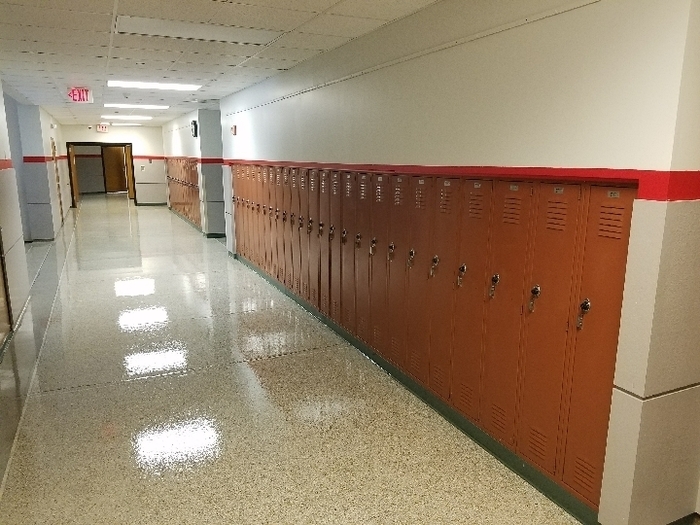 Students in 7th and 8th grade are welcome to come move into their lockers at that time. 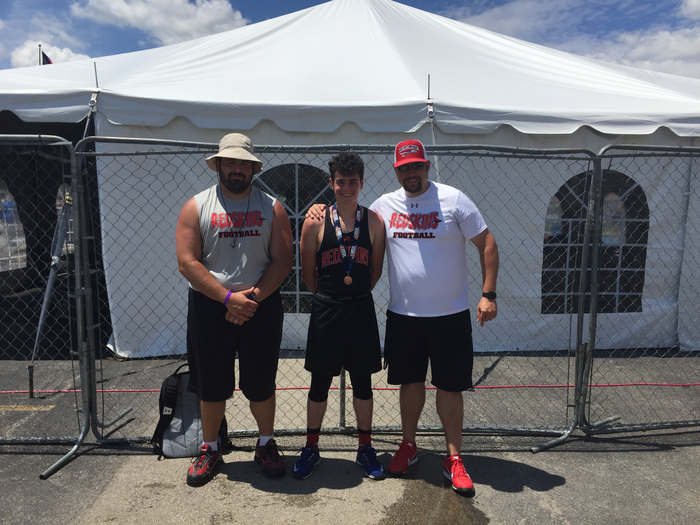 Congratulations to Jadon Nuzzo on placing 5th in pole vault in the IHSA Class A State Track Meet! #one tribe!! Good luck to Jadon Nuzzo in the IHSA State Track Meet finals in pole vault today! Congratulations to both Jadon Nuzzo and Logan Pedigo for competing in state track meet; Nuzzo qualifies for finals in pole vault Saturday with a 13'3" vault! Good Luck to Jadon Nuzzo and Logan Pedigo at the IHSA Srate Track Meet today in the pole vault competition! 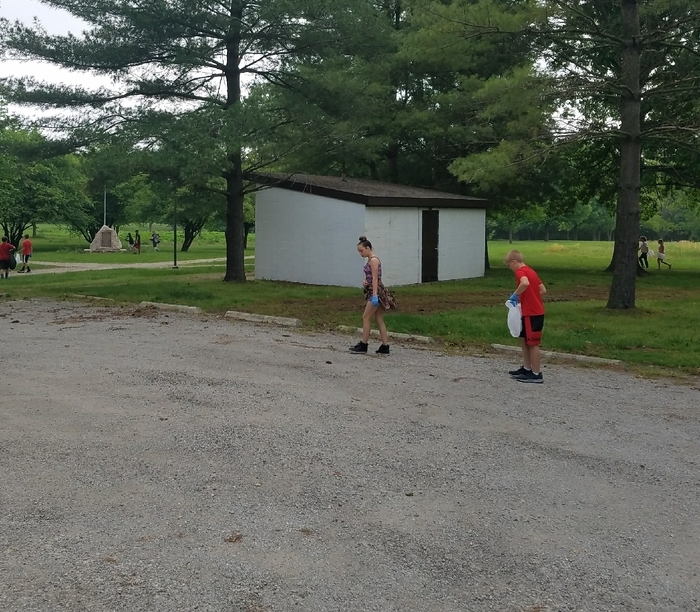 5th Grade spent part or their morning picking up trash at the parks and schools. 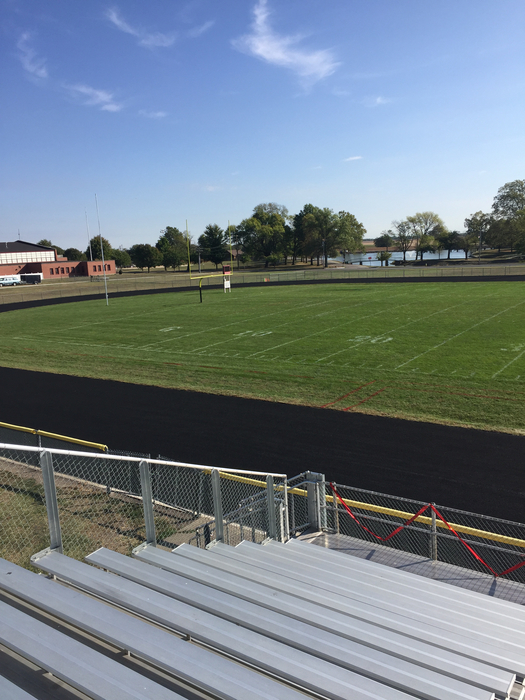 Good luck to Ben Bushue, Cassidy Short, and Lilly Null as they compete in the IESA State Track Meet this weekend! Nuzzo vaulted 14'9" and finished 1st while Pedigo finished 3rd with a vault of 13'2"! Congratulations to Jadon Nuzzo and Logan Pedigo on qualifying for the IHSA State Track Meet at Sectionals last night in pole vault! Walton, Miller, Rose, and Cameron finish with a time of 4:23.08 in the 4x400 at the IHSA State Track Meet! 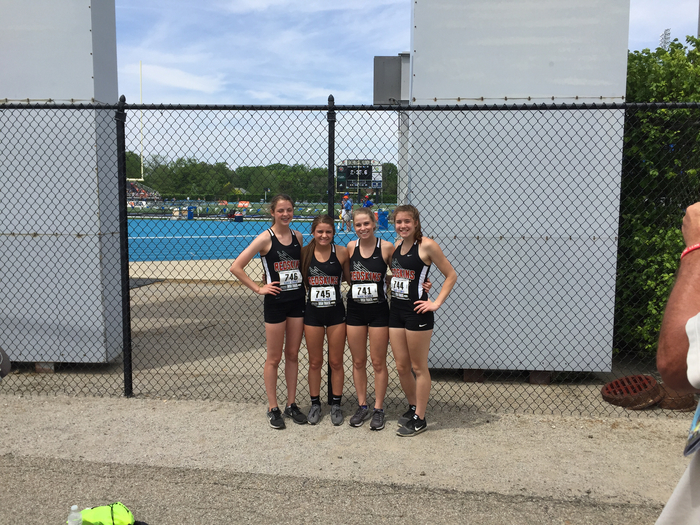 Good luck to Haley Rose, Laine Cameron, Esther Miller, and Zoe Walton in the 4x400 meter dash at the IHSA State Track Meet! Esther Miller jumps 32'8" in second triple jump at IHSA State Track Meet! 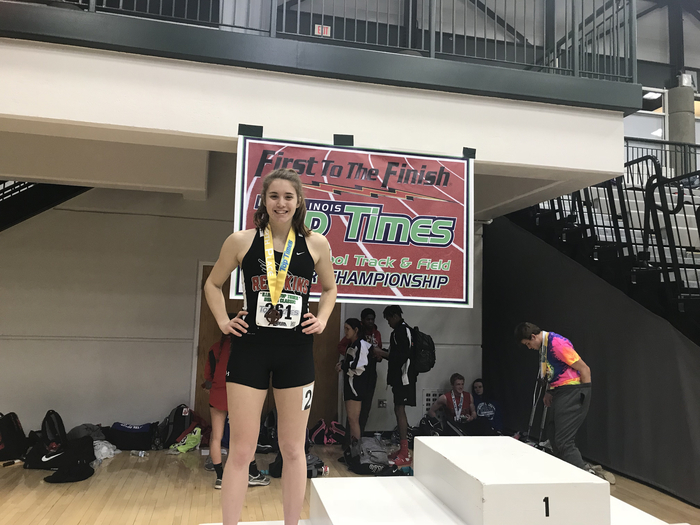 Esther Miller jumps 31' 8" in first triple jump at IHSA State Track Meet! 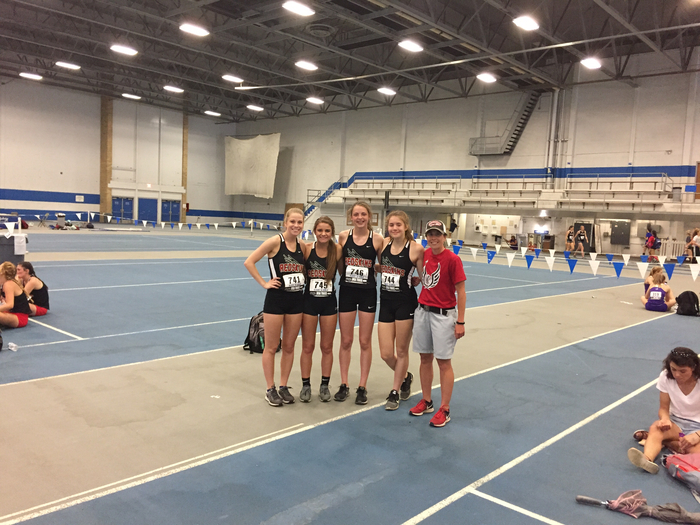 Congratulations to Zoe Walton, Esther Miller, Haley Rose, and Laine Cameron for qualifying for the IHSA state track meet last night at sectionals in Sullivan! Congratulations to Ben Bushue on qualifying for the IESA state track meet last night in pole vault! 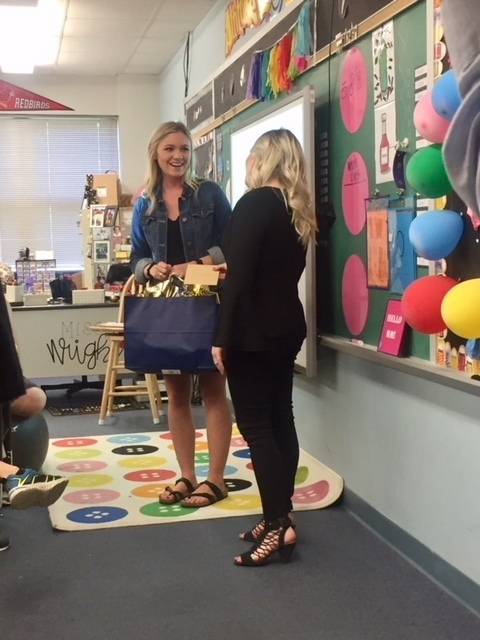 In recognition of Teacher Appreciation Week, RV Horizons held a nationwide teacher recognition program. Ms Becky Lawson received the most votes and recognition. Representatives from RV Horizons flew in from Colorado to present her with the award. Mr Troy Rogers and Ms Allison Wright were also recognized for the large number of votes they received. 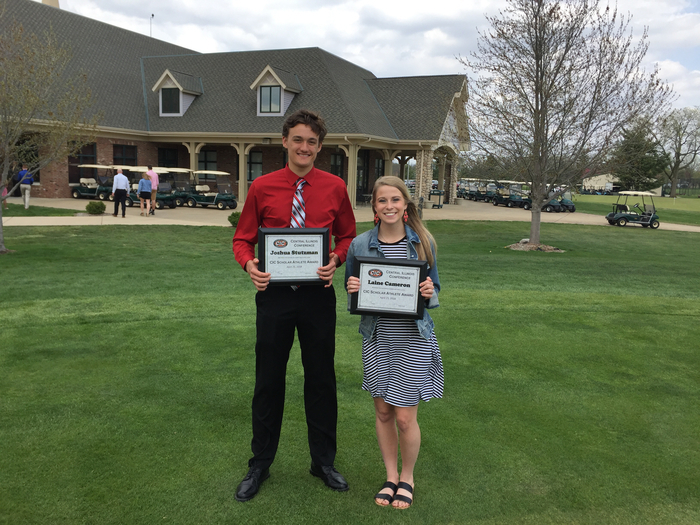 Congratulations to Sullivan CIC Scholar Athletes Laine Cameron and Josh Stutzman! Congratulations to the Sullivan Lady Redskins track team on their 2nd place finish at the Redskin Invite last night! 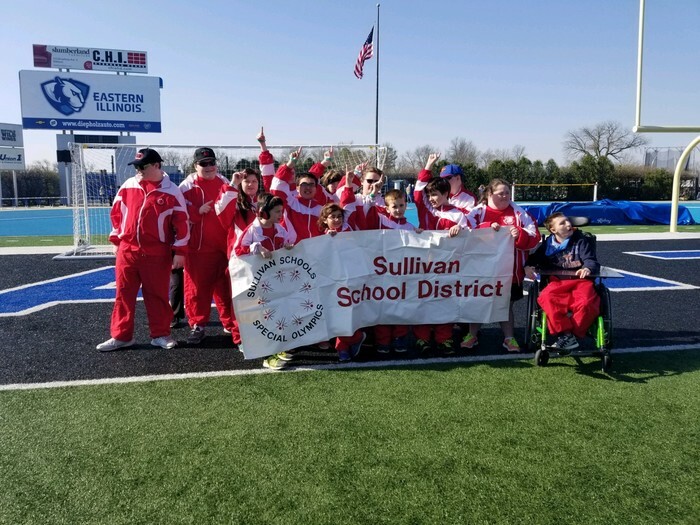 Sullivan representation at the Special Olympics! 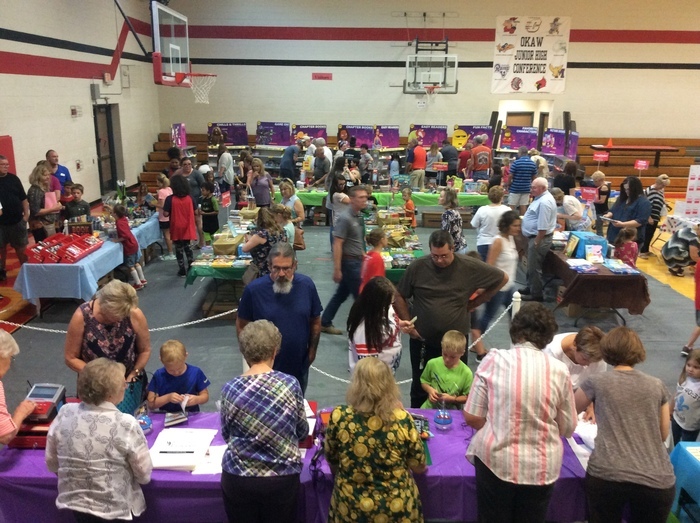 The SES PTO and the Sullivan Ministerial Association are partnering up to help provide free school supplies to students who qualify for free and/or reduced lunch. 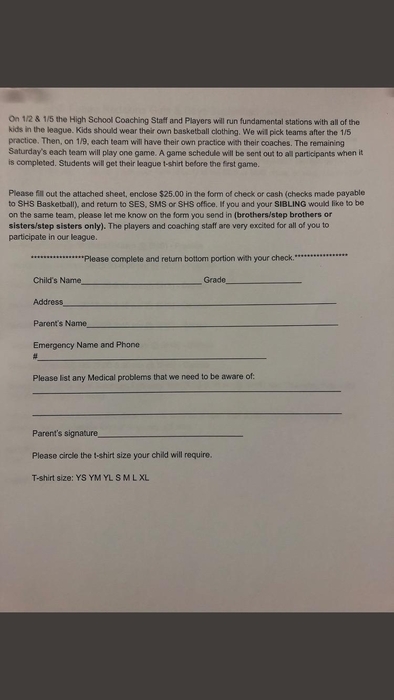 The attached form will also be sent home with SES students and made available in the SMS and SHS offices. Forms must be returned to the SES office no later than June 15th. 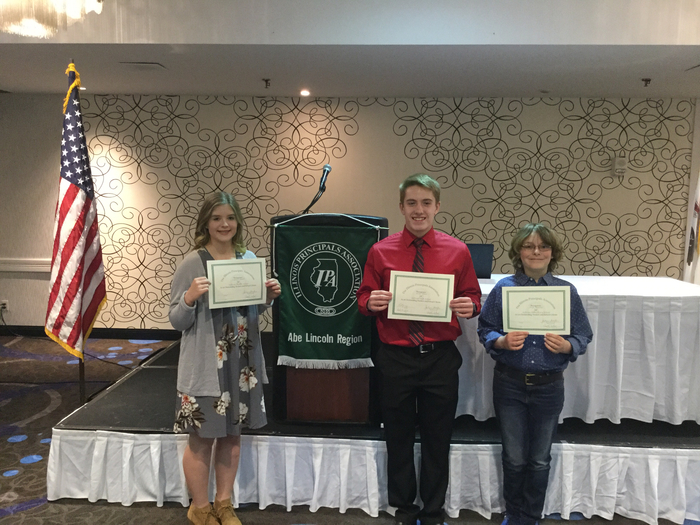 Congratulations to Caprice Smith, Jacob White, and Ivan Moxley who were recognized as school leaders by the Illinois Principals Association this morning in Springfield. Great job students! Sullivan defeats St. T 7-0 in varsity baseball and 15-5 in varsity softball! #onetribe! Congratulations to Jadon Nuzzo on breaking the school record in Pole Vault last night at the Tri-County Track Meet vaulting 14'6"! 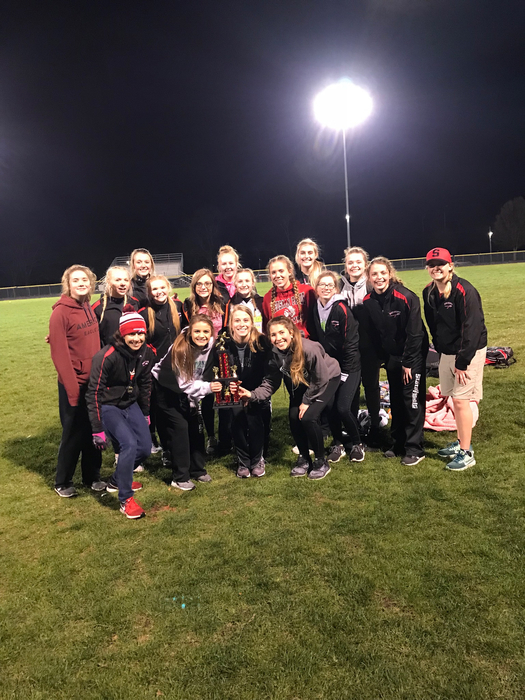 Congratulations to the SHS Girls Track team on finishing first in the Tri-County Track Invite last night! The baseball and softball games scheduled for today 3/27 at Tuscola have been cancelled due to the weather. Makeup date TBD. Sullivan defeats Pana 8-7 in varsity softball! #one tribe! This is Ted Walk, Superintendent of Sullivan Schools. 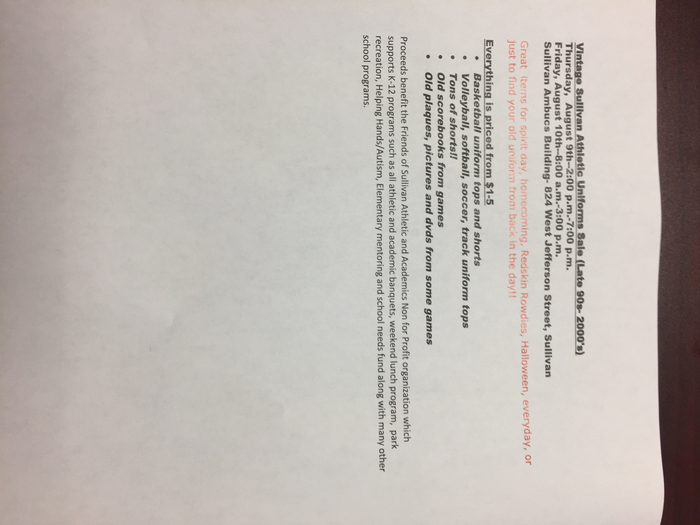 A note was discovered Friday, March 23rd, indicating a possible bomb threat to Sullivan High School. The credibility of the threat could not be immediately determined, and Sullivan Schools dismissed students starting at 1:15. 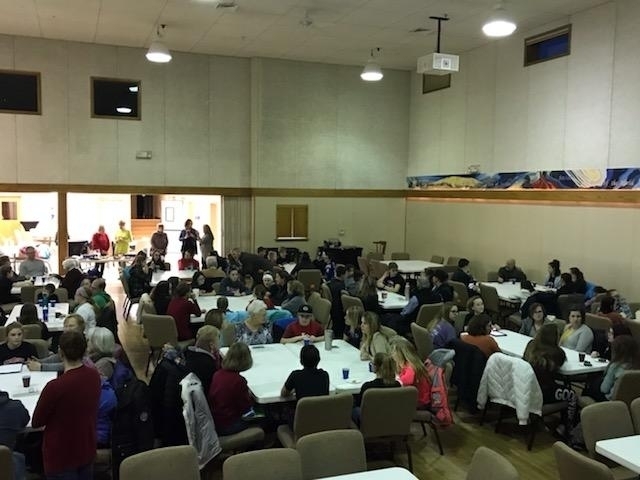 Students were relocated to the American Legion and Sullivan Civic Center for parent reunification. Law enforcement and school administration conducted a search of the buildings and grounds, and no evidence of a bomb was found. An individual was arrested in connection with these events. The administration and law enforcement believe there is no current threat to the safety of Sullivan Schools. 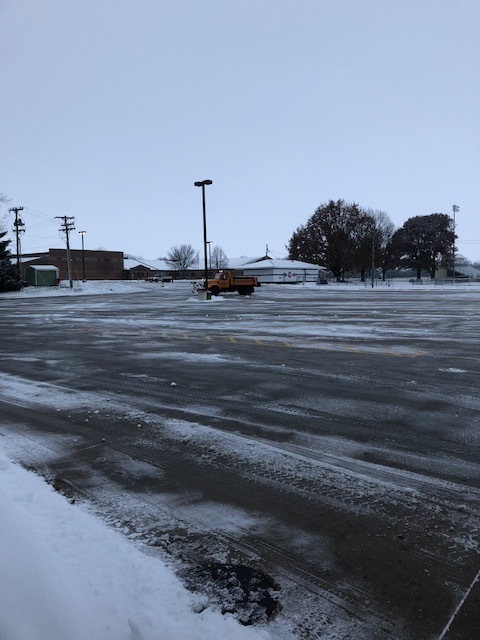 The Sullivan School District would like to thank a number of people, including the Sullivan Police Department, Moultrie County Sheriff’s Department, and Sullivan Fire Department for quick response times, as well as the bus drivers who altered arrangements to ensure students' ability to return safely home. Teachers and staff filled various roles efficiently and effectively. The accommodation of the American Legion and Sullivan Civic Center were essential for an orderly reunification. Most of all we thank the parents, students, and community who were able to adapt to the adjustment quickly and with understanding. We will continue to review our emergency and pick-up procedures in order to make improvements. Counseling will be available to any student who desires when schools resume session on Tuesday, April 3rd, after Spring Break. The safety and well-being of our students is our top priority. Thank you for your continued support of Sullivan Schools. This is Ted Walk, Superintendent of Sullivan Schools. We have just discovered a note indicating a possible bomb threat to Sullivan High School. It is not believed to be imminent, and may likely not be credible, but it is not a chance we will take. As a result, SHS and SMS students will be dismissed from school at 1:15 and SES students at 1:25. 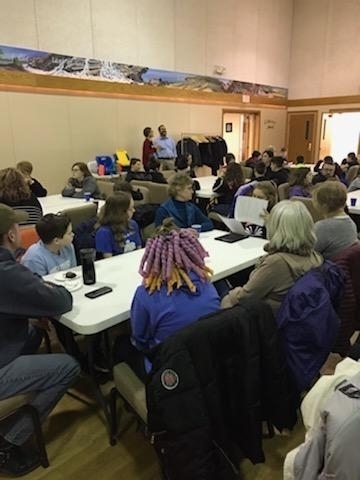 SHS and SMS students who are awaiting parent pickup can connect with parents at the American Legion. SES Parents picking students up will meet them at the Civic Center. Buses will run for all bus students. Local Law Enforcement conducted a Safety and Lockdown Drill at Sullivan High School and Sullivan Middle School this morning. These drills have been conducted at least annually for the past decade to review the lockdown procedures and enhance the safety of our schools. The district thanks Local Law Enforcement for their cooperation with the school and community. Don't miss out on all the great basketball action going on at the SHS gym Thursday, March 22nd! The Sullivan PTO is hosting a Donkey Basketball game starting at 6:30. Advance tickets are $6 and include a free set of donkey ears. Tickets at the door are $8. Free donkey rides will take place at the intermission for children ages 12 or younger. Post Prom is sponsoring a hot dog dinner before the game at 5:30 in the SHS Commons. $4 will get you a hot dog, chips, and drink. Come join us for a fun and memorable evening! One Book One Sullivan's community discussion over The Bitterside of Sweet. The community discussion will take place on Thursday, March 1 at the Sullivan First United Methodist Church at 6:00 pm. Redskins win 54-37 over Pana! Sullivan plays tomorrow against St. Anthony at 6pm in Vandalia. At the end of 3rd Period, Redskins lead Pana 41-28 in IHSA Regional. At the half Sullivan leads Pana 24-18 in IHSA Regional. 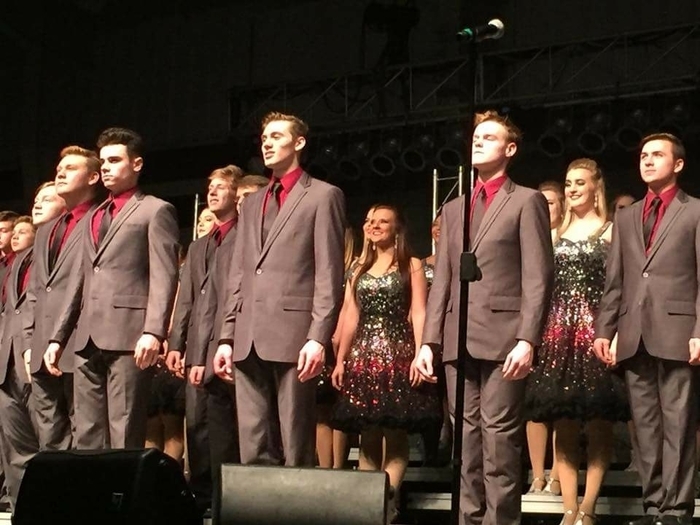 Congratulations to the Sullivan Singers for their 1st Runner up finish at El Paso! 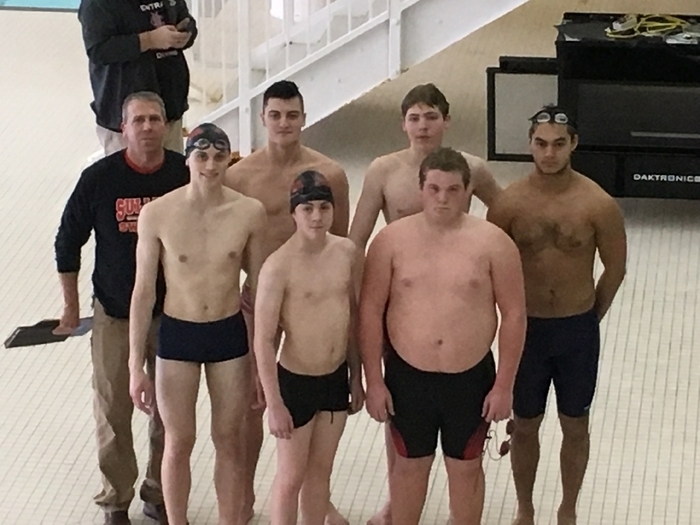 IHSA Boys’ Swimming Sectionals... let’s go Redskins! Future Redskins are hooping it up this morning! 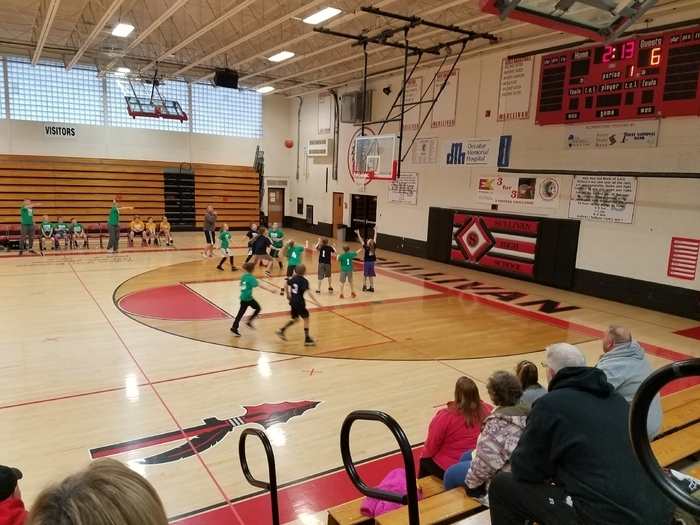 Implemented by Coach Reeder, this basketball program was created to bring basketball to 4th, 5th, and 6th graders at SES. Teams are coached by the HS boys basketball players. Sullivan defeats Clinton 43-37 in OT on Senior Night!!#onetribe!! Lady Redskins getting ready to face Teutopolis in IHSA Sectional action! #onetribe! Elizabeth Green makes 5 in first round of IHSA Sectional 3 Point Contest! 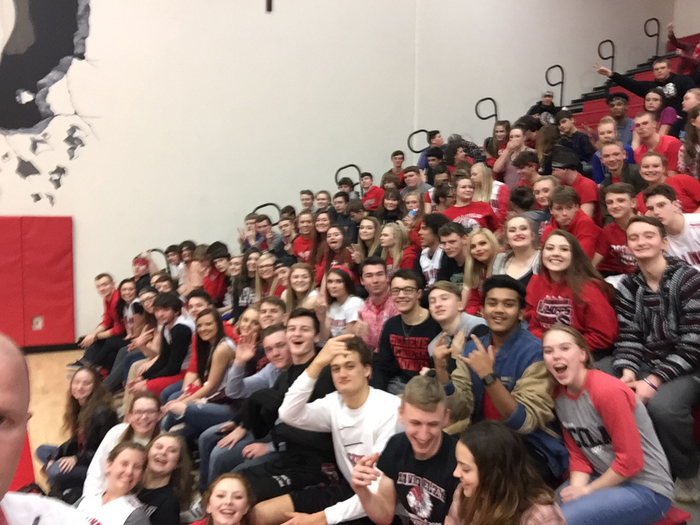 SHS Students ready to cheer on a Lady Redskins win tonight! 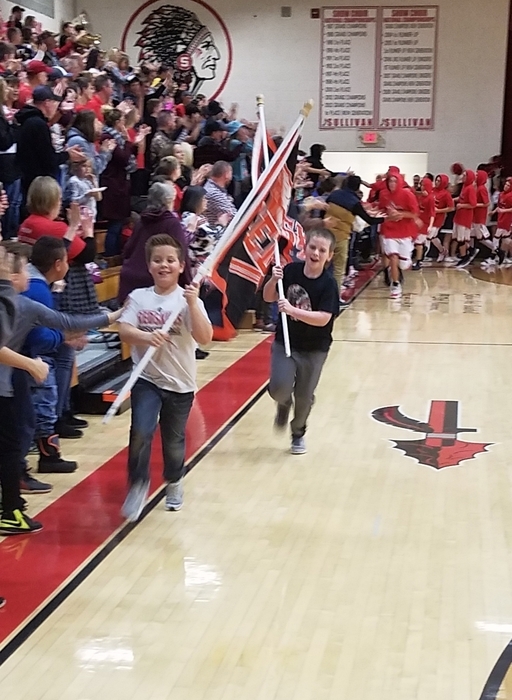 As a result of showing respect, Irvin Lawson and Camden Watkins got to lead the varsity boys basketball team onto the court before Tuesday's game. 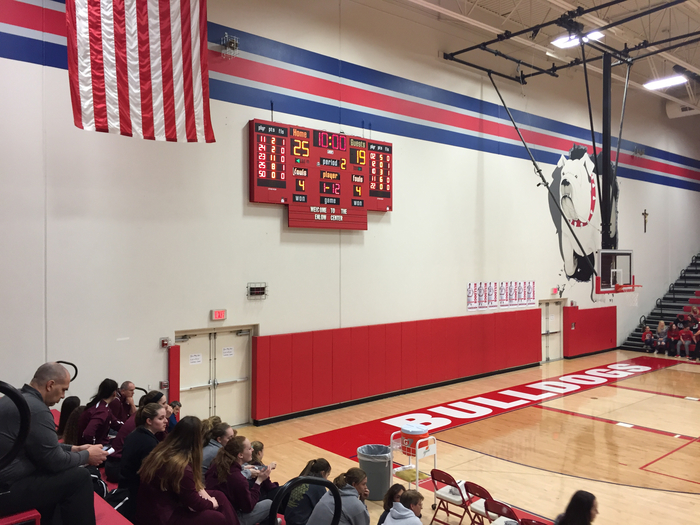 Lady Redskins lead Marshall 35-31 after three quarters in IHSA Girls Sectional! Lady Redskins face Marshall at 6:00 at St. Anthony High School! Go Lady Reds!! Don't forget to order your 2017-2018 SES yearbook! Orders are due by Friday, February 16th! Yearbooks are only $15! If you order online, you have a chance to win free personalization on your keepsake! Online orders can be done at www.jostensyearbooks.com by searching Sullivan Elementary School. Lady Redskins getting ready to face Tuscola in IHSA regional championship in Arthur! #onetribe! 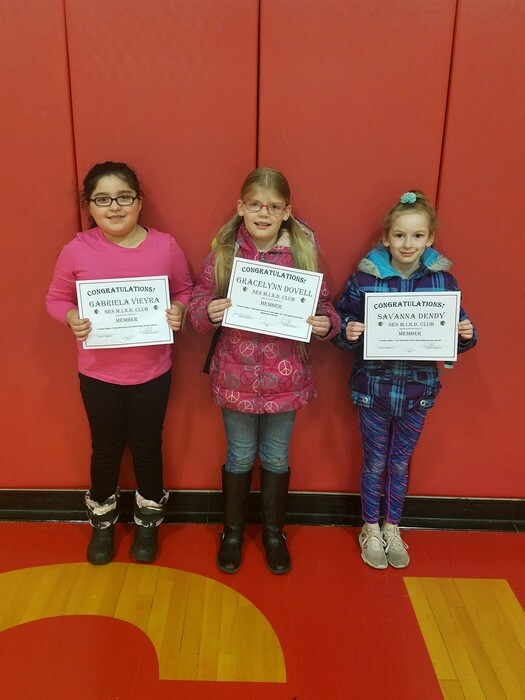 Congratulations to the first 3rd Grade members of the MIND (Math Is Not Difficult) Club! 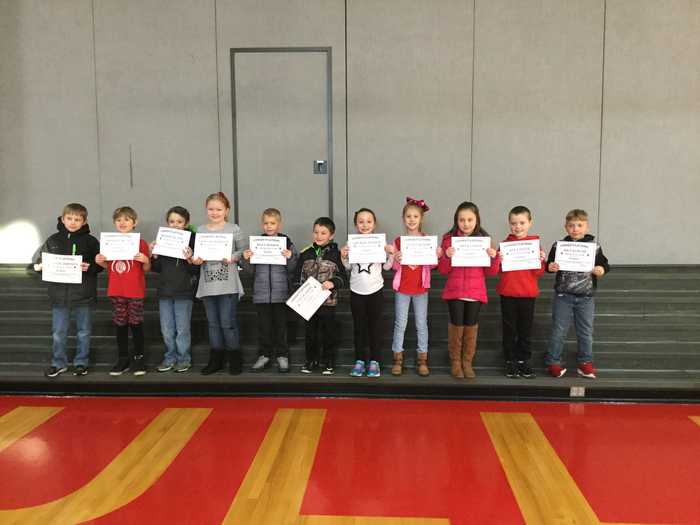 Congratulations to the newest 2nd Grade members of the MIND (Math Is Not Difficult) Club! 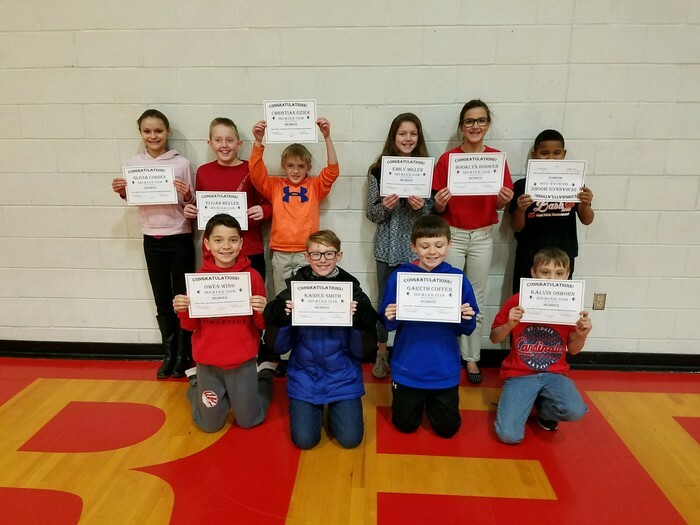 Congratulations to the newest 5th Grade members of the MIND (Math Is Not Difficult) Club! Found this little guy hanging out in the cold at SMS when we returned from Danville. He was taken out to animal control to get out of the cold and get something to eat. 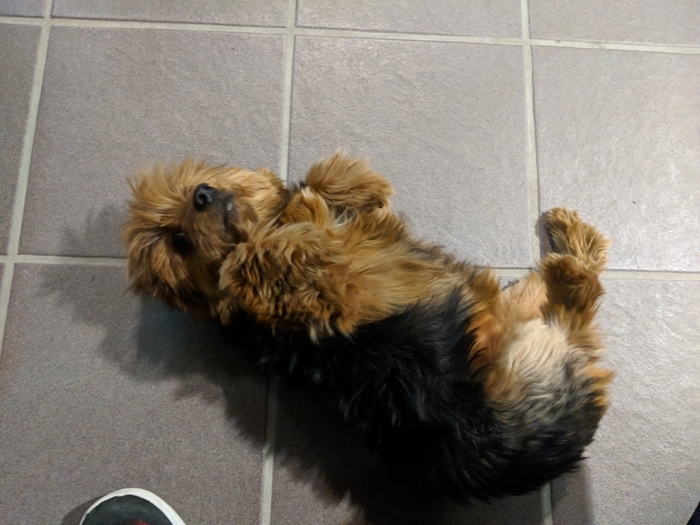 Please contact them if this is your dog. 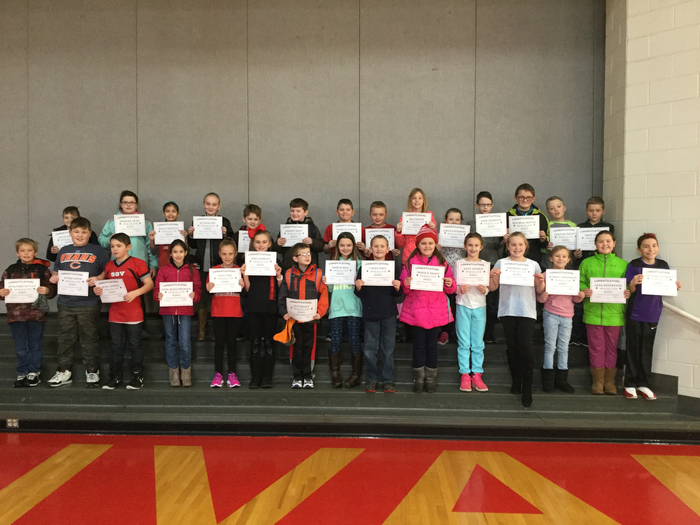 Congratulations to this year’s first 5th Grade members of the MIND Club (Math Is Not Difficult)! In order to make the club, 5th grade students must be able to do mixed multiplication and division facts through 12 with 100% fluency on Reflex Math. 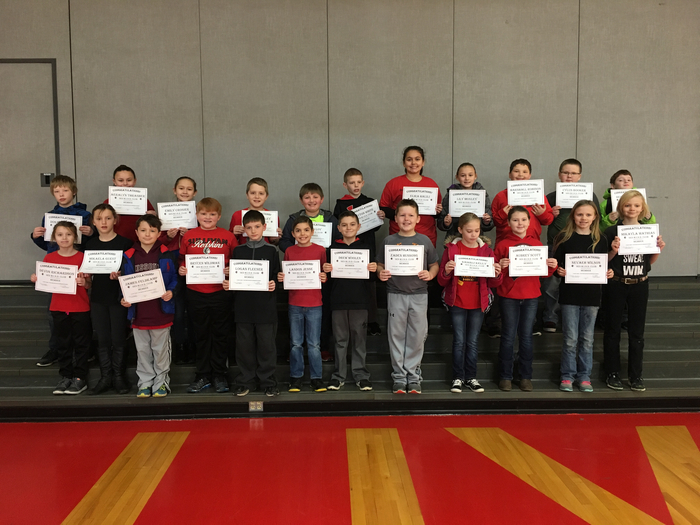 Congratulations to the newest 4th Grade members of the MIND (Math Is Not Difficult) Club! In order to be in the club, 4th grade students must master multiplication facts through 12, scoring 100% fluency on Reflex Math. 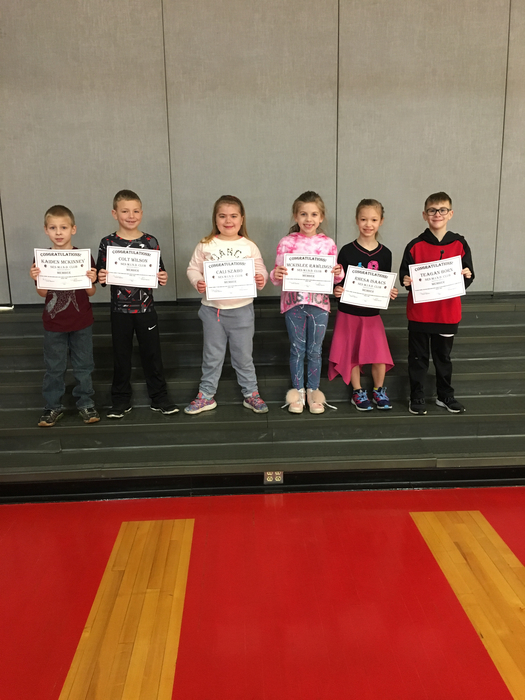 Congratulations to the newest members of the 2nd Grade MIND (Math Is Not Difficult) Club! This is just a reminder to be stressing the importance of internet safety with your children. If your child has social media accounts, we encourage you to have conversations with them about the nature of their interactions with others online. Make sure they know not to accept friend or follow requests from people they do not know and that they should never share inappropriate images regardless of their relationship with the other party. As much as possible, check on what they are posting and look through their contact list for anyone you don’t know. Our children are growing up with a level of connectivity that seemed impossible only a generation ago, and we all need to work together to ensure they learn to navigate it appropriately. 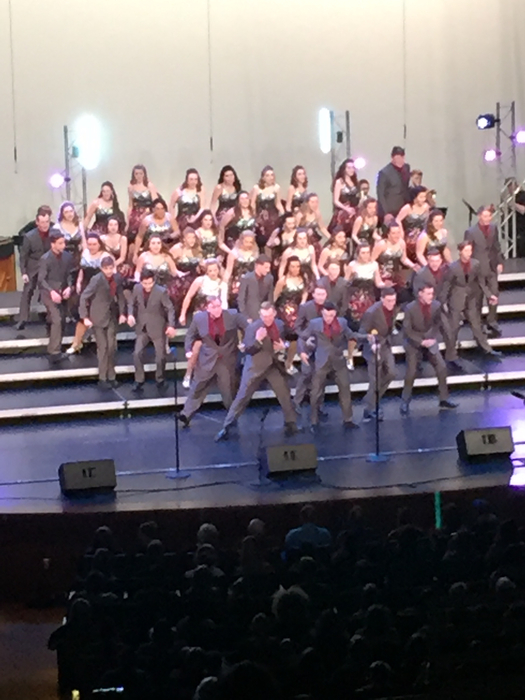 Sullivan Singers did great this afternoon at Mt. Zion! Boys Basketball vs St. Teresa getting ready to tip off at 6PM. Spanish Club Taco Night also going on until 7PM. $5 for great food! Come out and support the Redskins! 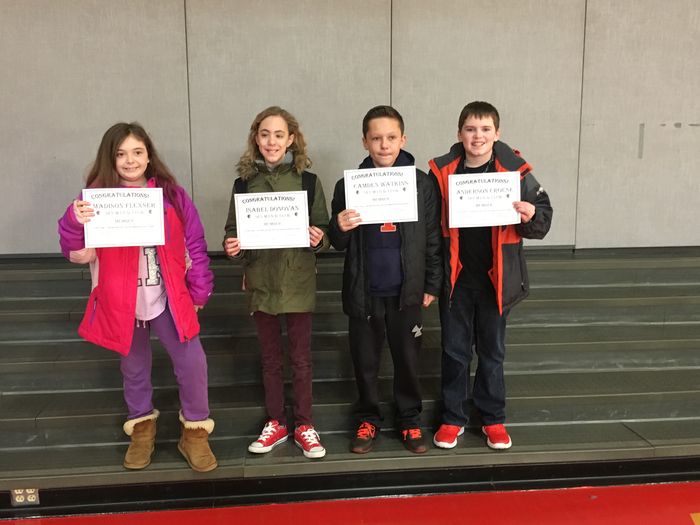 Congratulations the first members of this year’s 4th Grade MIND (Math Is Not Difficult) Club! In order to make the club, 4th grade students must master multiplication facts through 12 with 100% fluency on Reflex Math. Congratulations to the first members of this year’s 2nd Grade MIND (Math Is Not Difficult) Club! In order to make this club, students must do 100 mixed addition and subtraction facts in 6 minutes with 100% accuracy 3 times! Freshman Orientation will still be held tomorrow night (1/17) at 6PM in the Commons. All current 8th grade students and their parents are encouraged to attend. The night will include sharing information about the transition to high school, teachers will be on hand to discuss programs, and there will be an Activity Fair. Contact the high school office if you have questions. Due to extreme temperatures and windchill, Sullivan Schools will not be in session on Tuesday, January 16. Stay safe! Due to the weather, all regularly scheduled practices and sporting events for this afternoon and evening have been cancelled. A decision on regularly scheduled athletics events for tonight 1/15 will be made by noon today. Due to inclement weather conditions, Sullivan Schools will not be in session on Monday, January 15, 2018. Due to weather, the start time of the middle school volleyball games tonight will be at 5:00 PM in the SES Gym. Due to icy road conditions, Sullivan Schools will not be in session on Monday, January 8th, 2018. Stay safe. 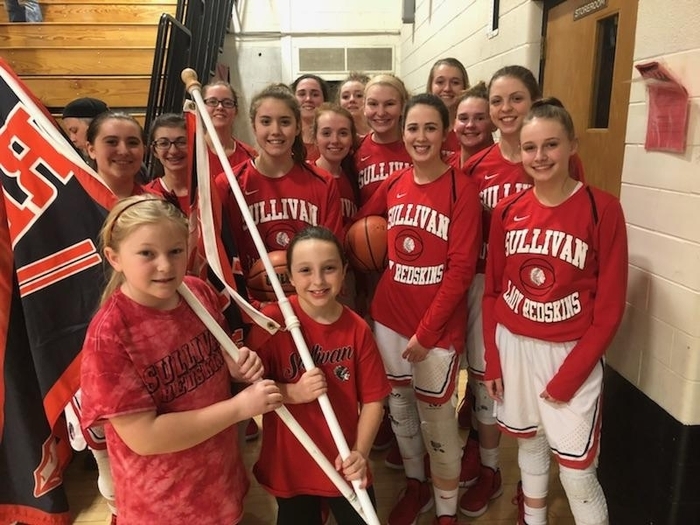 Sullivan Lady Redskins defeated Neoga 51-25. 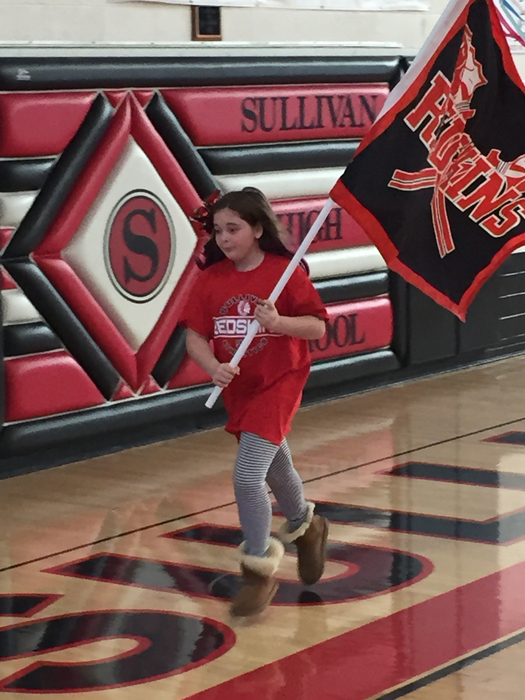 As a result of showing respect at school, Madison Flexsor was chosen to lead the varsity girls basketball team onto the court in Saturday afternoon’s game against Neoga. 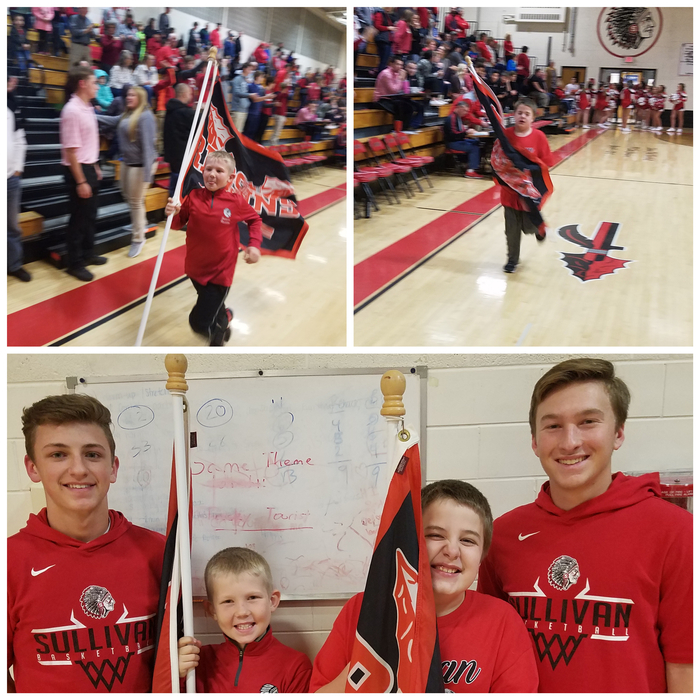 As a result of showing respect at school, Drew Woolen and Landon Jesse were chosen to lead the varsity boys basketball team onto the court in Friday night's game against Tuscola. To erase any doubt, the forecast has the windchill six degrees warmer tomorrow than today, so Sullivan schools will be in session on Friday, January 5th. Make no mistake, however, it is still really, really cold. Be sure to bundle up and be safe! 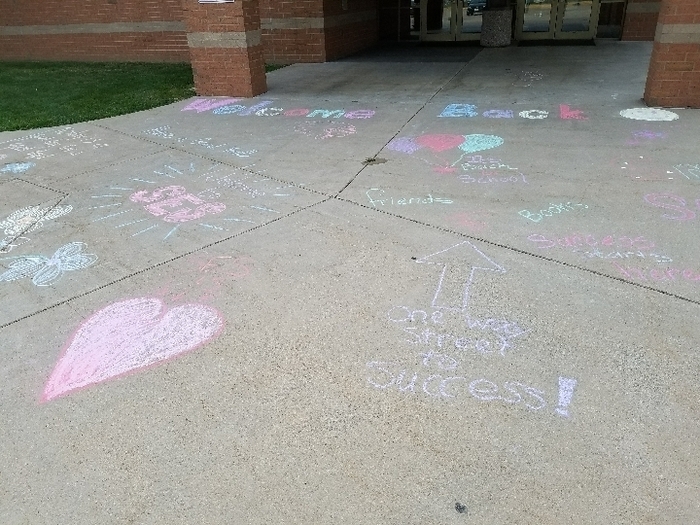 We look forward to welcoming our students back! Good evening. This is Ted Walk, superintendent of Sullivan Schools. Due to extreme temperatures and windchill, school will not be in session on Thursday, January 4th. Stay safe and warm! Freshman Orientation for the Freshman Class of the 2018-2019 School Year (current 8th Grade students) will be held on Wednesday, January 17th at 6PM in the High School Commons. Information about courses, scheduling, course requirements, and activities will be covered. Please make plans to attend. If you have questions, please contact the high school office at 728-8311. Sullivan defeats Salem in OT 40-36; wins Consolation title in Mattoon Holiday Tourney! Congratulations Lady Redskins! 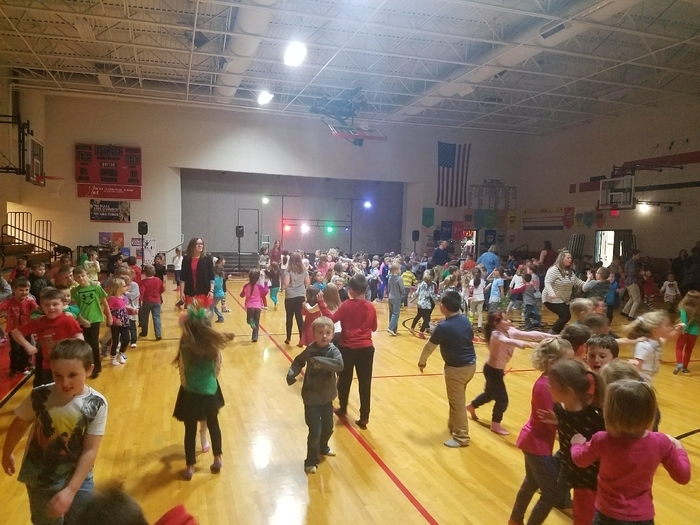 It's now time for the Kindergarten through 2nd Grade sock hop with DJ Jazzy Schaefers spinning the discs. 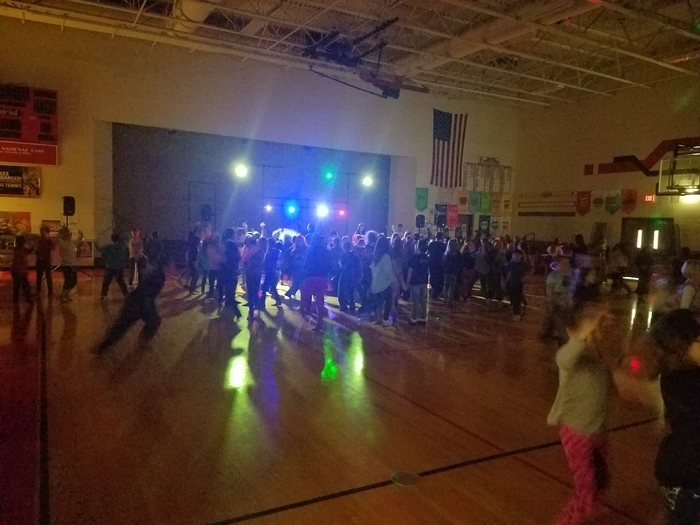 SES 3rd through 5th Grade sock hop brought to you by DJ Poppy Ann Graham! ESPN has nothing on tonight's broadcast crew at the Varsity Girls basketball game. Thanks for training this fine young crew, Mr. Waelde! 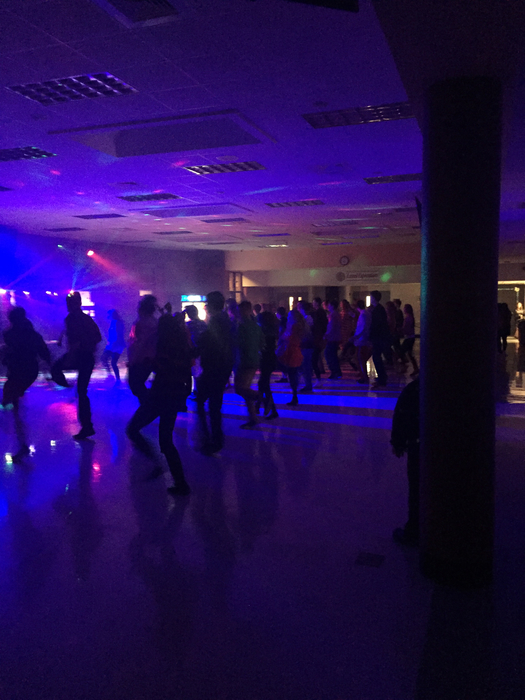 Ugly Sweater Dance at the SHS! 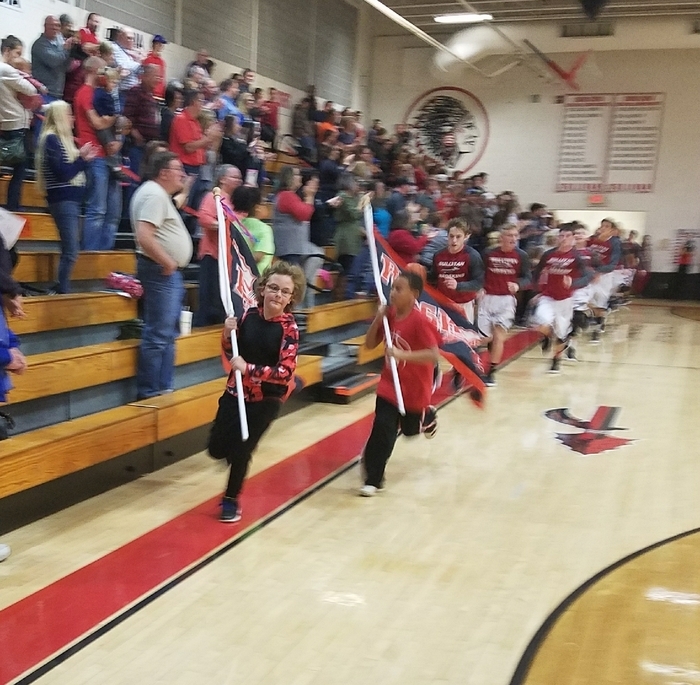 As a result of showing respect, SES students Zamir Scott and Ivan Moxley got to lead the varsity boys team on to the court tonight. Great job boys! For at least the past three years, this young man has always offered to help bring Sullivan “TheCube” events to you without hesitation. I am privledged to have such an awesome production assistant! Thank you Caden! 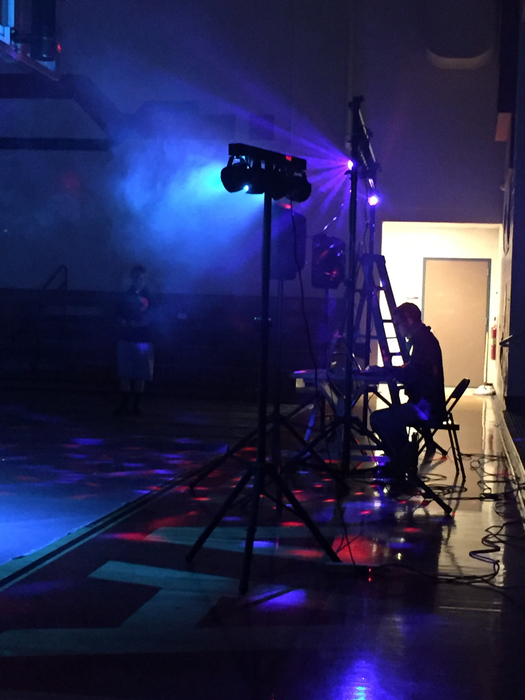 Mr. Schaefers spinning the tunes for the SMS Hay Day Dance! 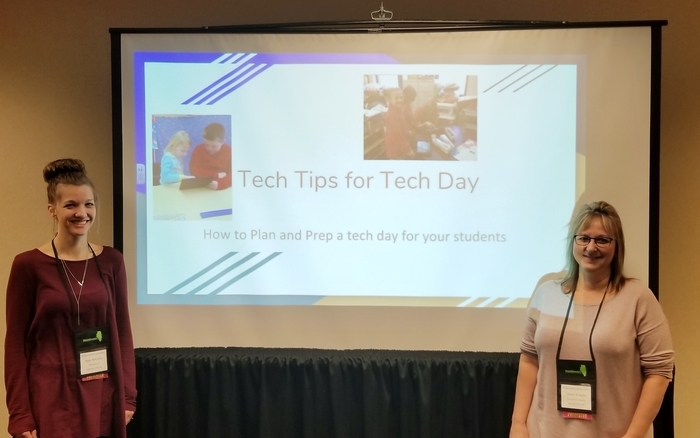 We are very fortunate to have Val Kalagian and Annie McClellan working hard every day to assist with technology use in our classrooms. Today they are sharing what they have learned with others by presenting at the Illinois Education and Technology Conference. 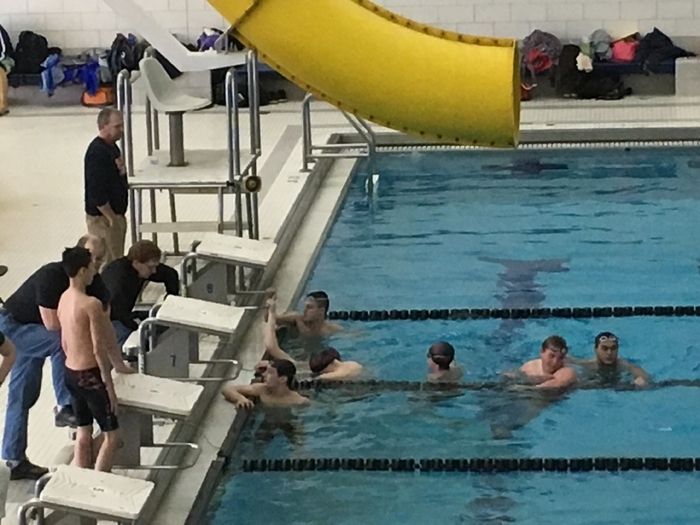 Congratulations to Natalie Drury, Anna Wooters, McKenna Kull, and Alison Oligschlaeger on qualifying for the IHSA State Swim Meet next weekend! 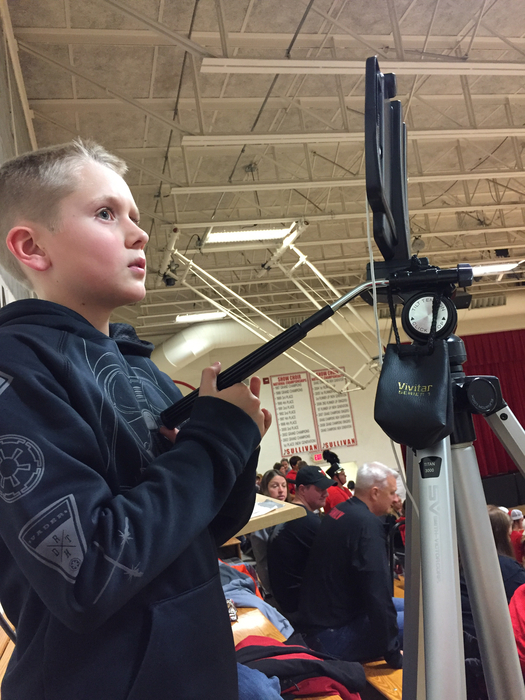 SHS is in need of an announcer for high school boys and girls basketball games this season. Contact Mr. Aikman at the high school if interested. Good luck to Logan Pedigo and Katherine Kite in IHSA Sectional Cross Country competition today! 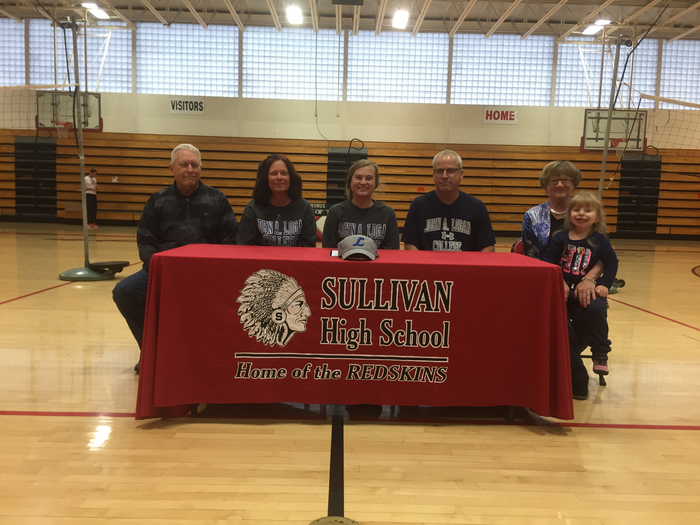 Sullivan C.U.S.D. #300 is in need of Substitute Teachers. Please visit http://www.roe11.k12.il.us/licensure/ to learn more about obtaining your Substitute License. 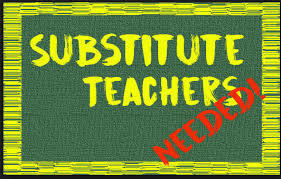 Once licensed, please contact the school district to be placed on our substitute list. Please contact us at (217) 728-8341 with questions. 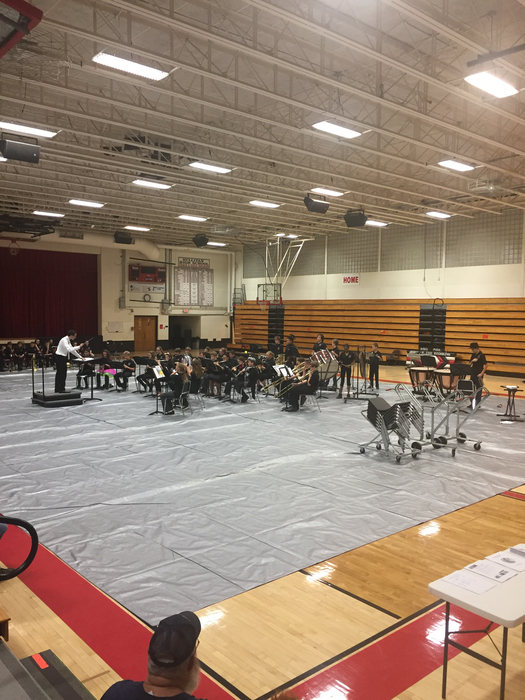 7th and 8th Grade Band sounded spooktacular at the Middle School Band Concert tonight! 6th Grade family members did great, too! 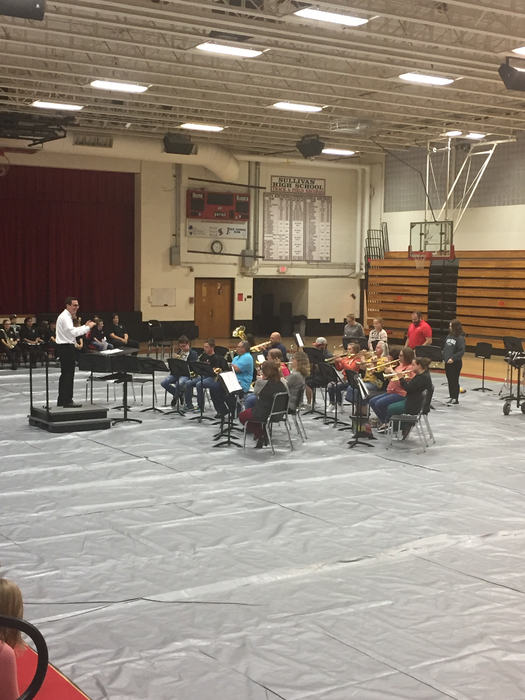 6th Grade Band sounding great at tonights Middle School Band Concert! Congratulations to Katherine Kite and Logan Pedigo on qualifying for IHSA sectionals in cross country today! Caden Ellis shoots 75 today at IHSA State Golf Tourney to finish 12th overall in 1A at 13 over Par. 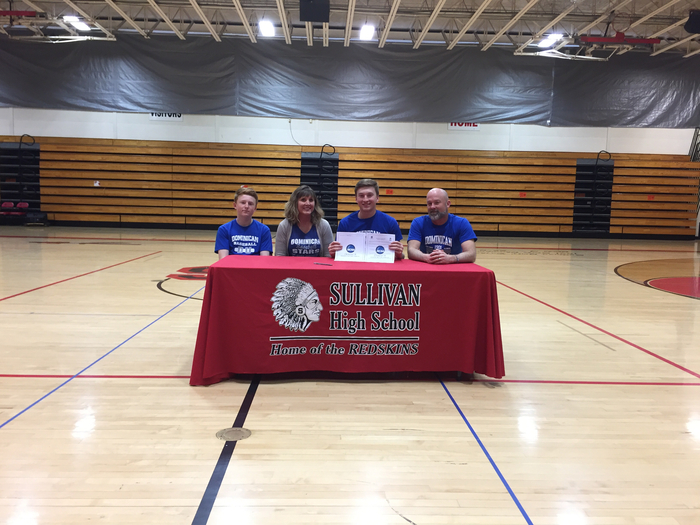 Congratulations to Caden! Caden Ellis shoots an 82 today at the IHSA State Golf Meet! 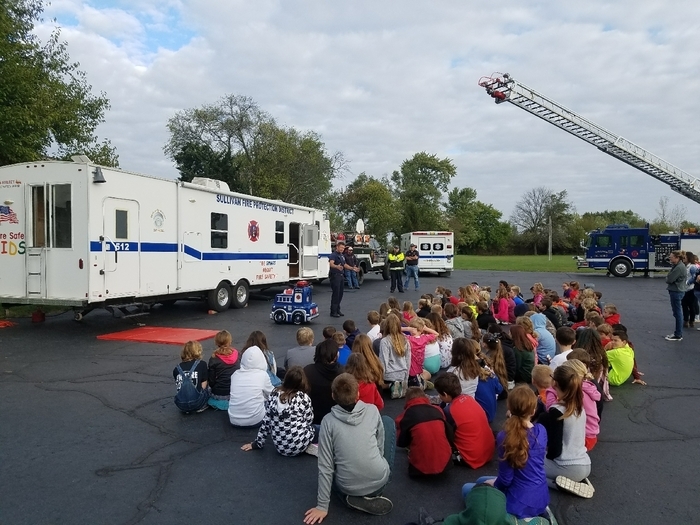 The Sullivan Fire Department came out to the elementary school to teach the students about fire safety. The students were engaged throughout the presentations. Great job Sullivan Fire Department! Good luck to Caden Ellis today as he competes in the IHSA State Golf Meet! 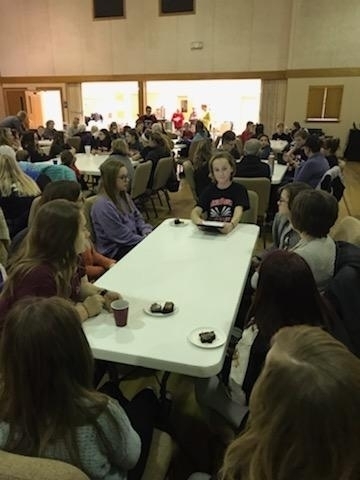 3rd, 4th, and 5th graders were treated to a book tasting at the “Bluestem” café. 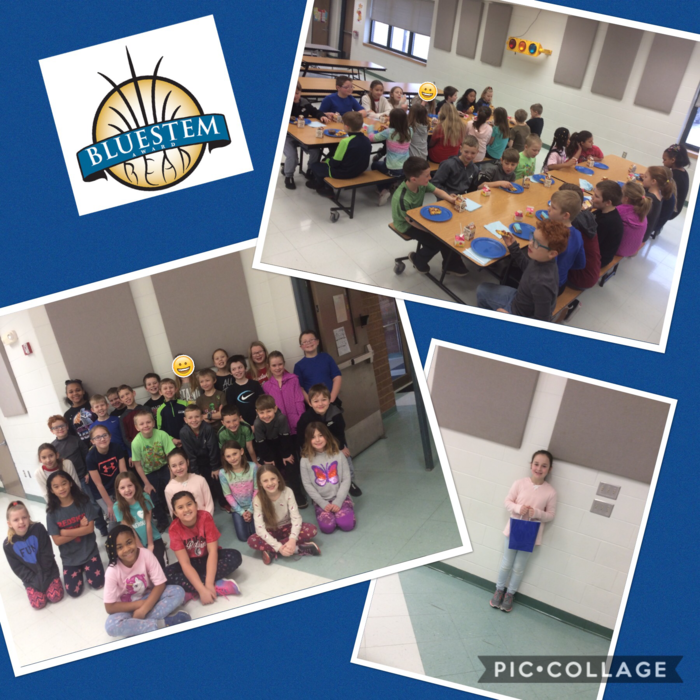 Students were given a menu that listed all of the Illinois State Bluestem Nominee books. Then they got to “sample” the twenty different Bluestem books. 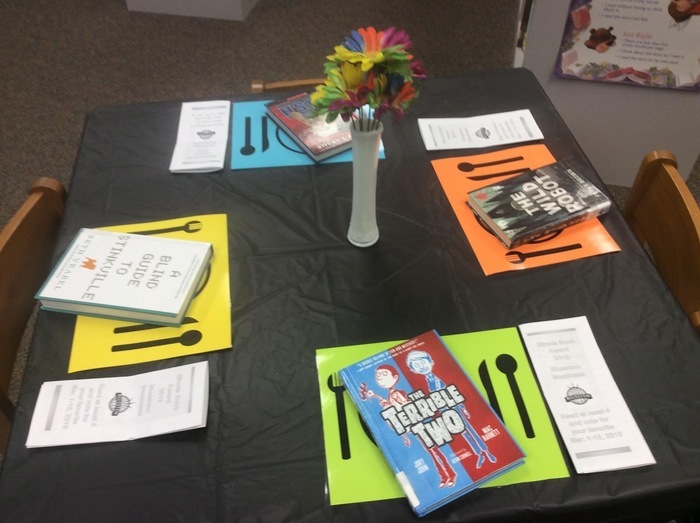 While sampling, they highlighted the books that most interested them in their menu. Our Bluestem Café was complete with dinner music, and fireplace on the smartboard, and even flowers on the table. 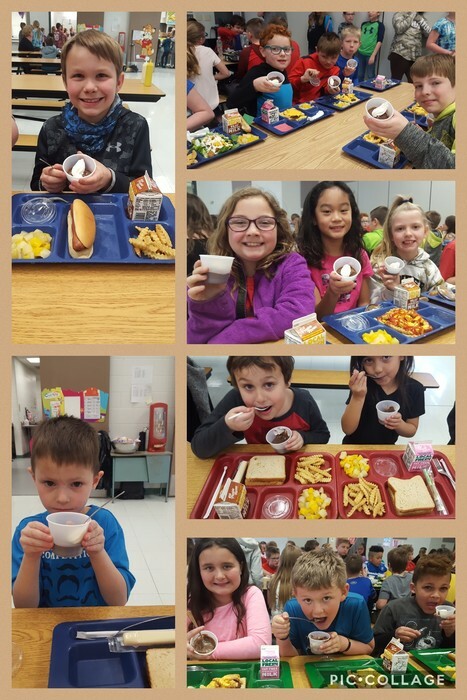 Students were expected to have their best restaurant manners as well. Bluestem Nominee books will be available for student checkout in the SES library. Students who read at least four of the Bluestem Nominee books will be eligible to vote for the State award in March. 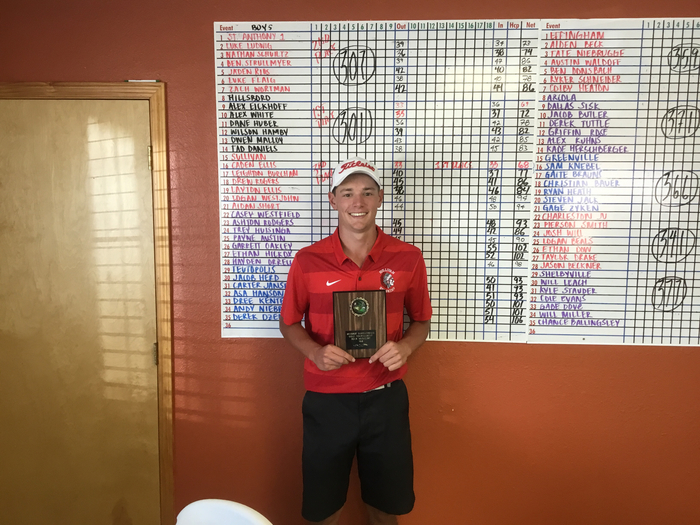 Congratulations to Caden Ellis on finishing 8th in Golf Sectionals today and qualifying for state! Congratulations to Addison Darush and Esther Miller on qualifying for IHSA Golf Sectionals! 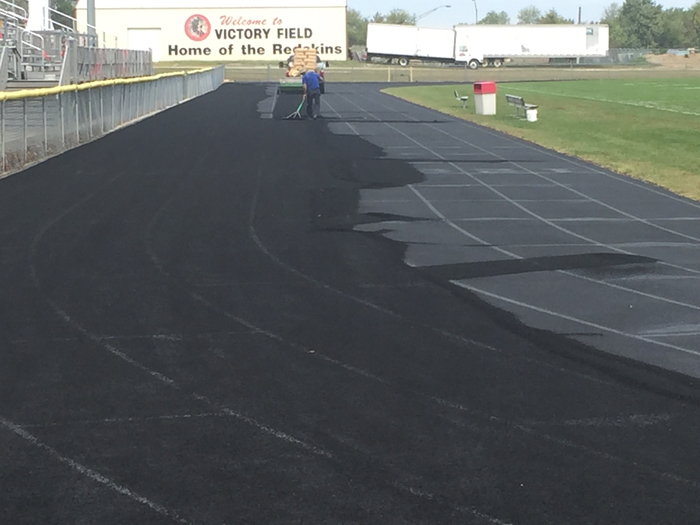 Work continues on the Sullivan School District Track. The Track is not available until October 2, 2017. 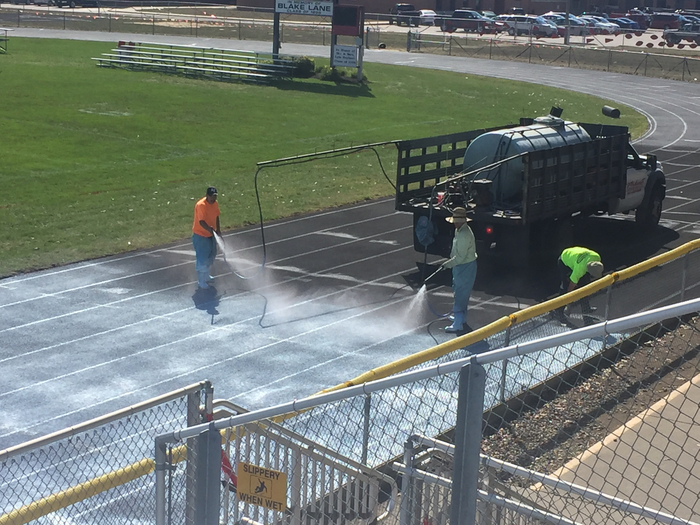 The Sullivan School District track is currently being refinished and will not be available for use until Monday, October 2. All-conference golfers from Sullivan at today's CIC Tournament were Caden Ellis, Leighton Burcham, Aiden Short, Drew Rogers, and Addison Darush! Congratulations to the SHS boys and girls golf teams on winning the CIC Golf Tournament today! This Friday, September 29th, SES will be having a Good Behavior Celebration for students who met the predetermined behavior parameters. Students will be playing tropical-themed games during this Hawaiian Day celebration. We encourage students who so desire to wear appropriate Hawaiian clothing, such as tropical print shirts or dresses. The dress code will still be enforced. We are looking forward to a volcanically fun day! 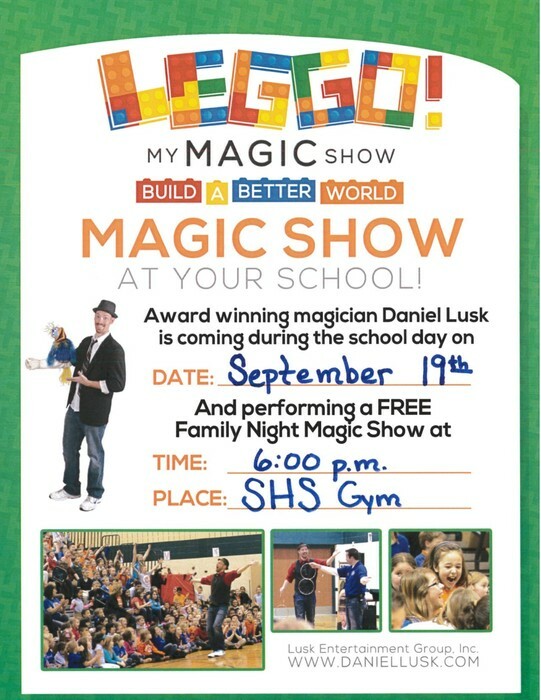 Families of SES students, Don't forget to come see Daniel Lusk perform this evening at the SHS gym at 6! Fun for the whole family! National Day of Service/9-11/Patriot's Day Assembly. Watch it live: http://thecube.com/e/746386. Mrs. Graham's assistants looked every bit the part with their matching outfits, hair style, and walkie talkies! One of the brightest parts of Graham's day is spending time with the littlest of learners. A phone message went out earlier to parents of SES students to remind them that PTO fundraiser orders are due tomorrow, September 7th. It was also sent out as a reminder of the book fair and Grandparents Night on the 14th. We apologize if you did not receive the call as we are still working out some kinks in our new all-call system. 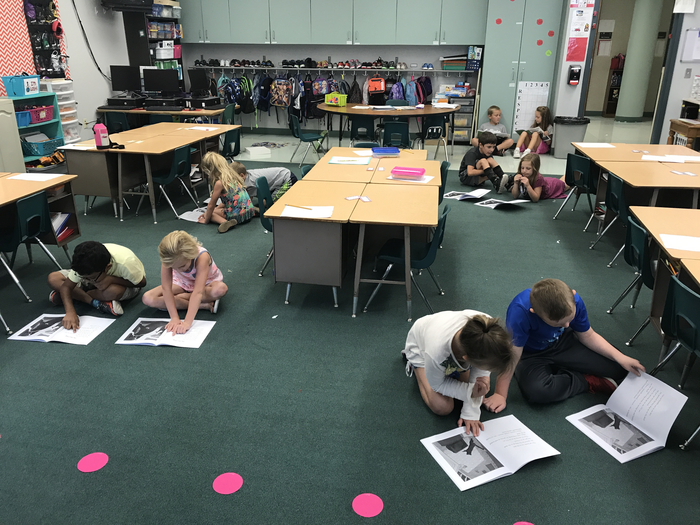 Mrs. Watkins's second grade students are really enjoying the new Engage New York curriculum. Today they partner read a story about The Cat Bandit, titled "The Hot Dog". It was an exciting day at SES! 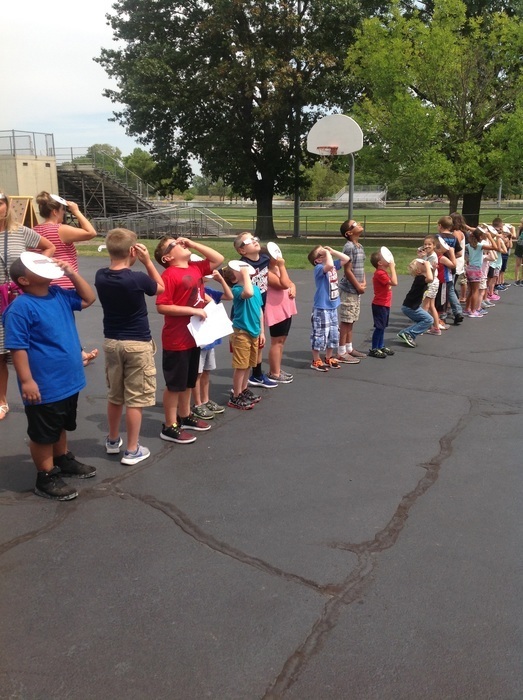 Teachers put together some great lessons to accompany the solar eclipse and students loved having the opportunity to see it! Students and teachers alike did a wonderful job of being cautious. Here you can see the older students interspersed with the younger students to help them view the eclipse safely. Quick reminder that the SES parent night is this THURSDAY, AUGUST 24TH. It will start at 6 pm in the gym, then move to individual classrooms. Parents only, please. The SMS Softball game at Monticello today will be at the Monticello High School Softball field, not White Heath at 4:30. SHS Fall Sports Preview Night is Friday August 18th at 5:00 starting out on the football field. Please come out and support the Redskins! 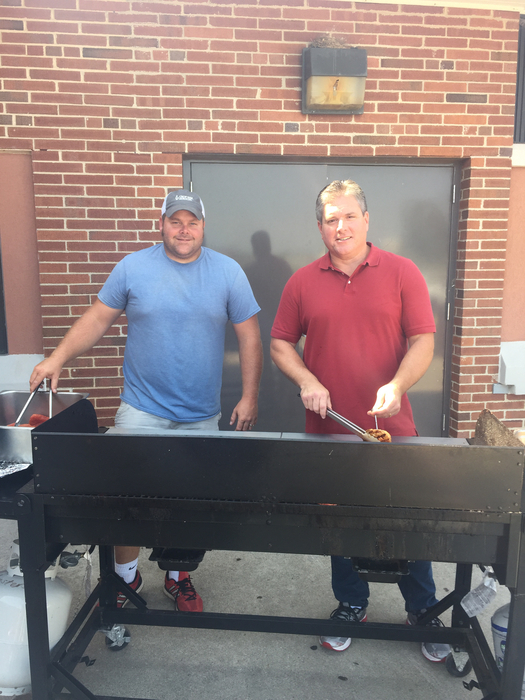 School Board President Jeff White and Board Member Tyson Grooms giving back to teachers by grilling lunch! Welcome Back Teachers! 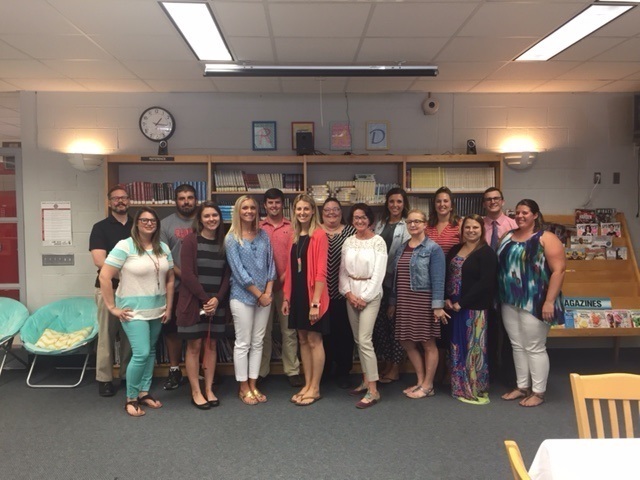 Sullivan CUSD #300 welcomed new teachers today! We are looking forward to a great year with you here in Sullivan! 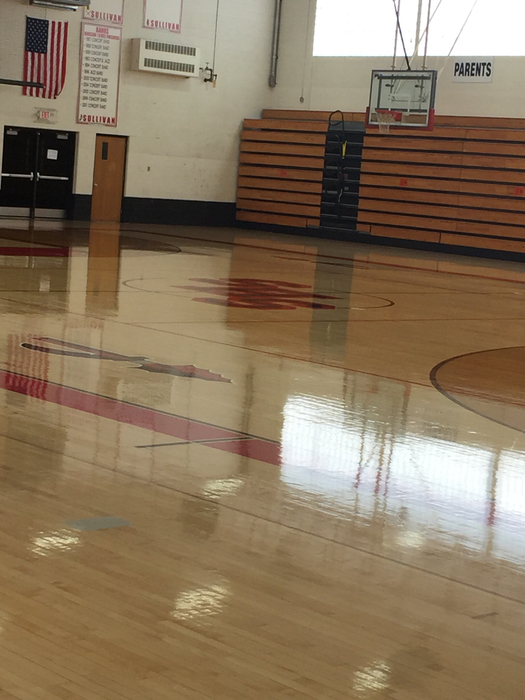 A nice shine on the SHS Gym Floor! Anyone want to help change a lightbulb? Kevin Landrus takes it to a whole new level. The official start days for our high school sports and activities this fall are as follows: Monday August 7th: Football and Golf may begin Wednesday August 9th: Volleyball, Cross Country, and Girls Swimming may begin Prior to participating, students must be registered and have a current sports physical on file with the high school office. 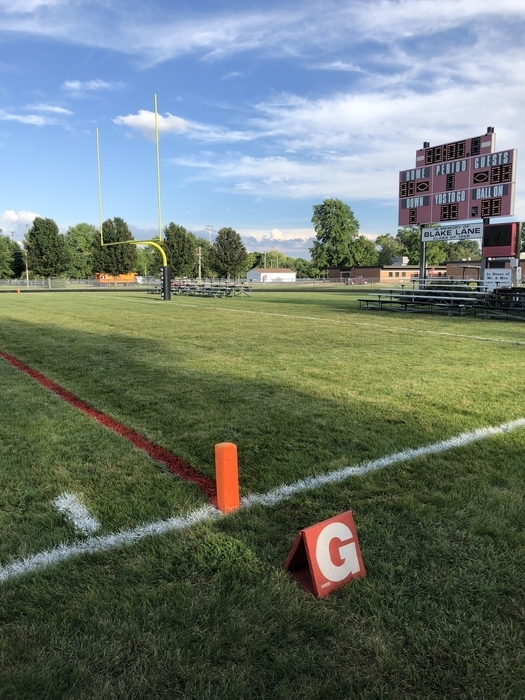 For activities such as Marching Band/Color Guard and Football Cheer, students must be registered and have a current sports physical on file with the high school office by Wednesday August 9th before participating any further. Kevin Landrus, Michael Puyear, Brian Dow, and Khayman Vanloon are giving the concession stand a much-needed new roof. Luke Boyle, Kaitlyn Snelling, and Alexis Britton have been helping as well. 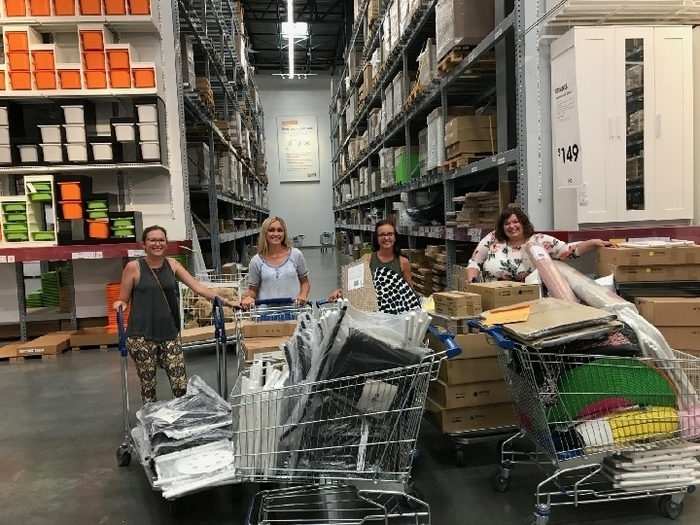 5th Grade teachers made a trip to IKEA to purchase furniture for the "flexible seating" to be used in their classrooms, courtesy of a grant from the Sullivan Community Education Foundation. 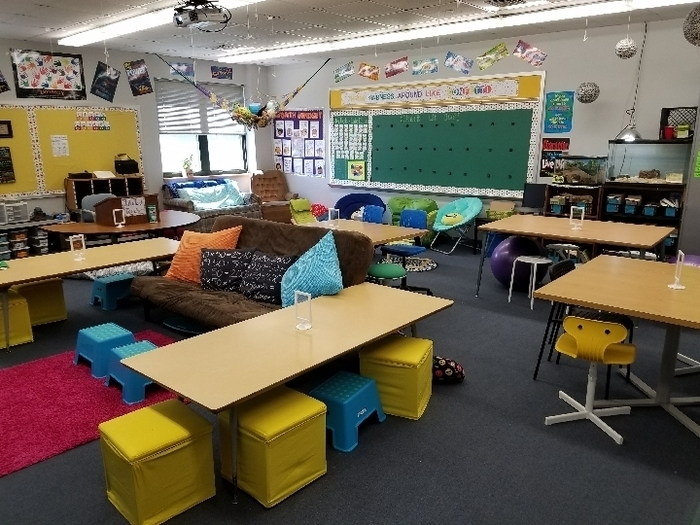 Flexible seating allows for a more comfortable environment than the traditional classroom and has been linked to improved academic performance. 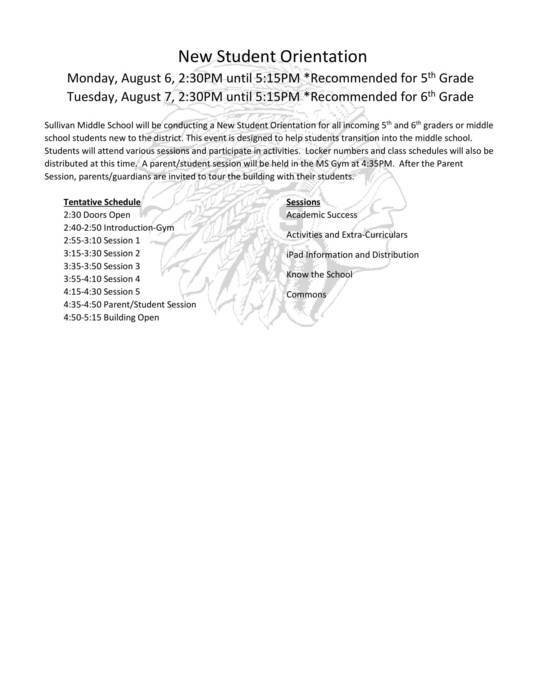 Reminder that 6th Grade Orientation will take place on Thursday, August 10th, at 2:30 pm. Reminder - District-wide registration for the 2017-2018 school year is this Thursday from 12PM-7PM at Sullivan High School. 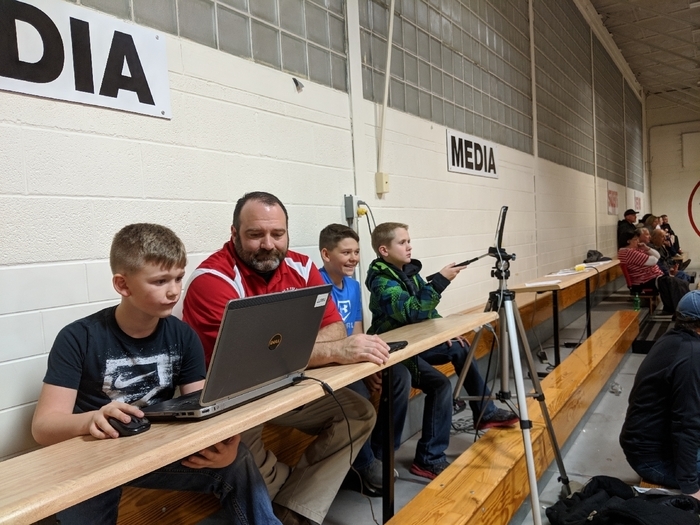 You may see Mark Waelde at ballgames running a camera for viewing on "The Cube," going from building to building to troubleshoot technology issues, or working with students to build their technological knowledge base. He is always willing to jump in wherever he sees help needed. Regardless of what he is doing, Mark is an incredible asset for CUSD #300. 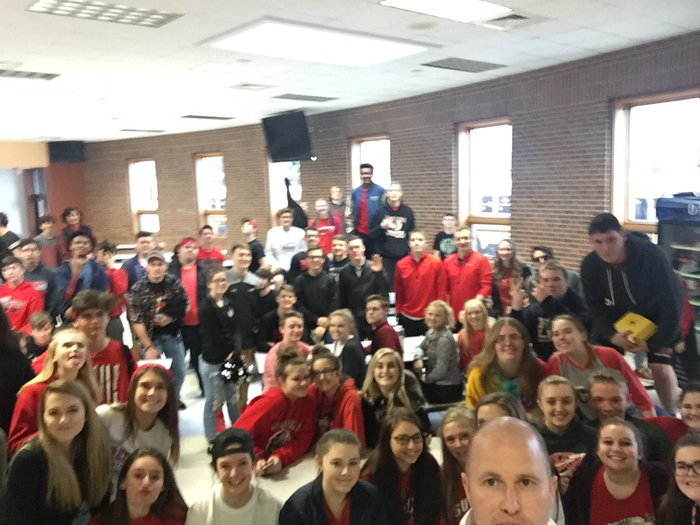 Thanks for all you do Mr. Waelde! A great opportunity for prospective teachers! We currently have a 2nd Grade position open at Sullivan Elementary School. If you are interested in working in a fun, positive, and caring environment, apply today! You must have a valid Illinois professional educator license endorsed in elementary education. Applications will be accepted through Friday, July 28. To apply, please email cover letter, resume, transcripts, and letters of reference to allend@sullivan.k12.il.us. 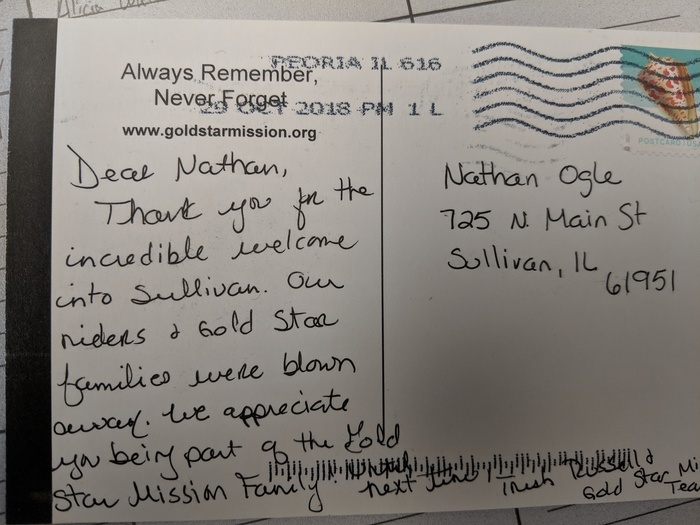 Materials can also be mailed to Daniel Allen, Principal, Sullivan Elementary School, 910 North Graham Street, Sullivan, Illinois 61951 or faxed to (217)728-4399.